This car didn’t meet it’s reserve price at auction, and so didn’t sell. 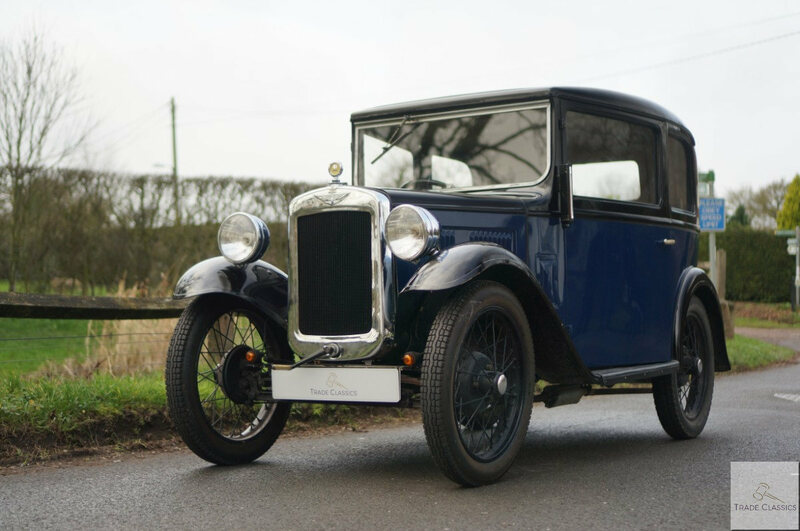 If you are interested in the car, then call us on 01926 426 635 to discuss further. 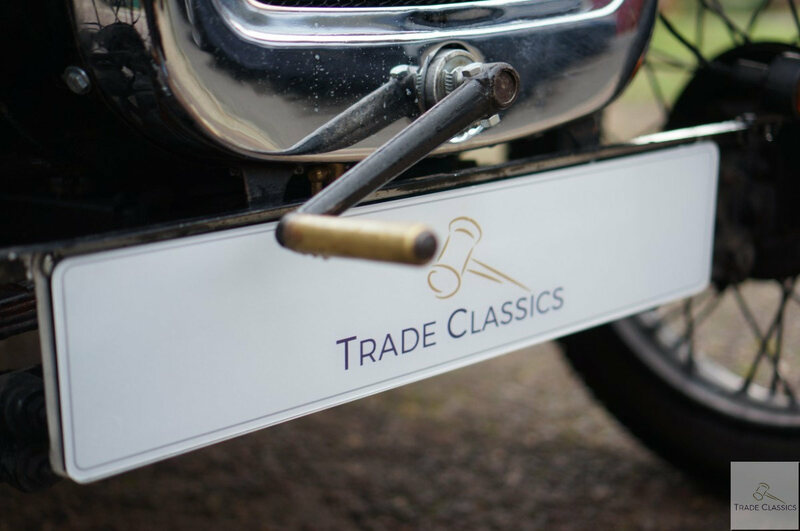 Bidders – please read the How it Works page for more information on how to register and place a bid, and our Terms and Conditions of sale. 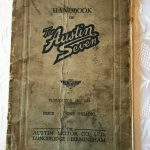 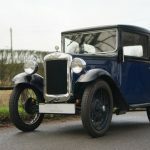 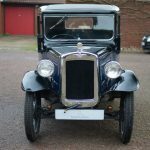 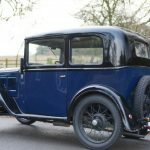 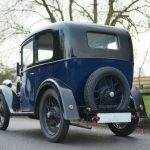 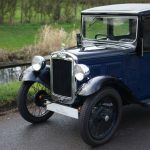 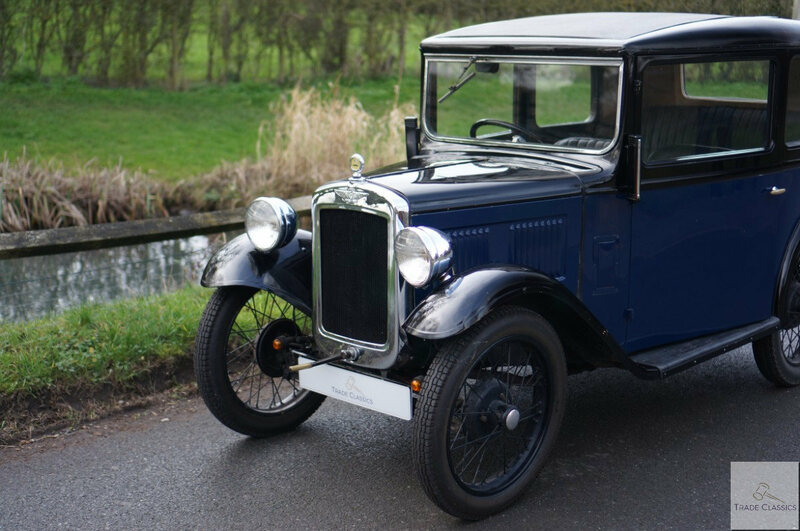 The Austin 7 is an economy car that was produced from 1922 until 1939 in the United Kingdom by Austin. 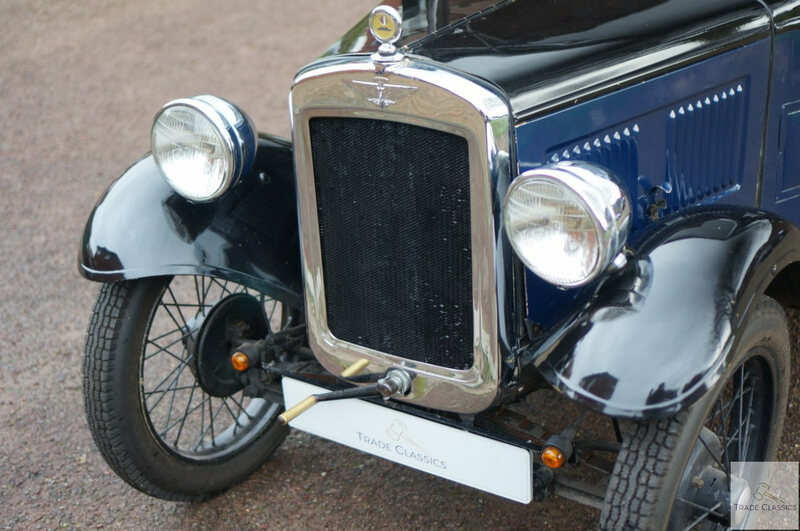 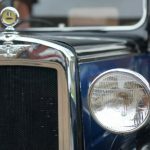 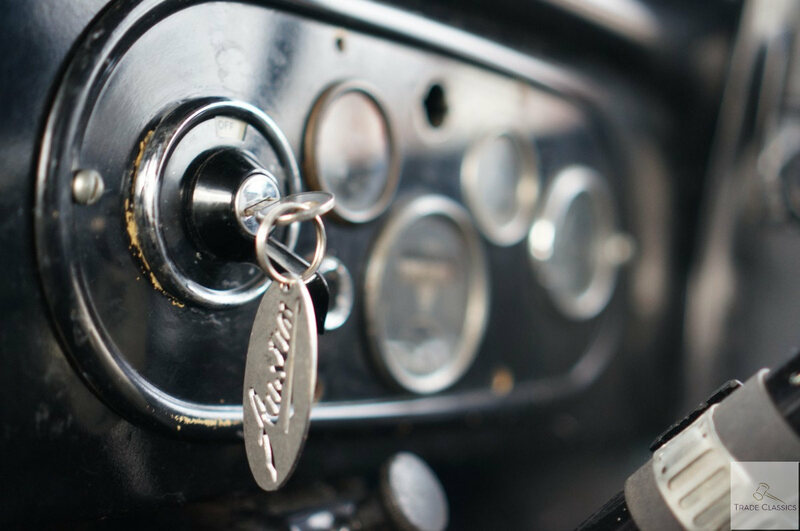 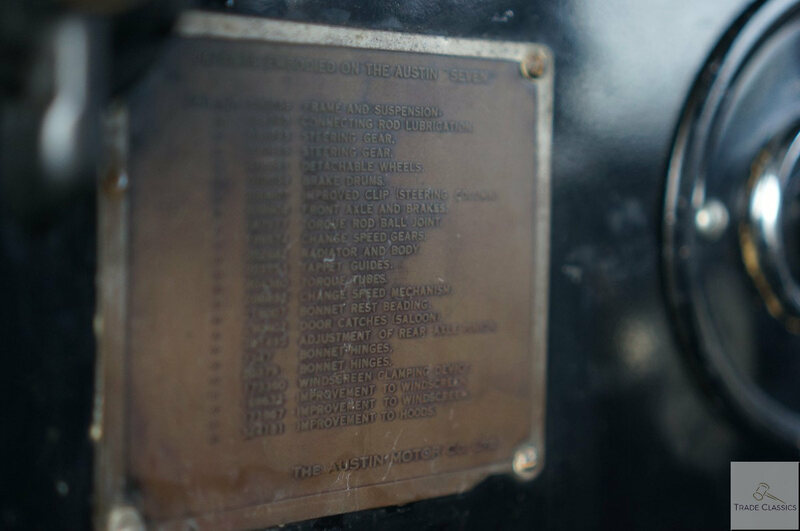 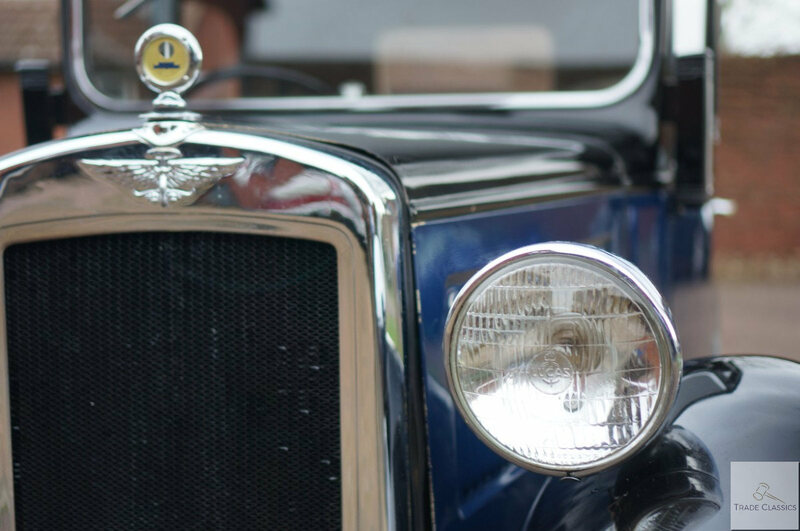 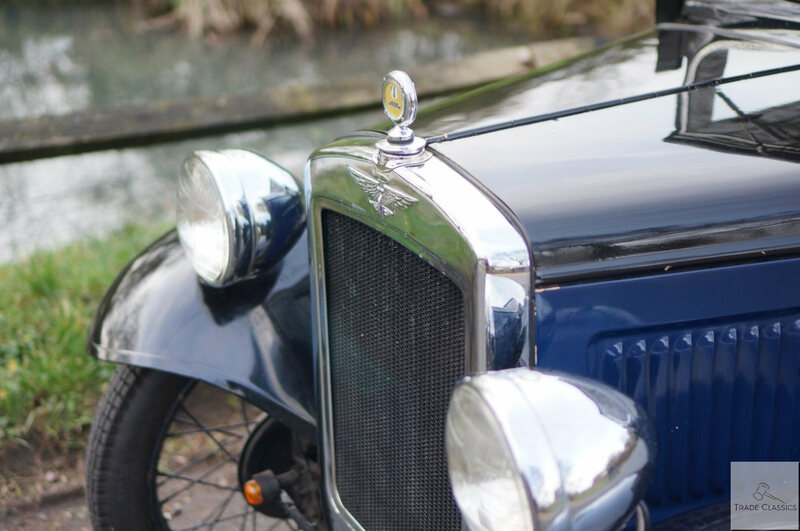 It was nicknamed the ‘Baby Austin’ and was at that time one of the most popular cars produced for the British market and sold well abroad. 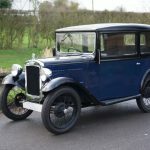 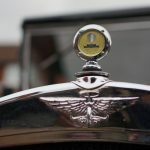 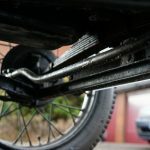 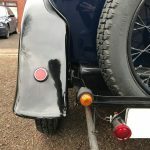 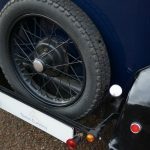 Its effect on the British market was similar to that of the Model T Ford in the US, replacing most other British economy cars and cyclecars of the early 1920s. 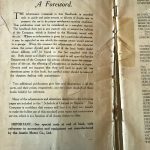 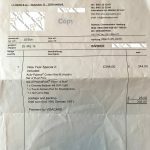 It was also licensed and copied by companies all over the world. 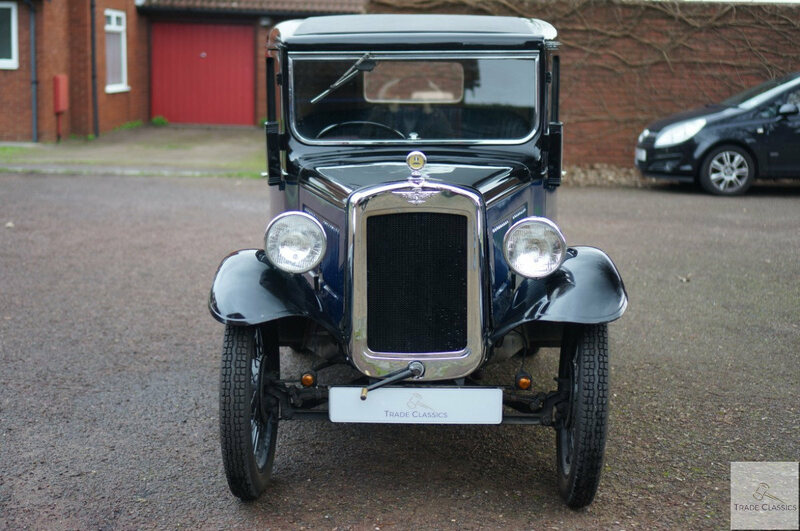 The very first BMW car, the BMW Dixi, was a licensed Austin 7, as were the original American Austins. 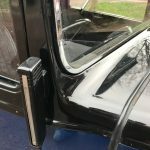 In France they were made and sold as Rosengarts. 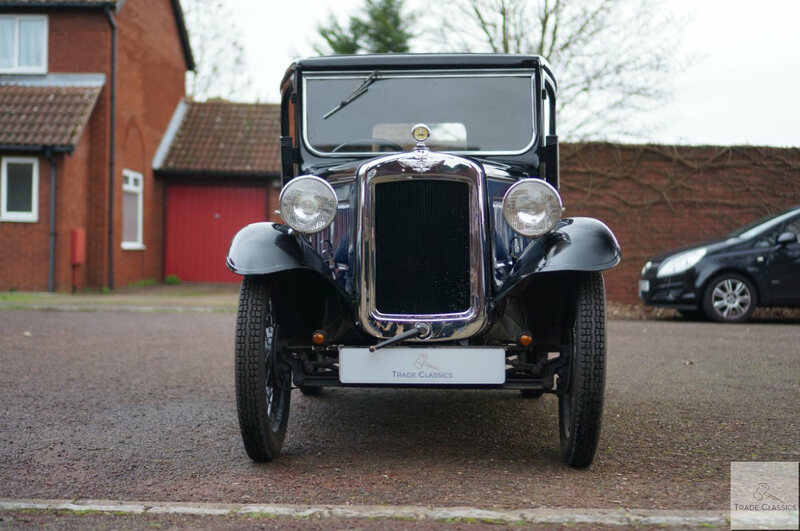 In Japan, Nissan also used the 7 design as the basis for their first cars, although not under licence. 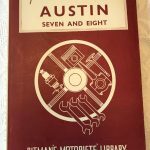 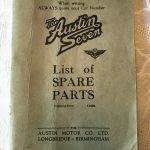 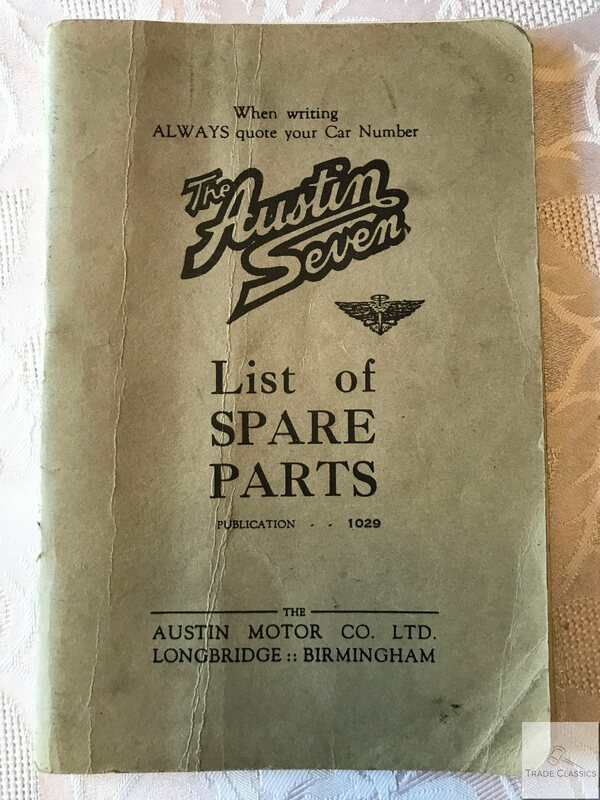 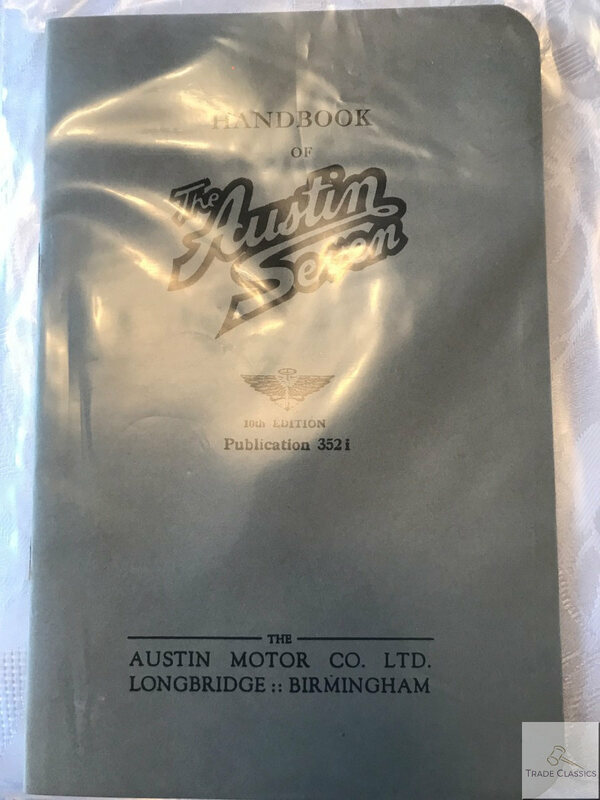 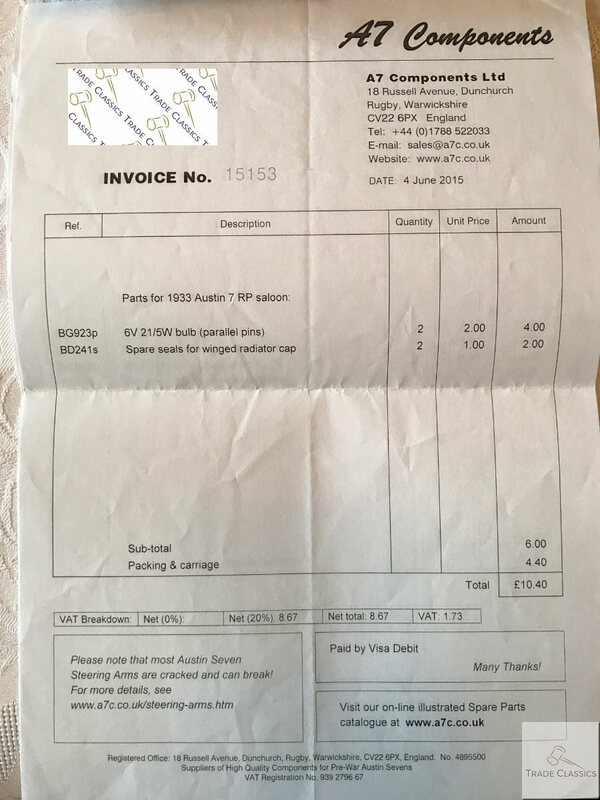 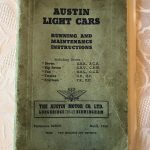 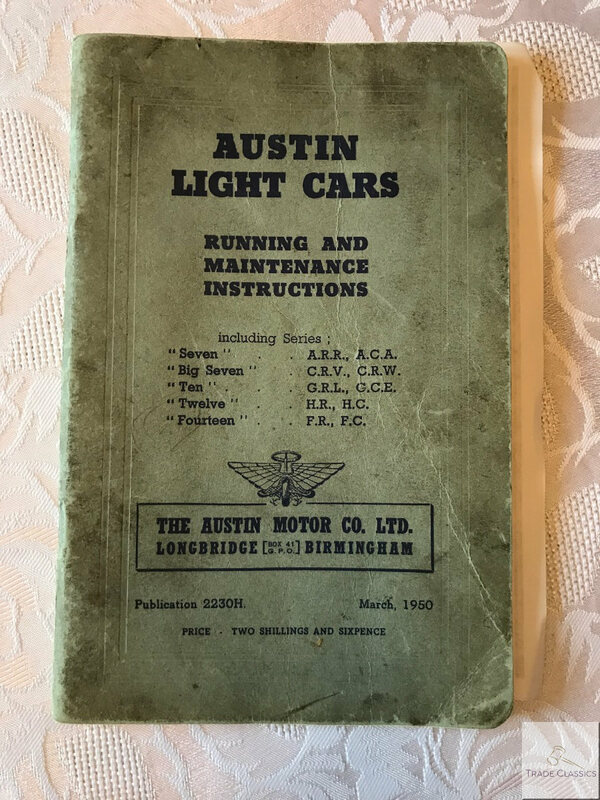 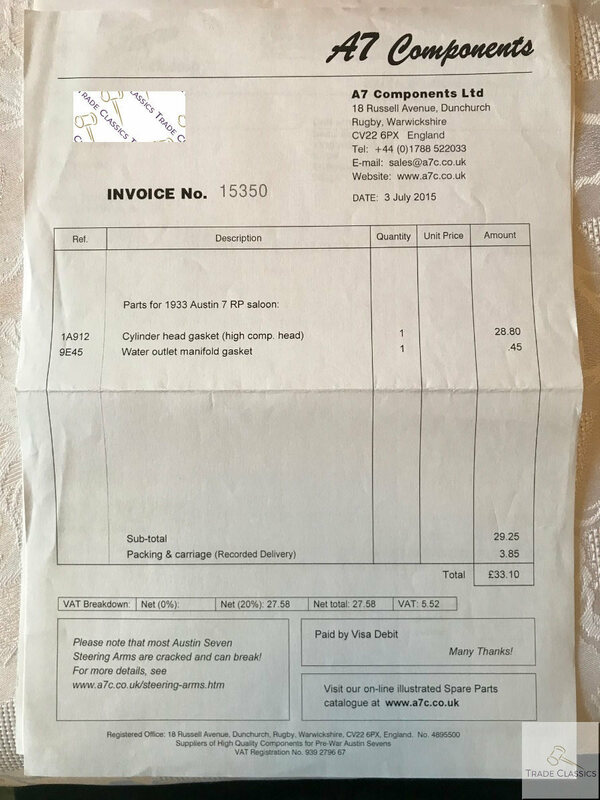 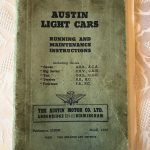 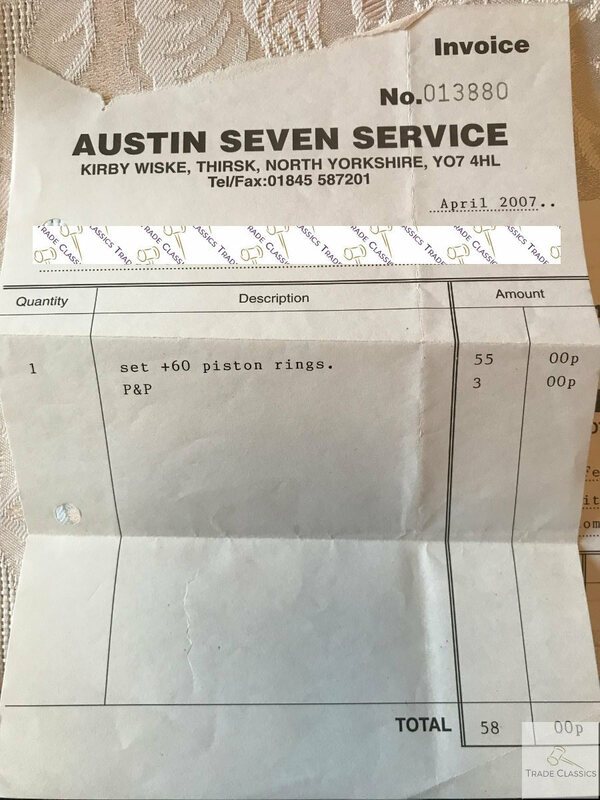 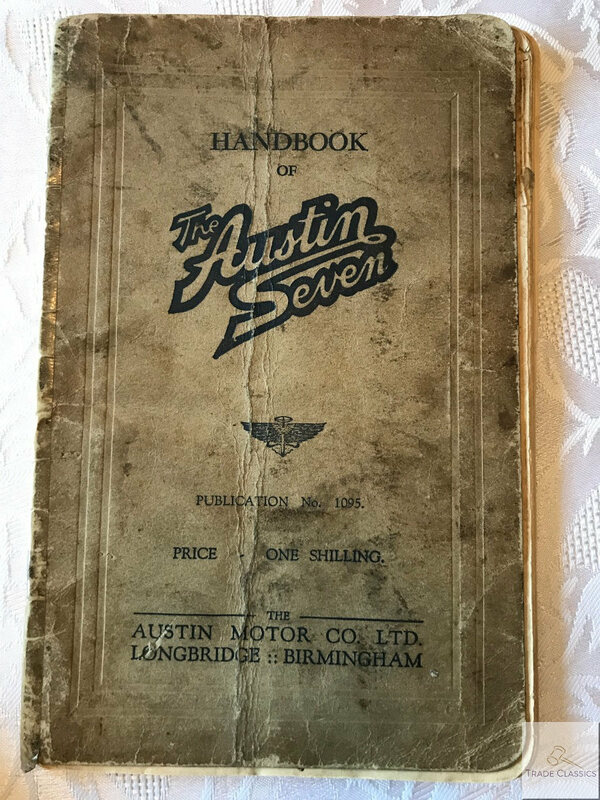 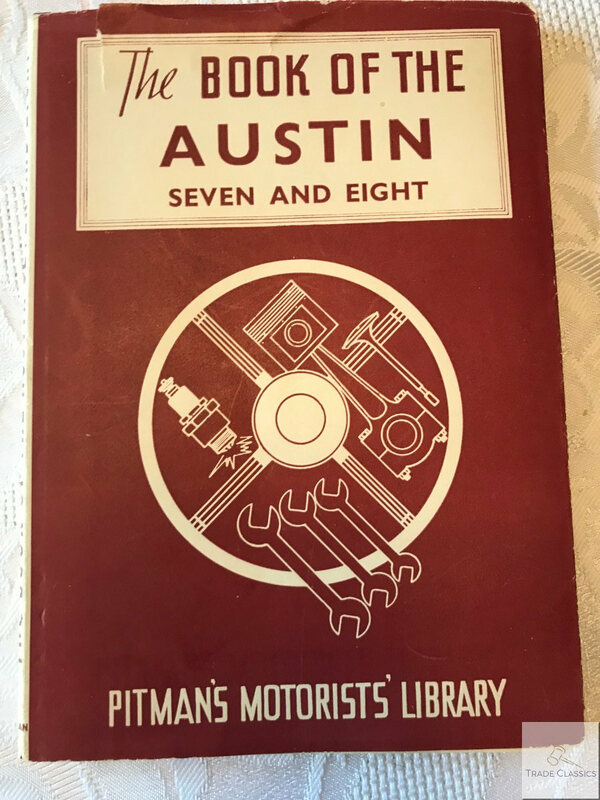 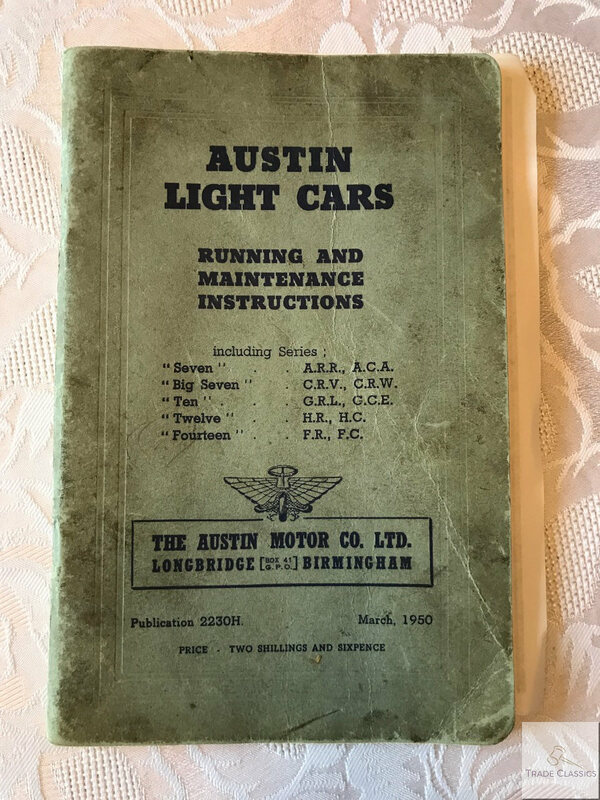 This eventually led to a 1952 agreement for Nissan to build and sell Austins in Japan under the Austin name. 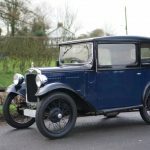 Many Austin 7s were rebuilt as ‘specials’ after the Second World War, including the first race car built by Bruce McLaren, and the first Lotus, the Mark I.
David has owned the car for around three years (he’s sitting in the back of the vehicle) and unfortunately is suffering from Alzheimer’s, so his children Neil and Louise have made the tough decision with him to sell his classic vehicles, and move them on to new custodians to enjoy and maintain. 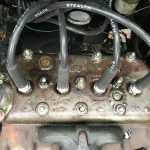 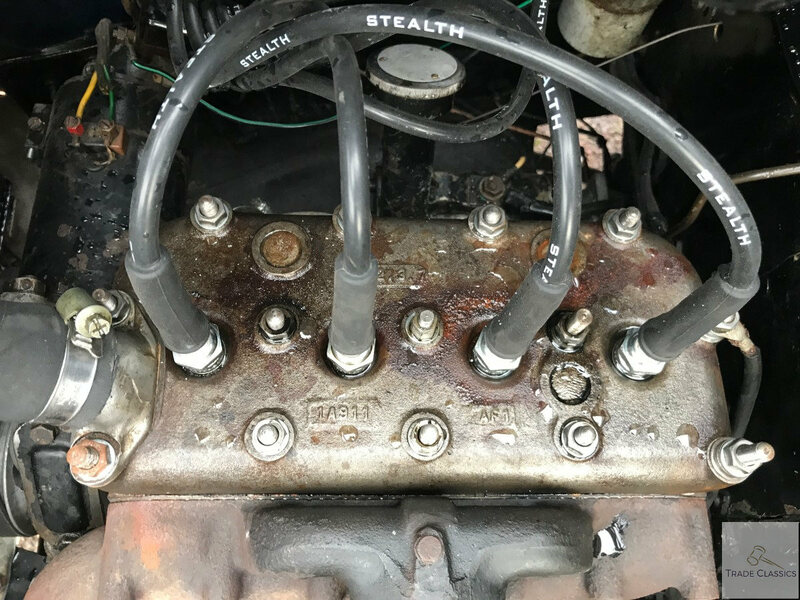 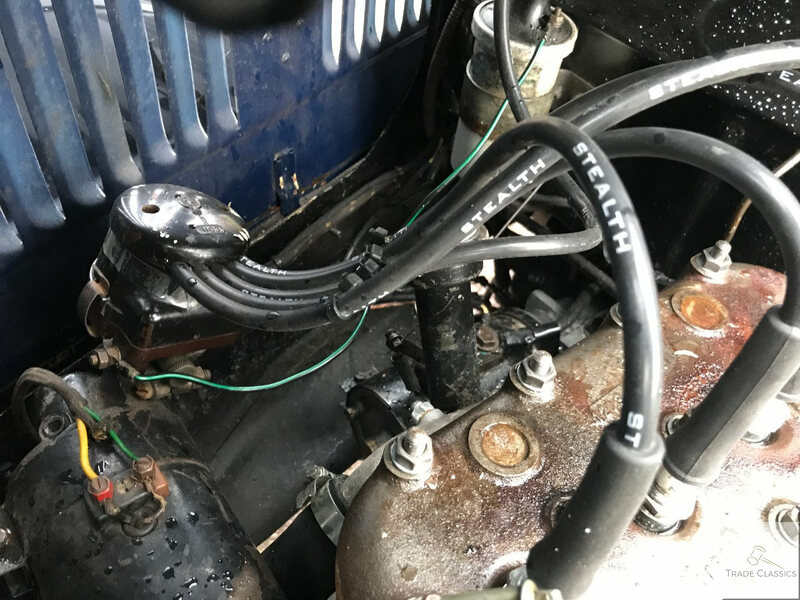 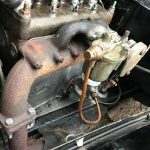 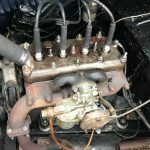 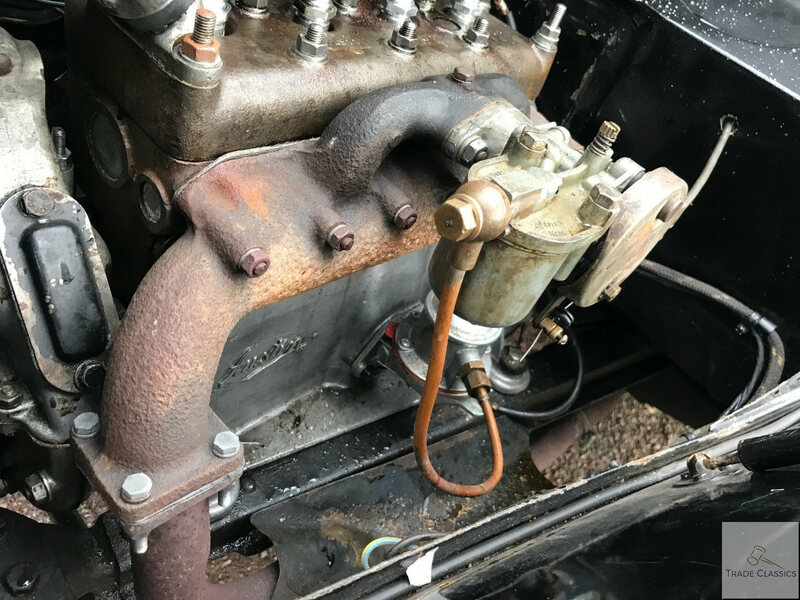 David has maintained the car over the three years and even had an engine rebuild completed to make sure it keeps running well. 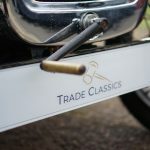 It’s a car that he’s always wanted, having been lucky enough to own a number of classic cars in the past he added this one to his collection too. 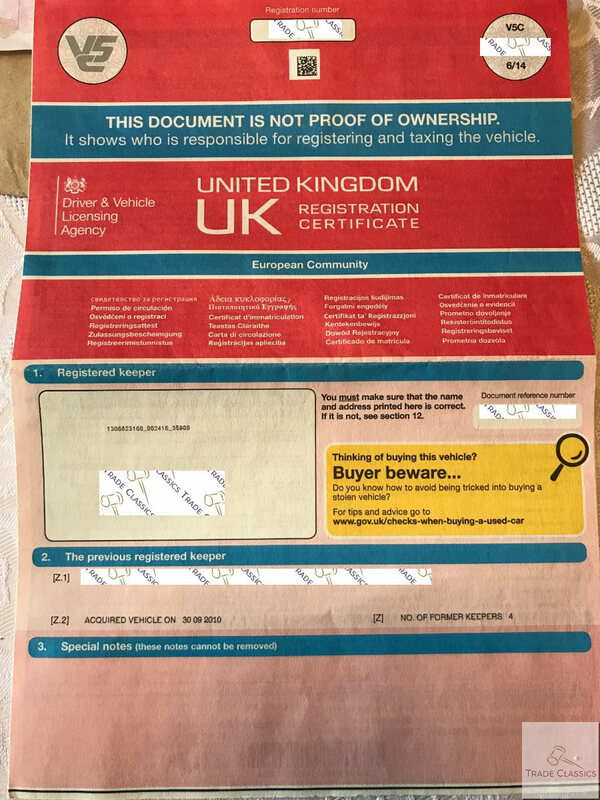 If you have any questions then please drop them in the comments below and Neil or Louise will answer as soon as they can. 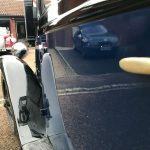 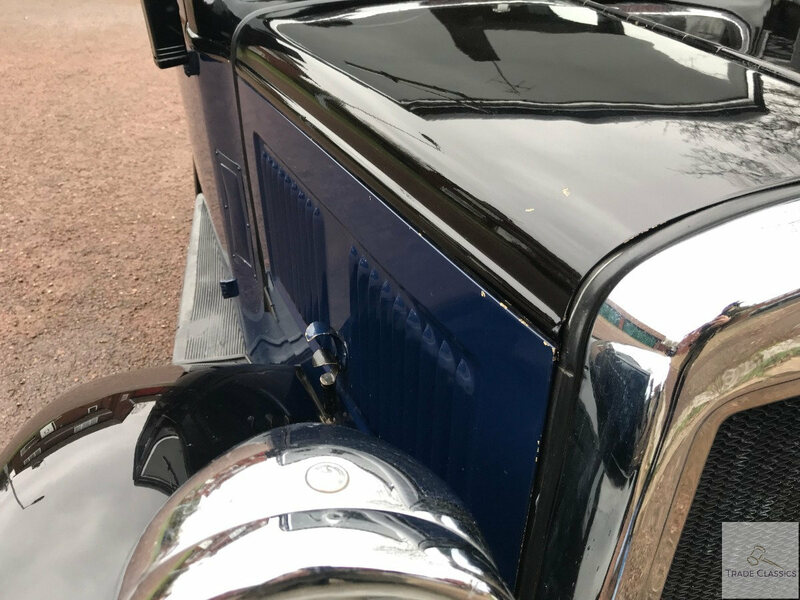 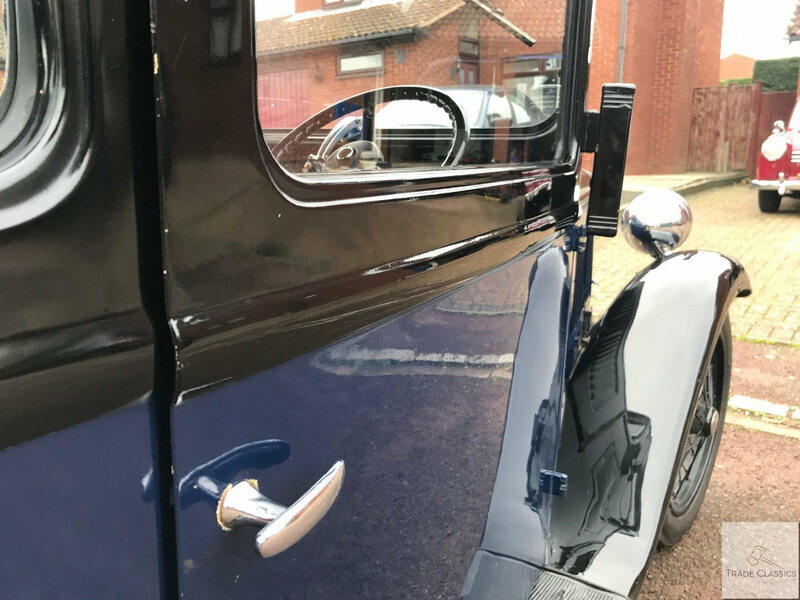 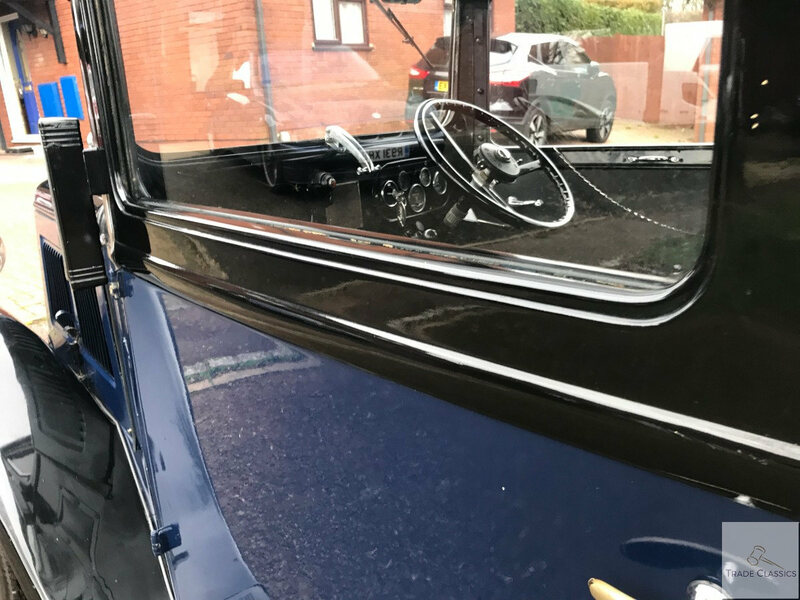 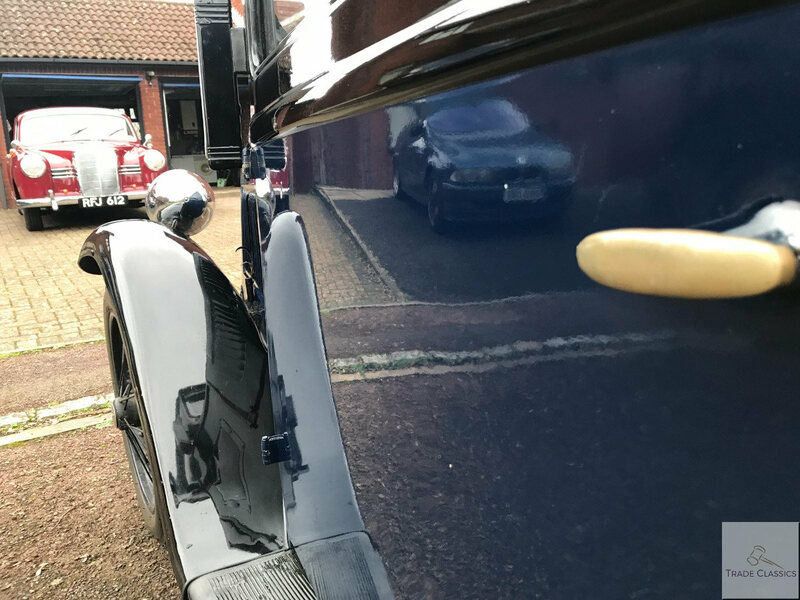 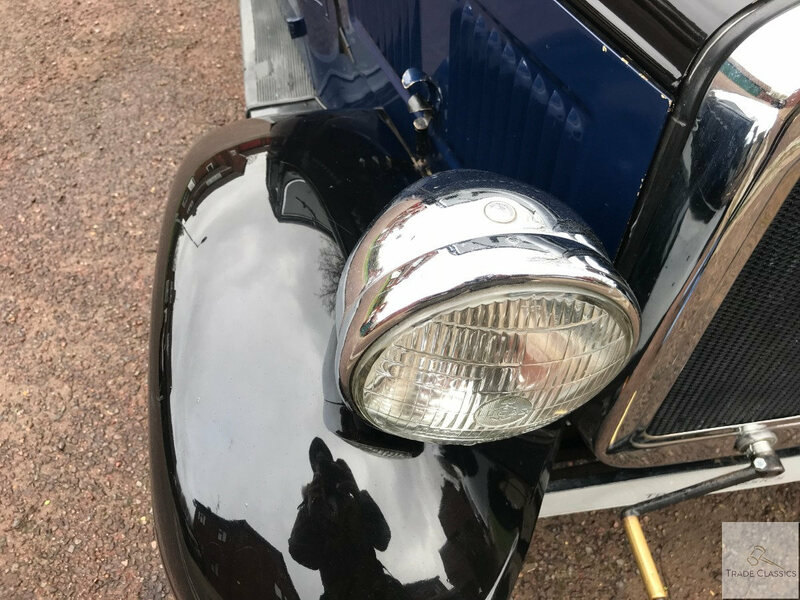 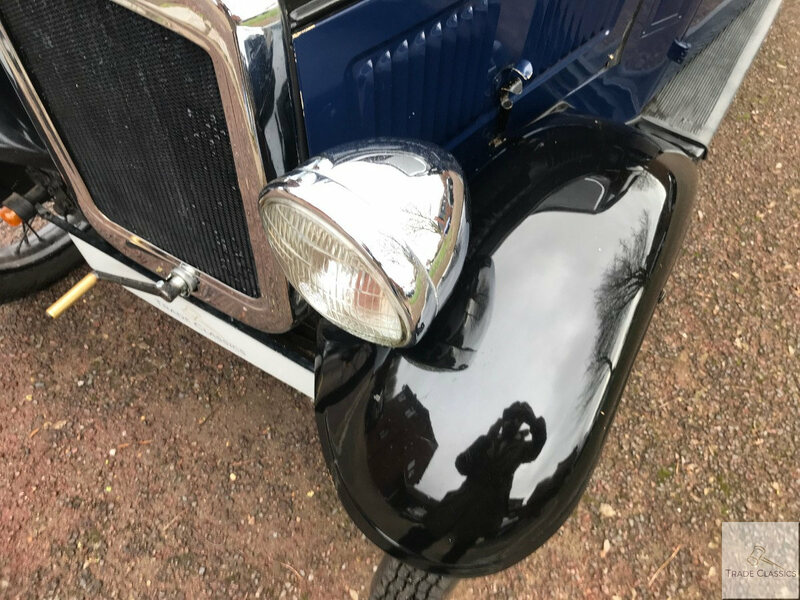 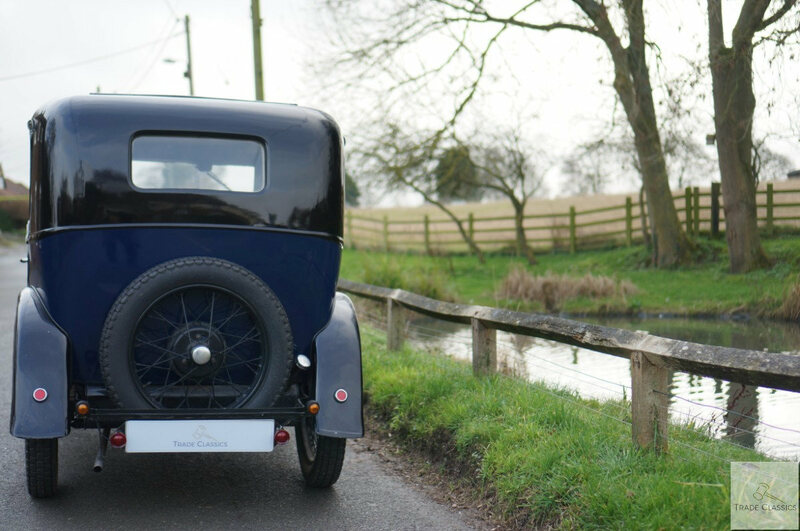 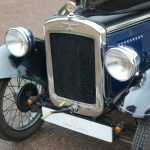 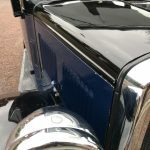 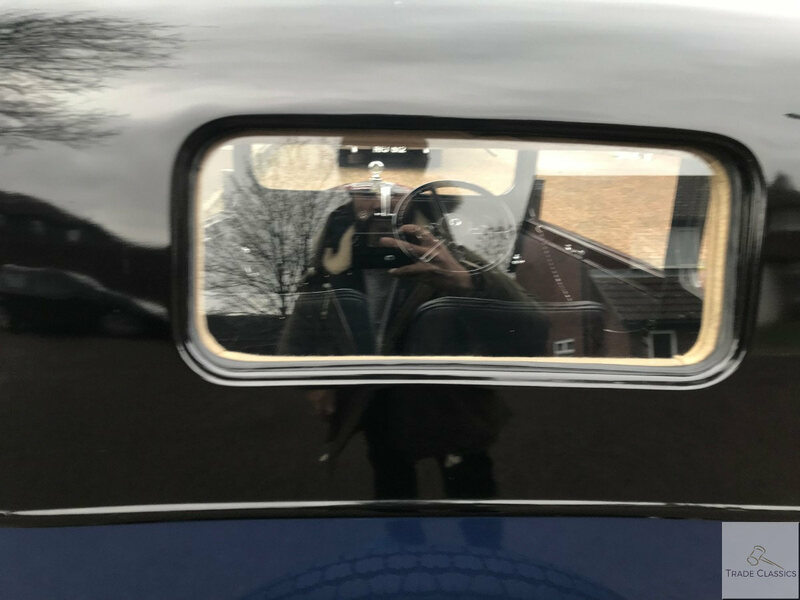 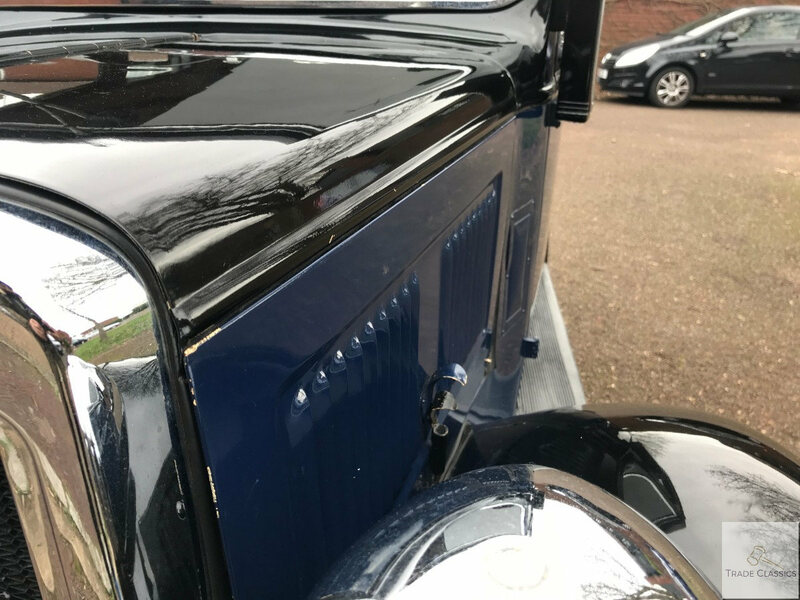 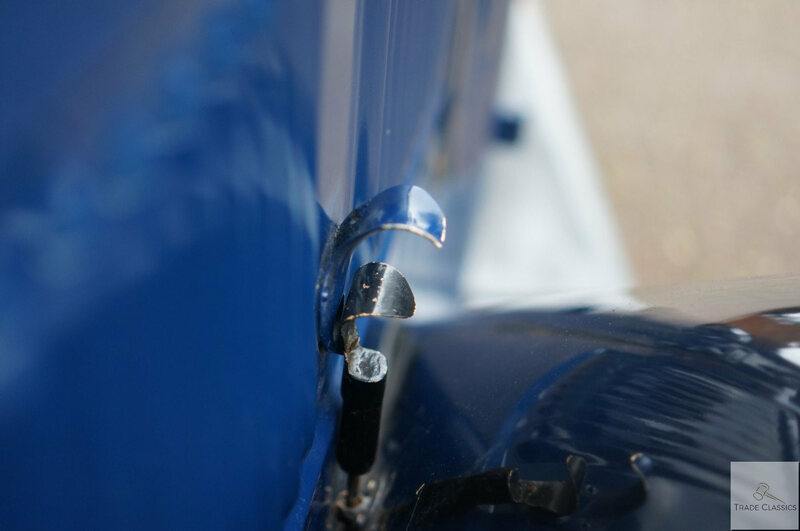 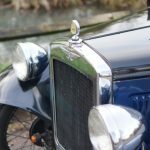 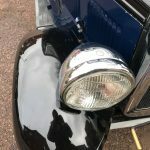 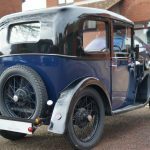 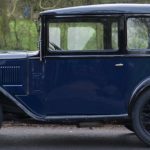 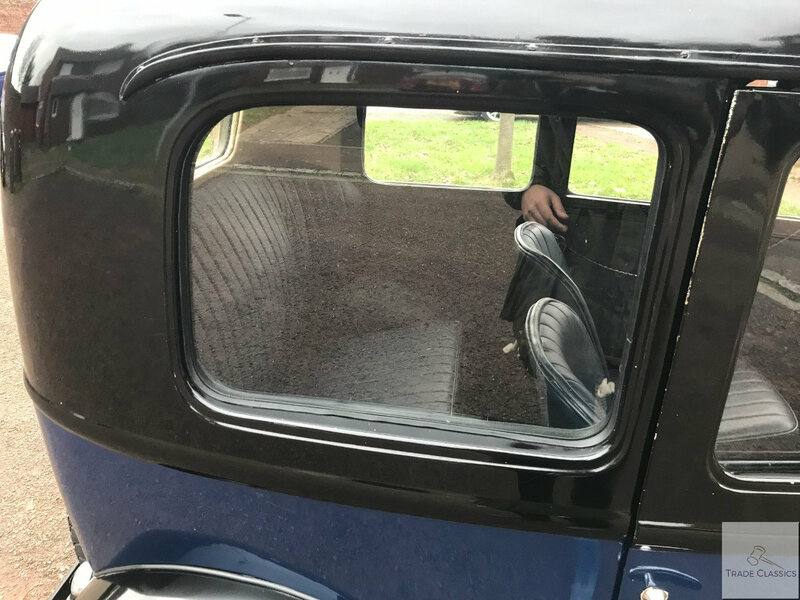 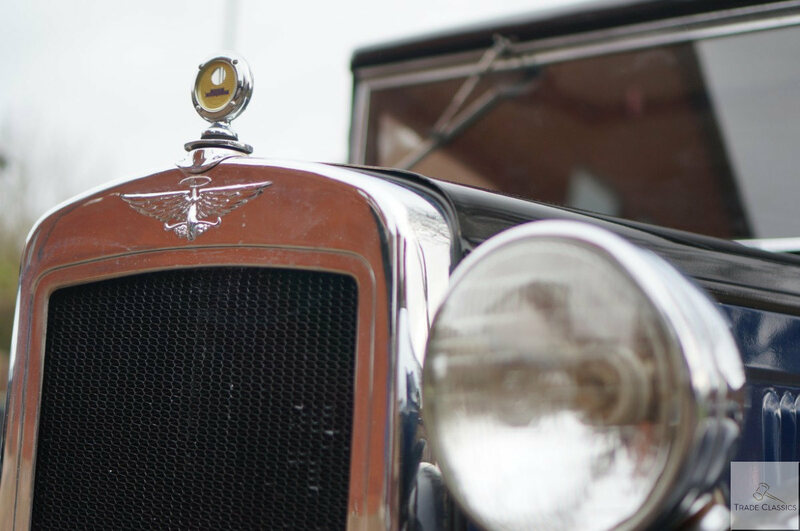 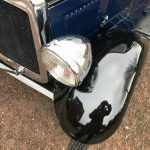 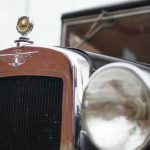 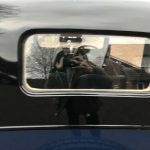 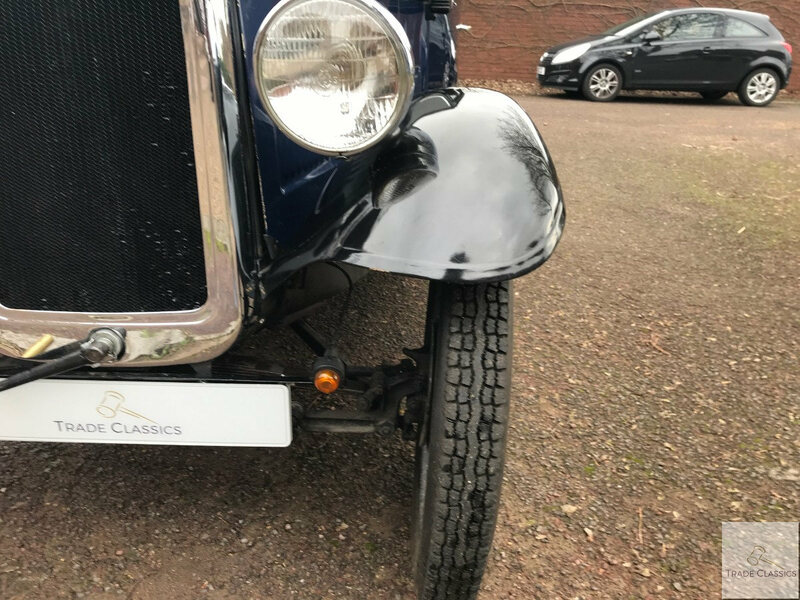 This car is an incredible 86 years old this year – and even after all these years she still looks beautiful in her blue coachwork in the winter sun. 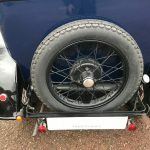 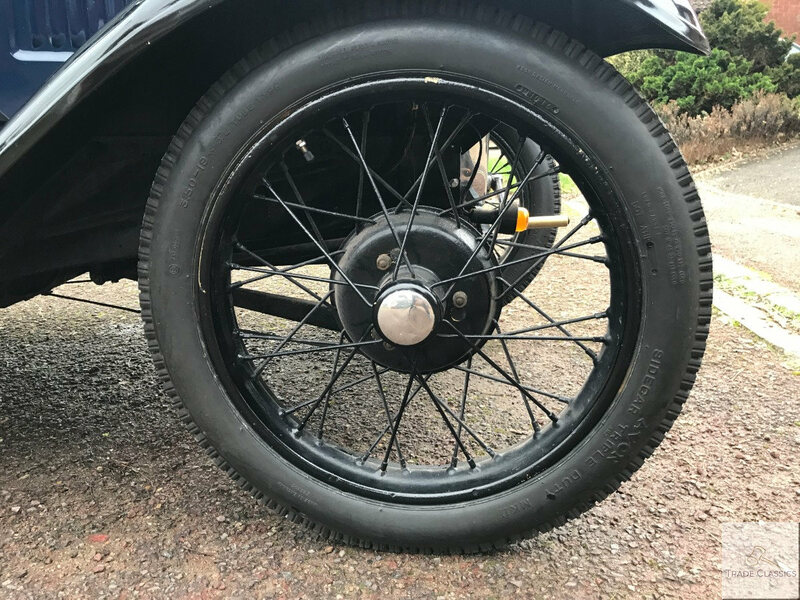 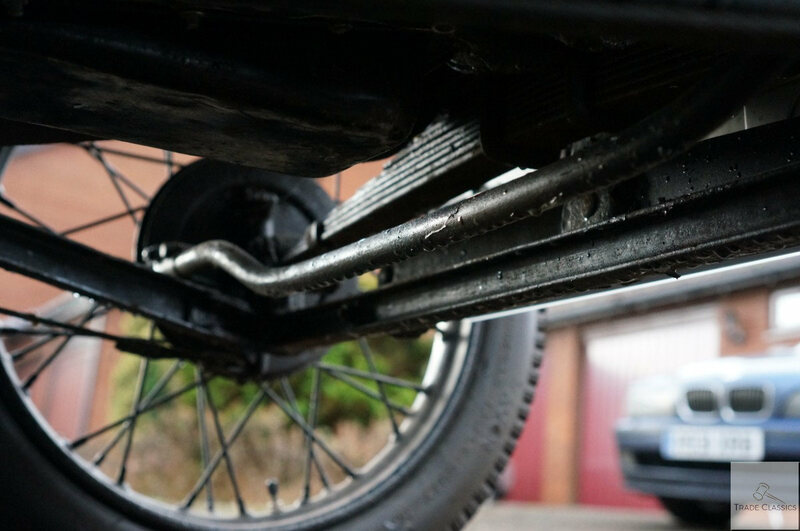 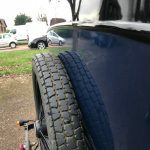 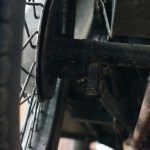 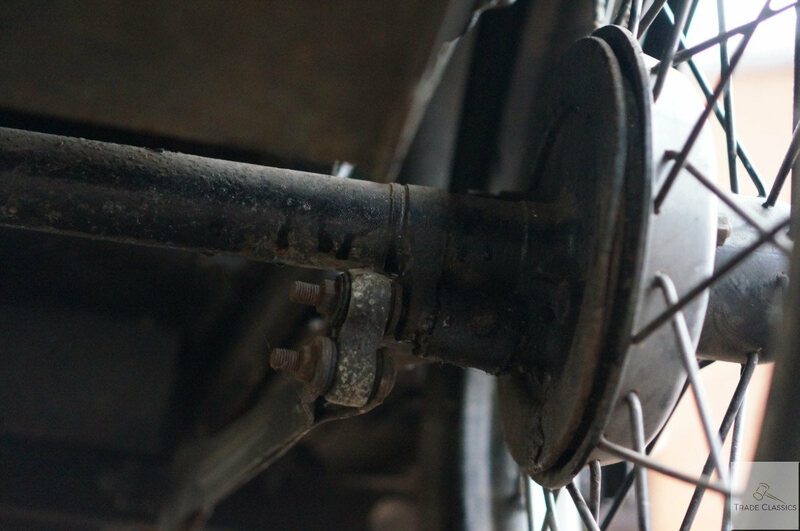 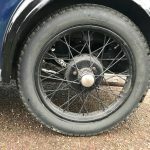 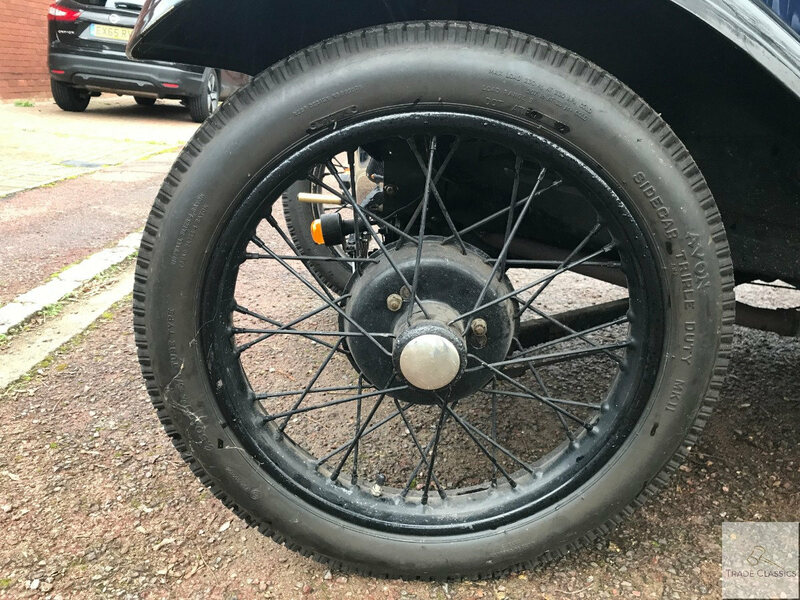 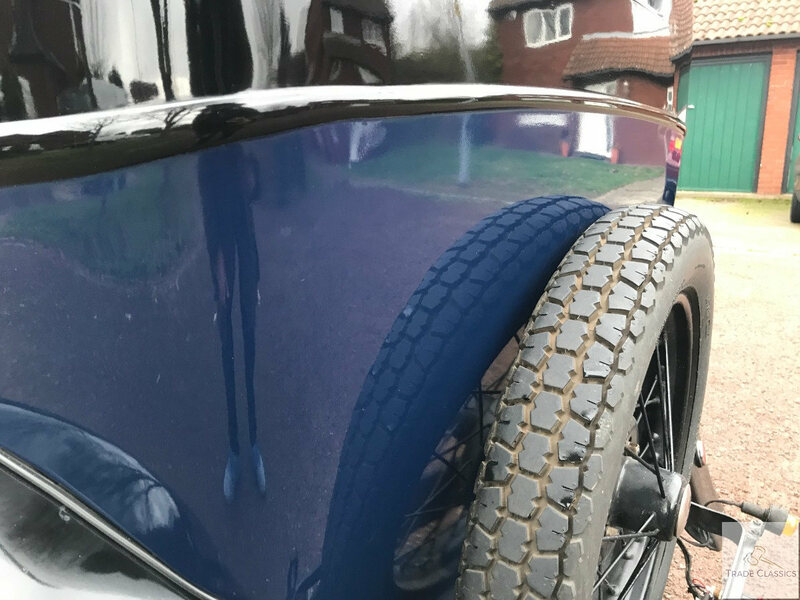 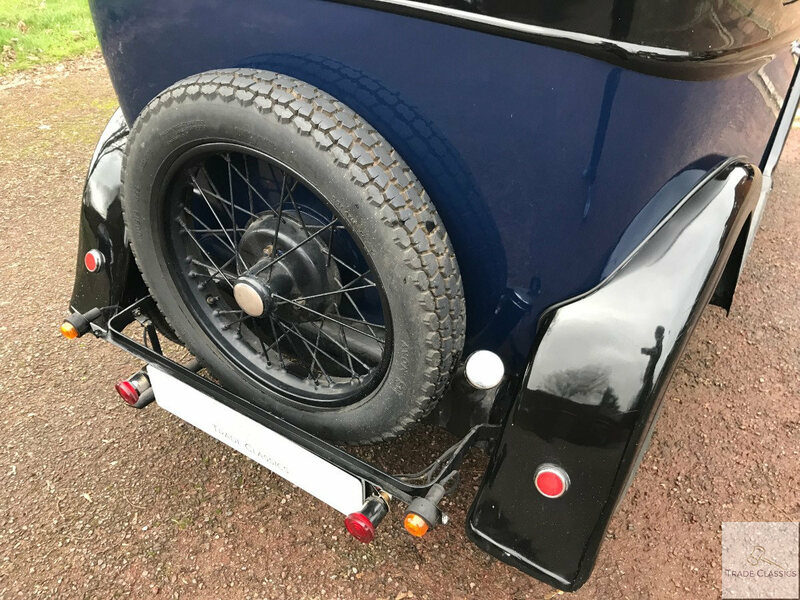 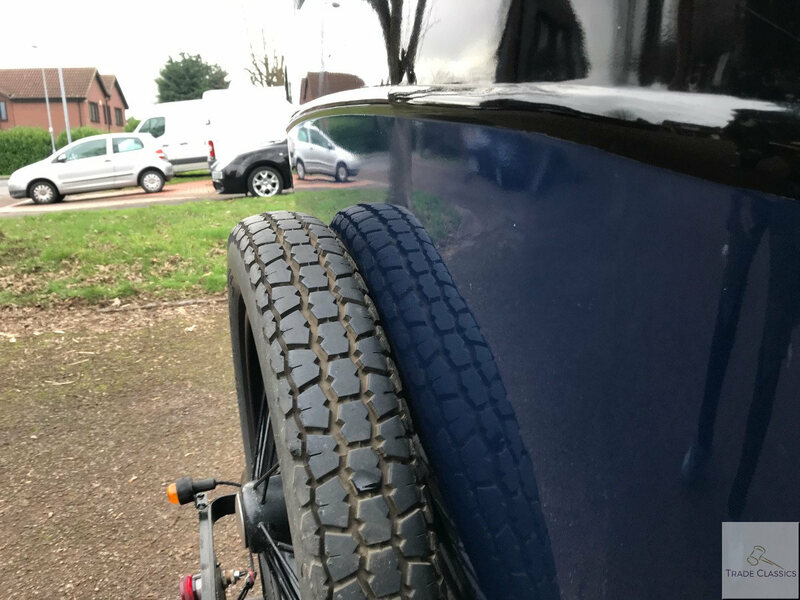 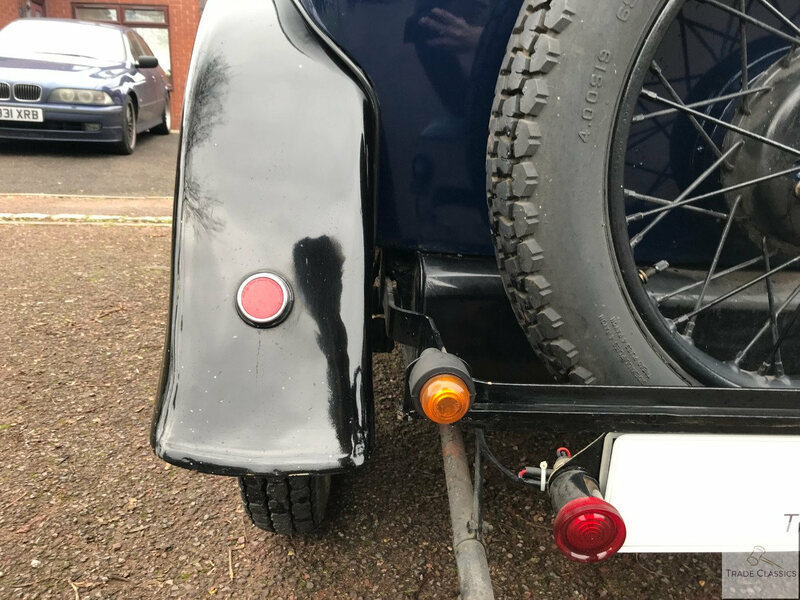 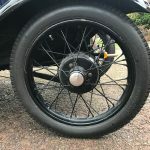 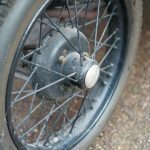 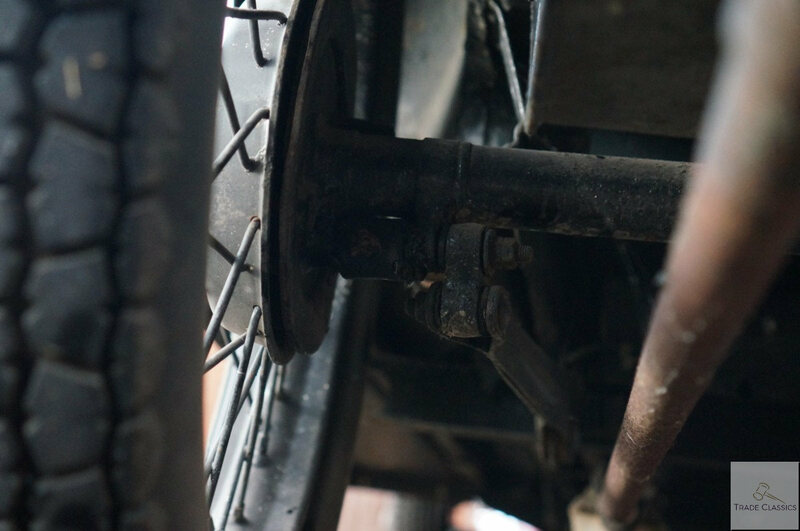 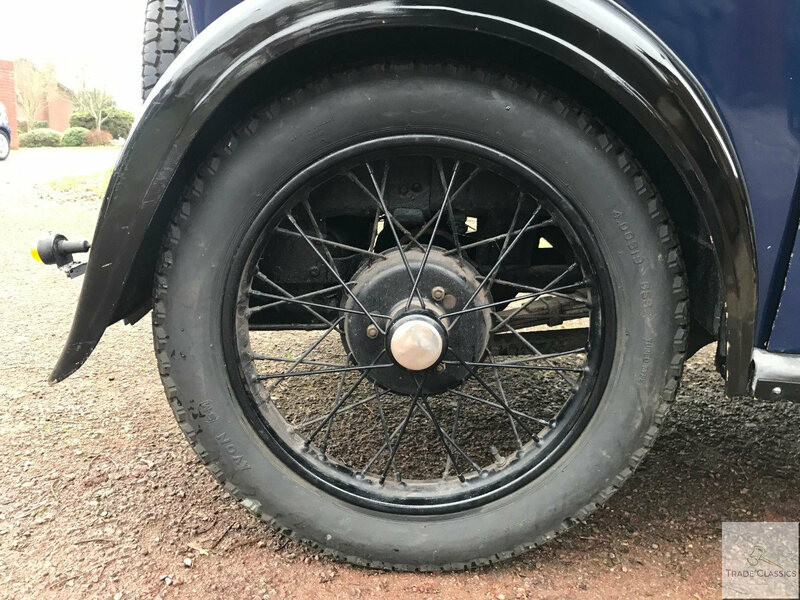 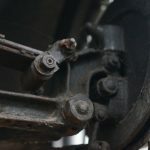 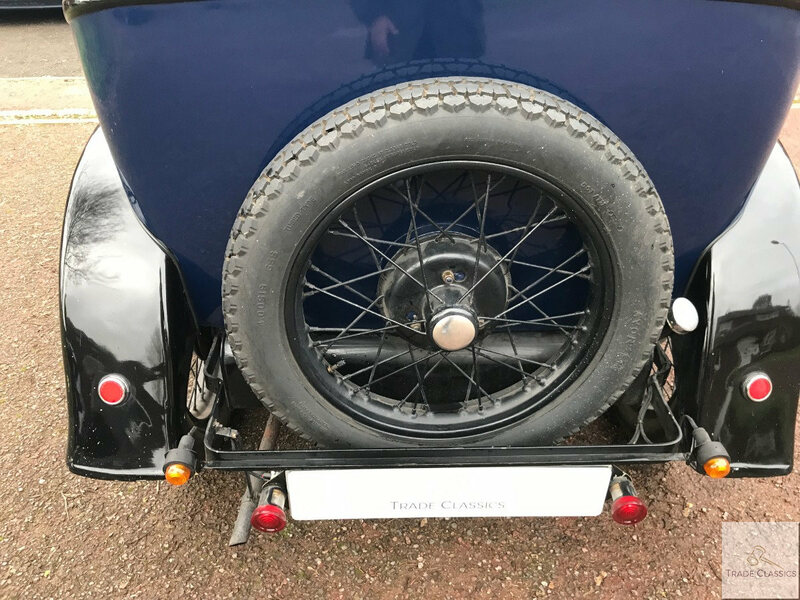 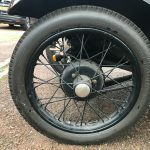 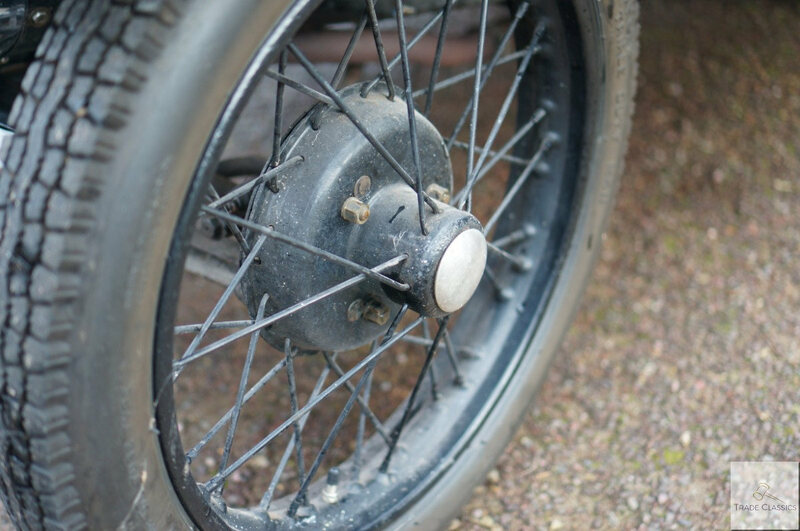 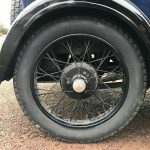 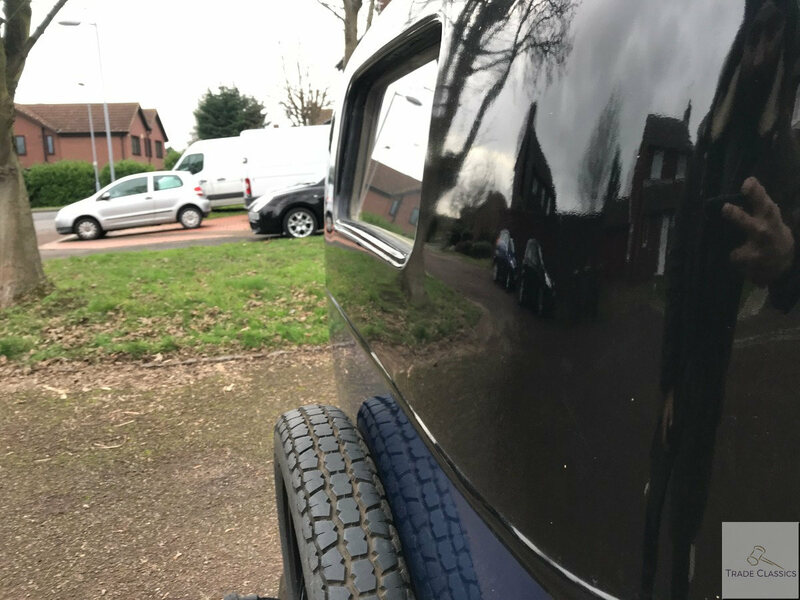 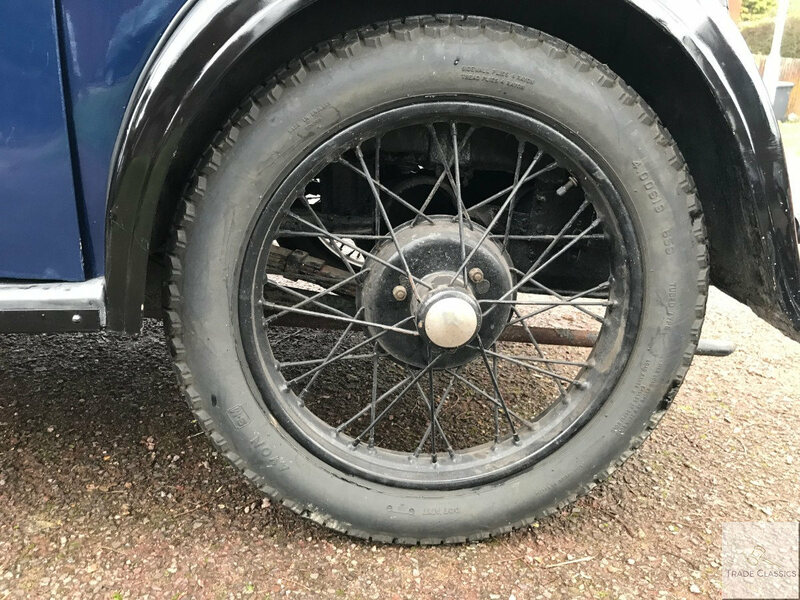 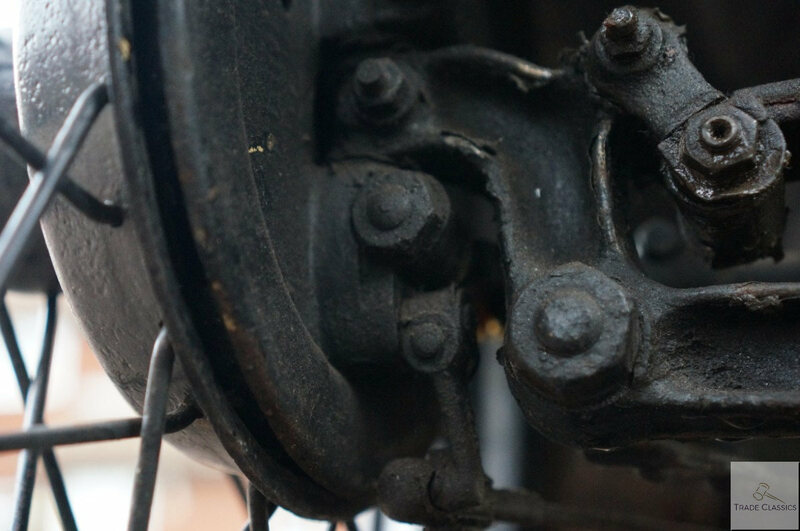 Original wire wheels are fitted with cross-ply tyres showing a good level of tread – please see the images and videos for condition. 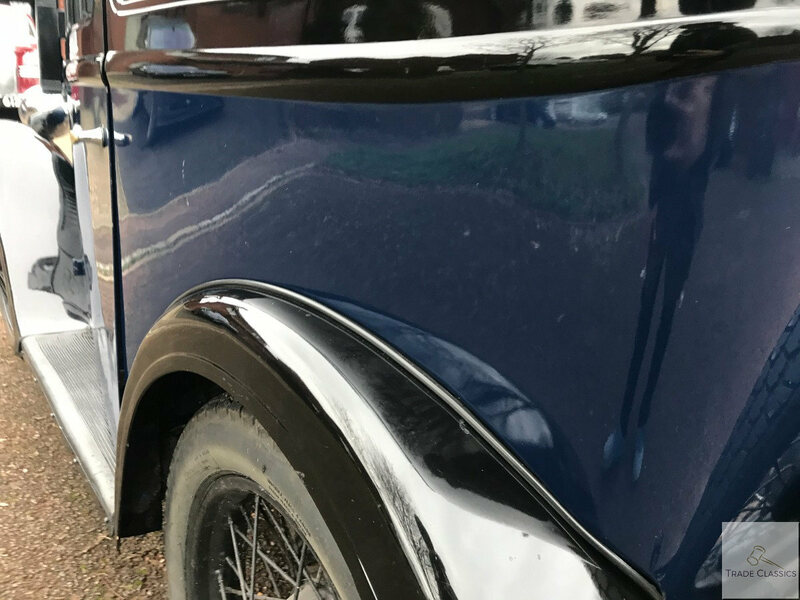 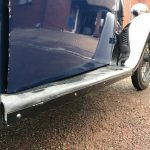 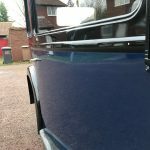 The bodywork on the car is in good condition considering her vintage status. 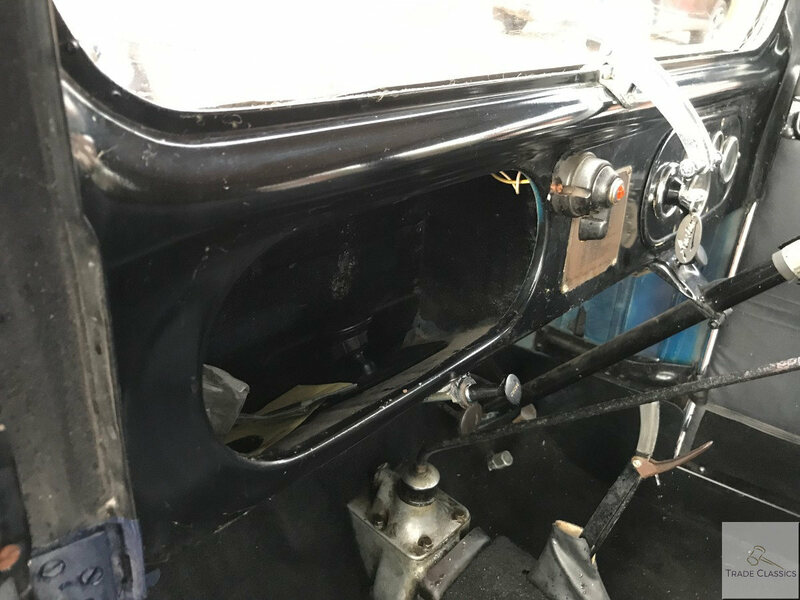 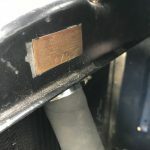 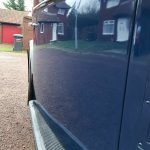 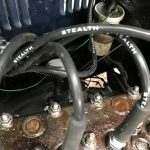 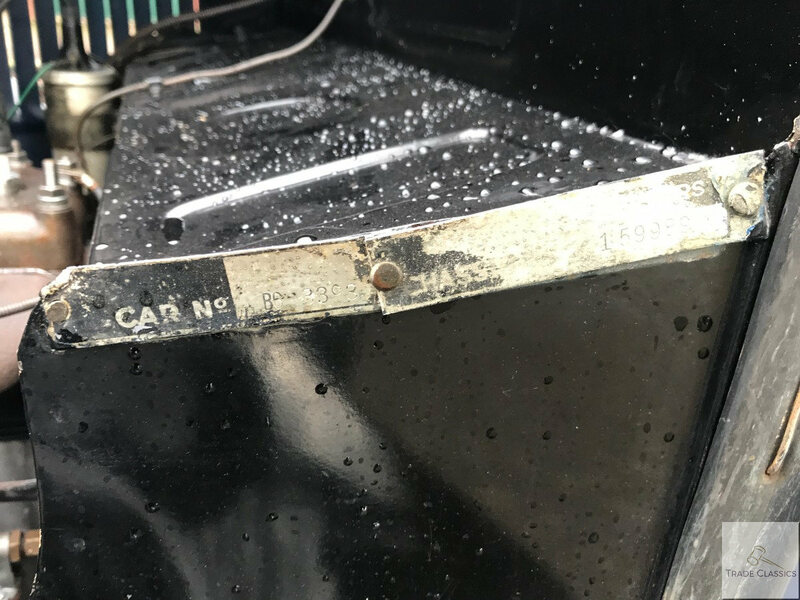 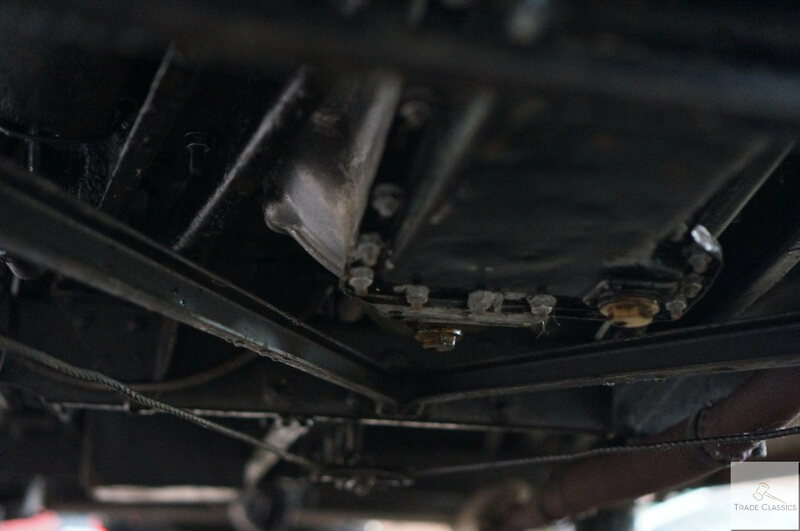 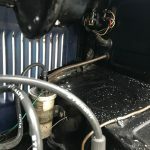 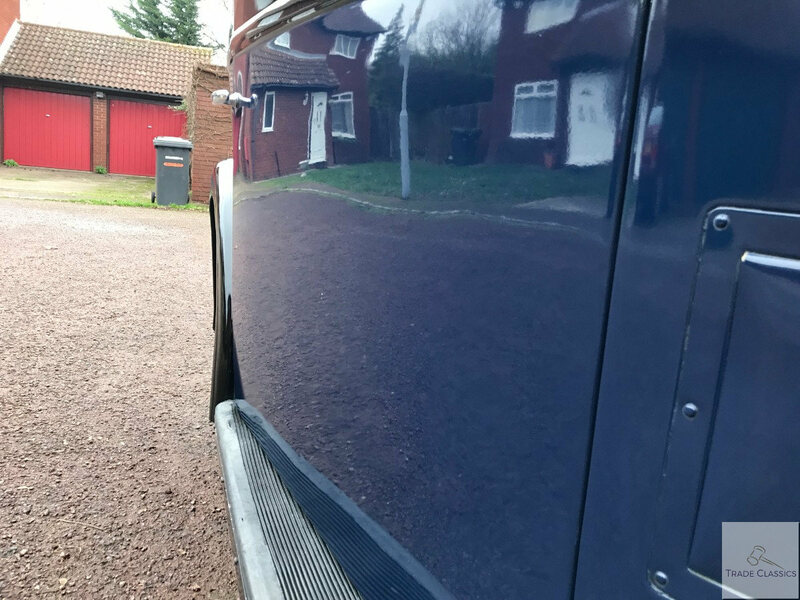 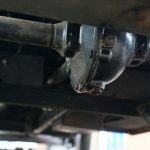 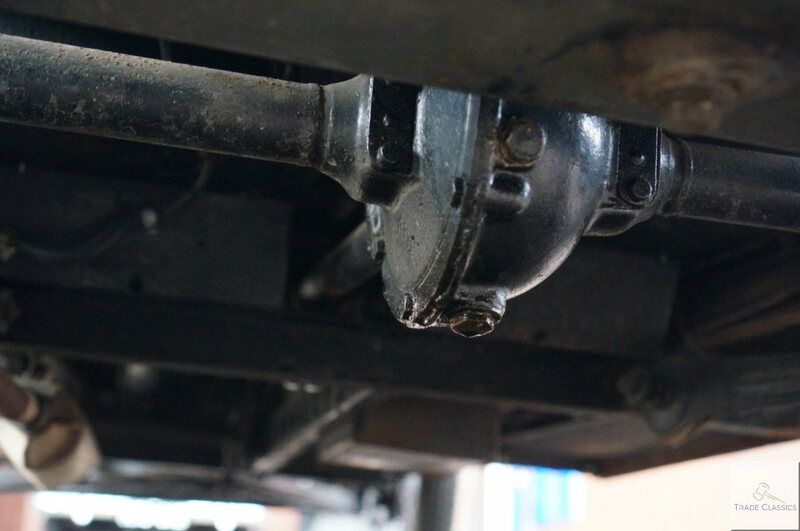 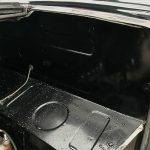 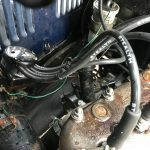 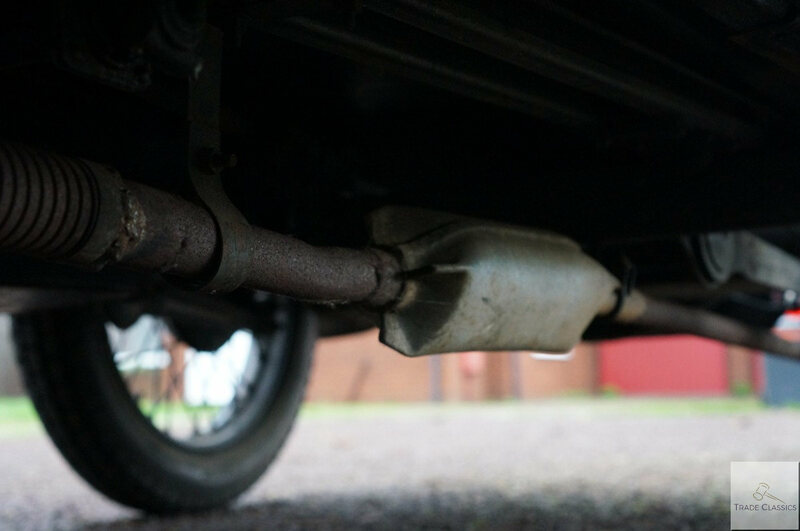 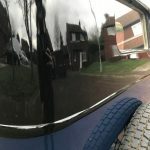 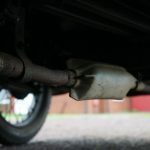 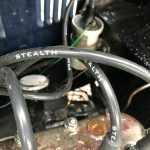 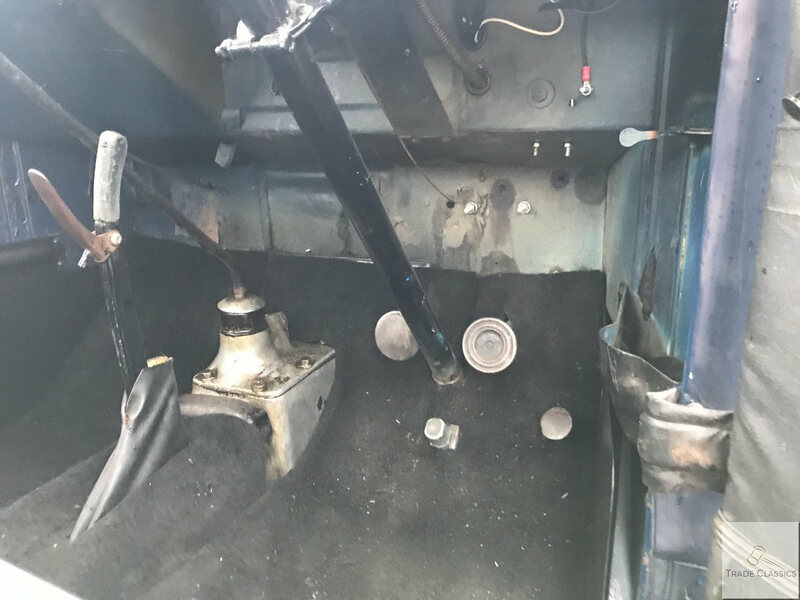 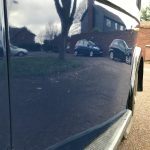 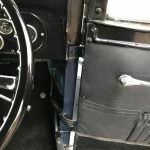 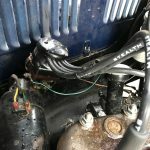 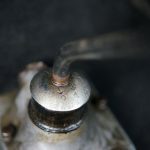 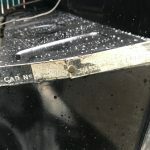 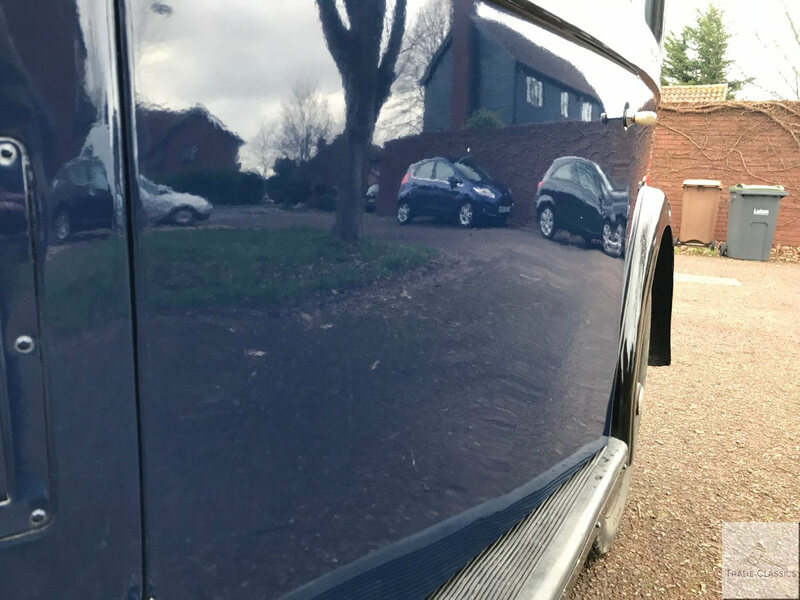 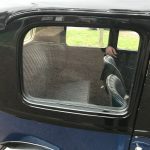 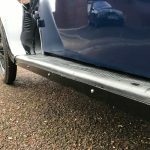 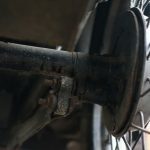 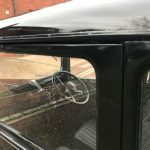 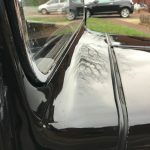 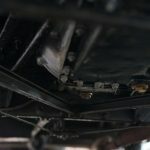 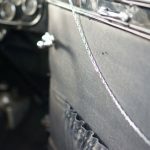 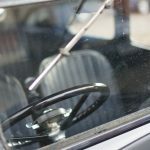 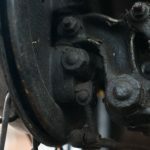 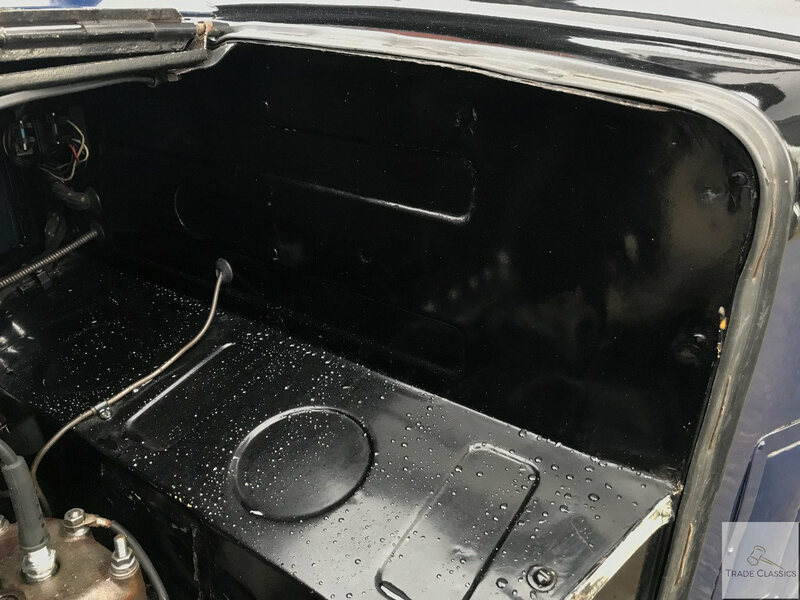 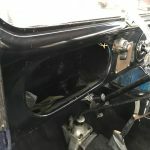 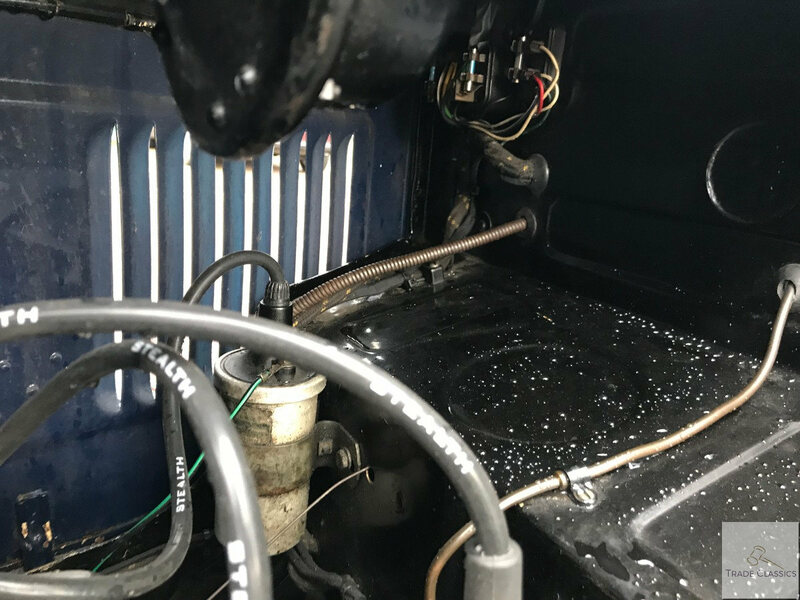 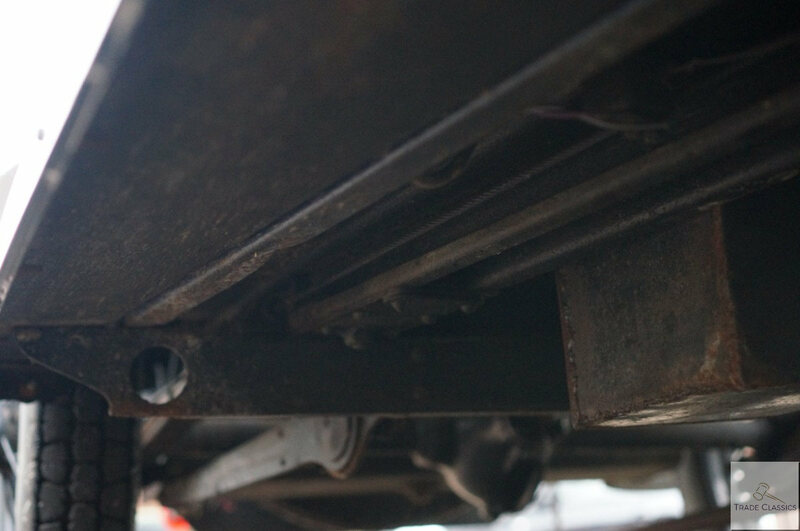 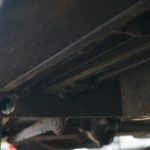 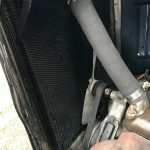 There was no rust visible upon viewing the vehicle, and as shown in the media, the shut-lines and panel gaps across the entire car are good and in line with the age of the vehicle. 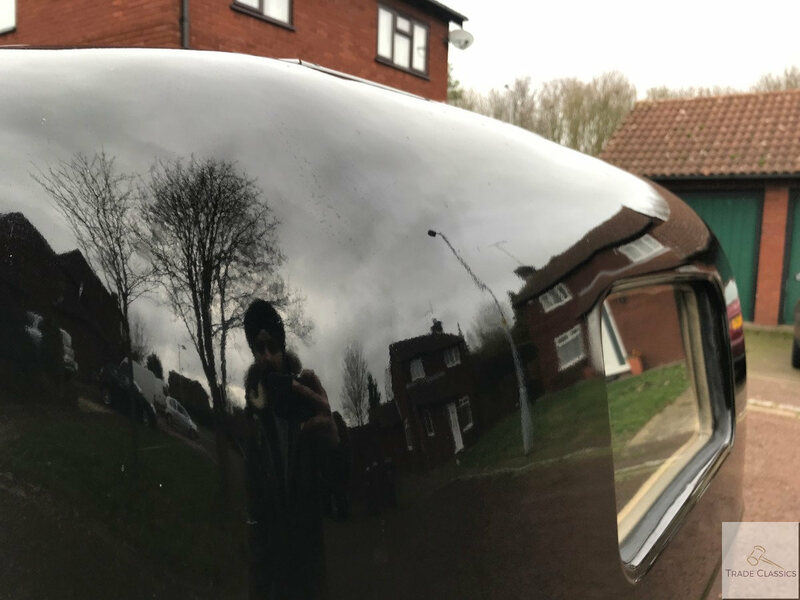 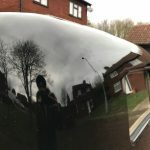 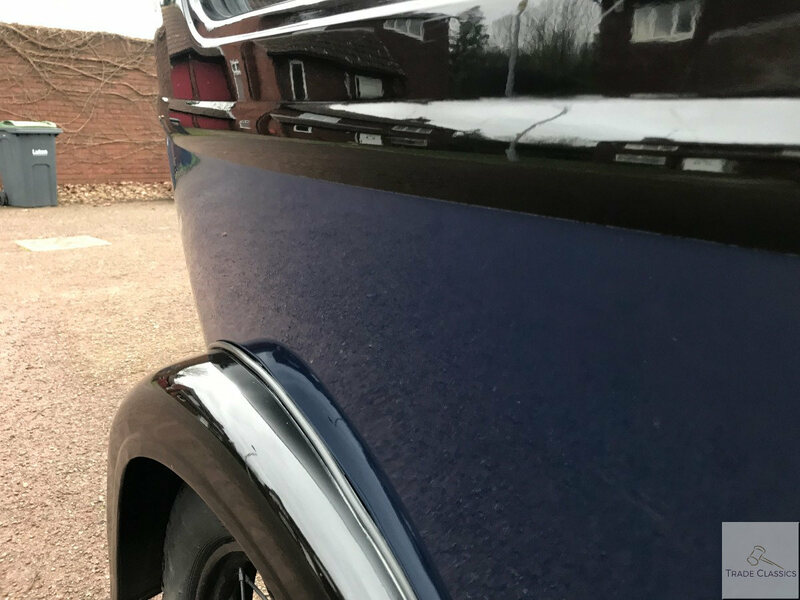 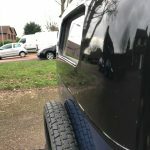 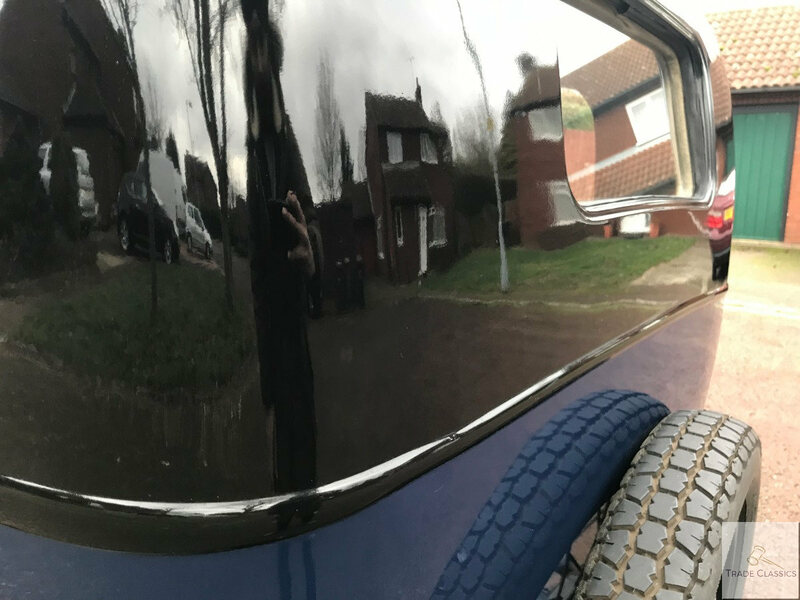 There is a dent on the nearside bonnet, this has been pointed out in the video review. 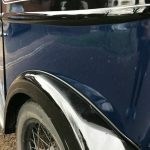 Of course the car has been painted many times over the years. 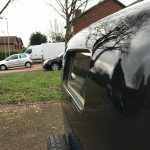 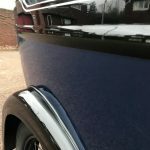 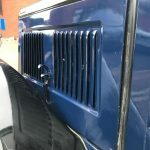 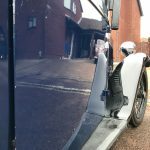 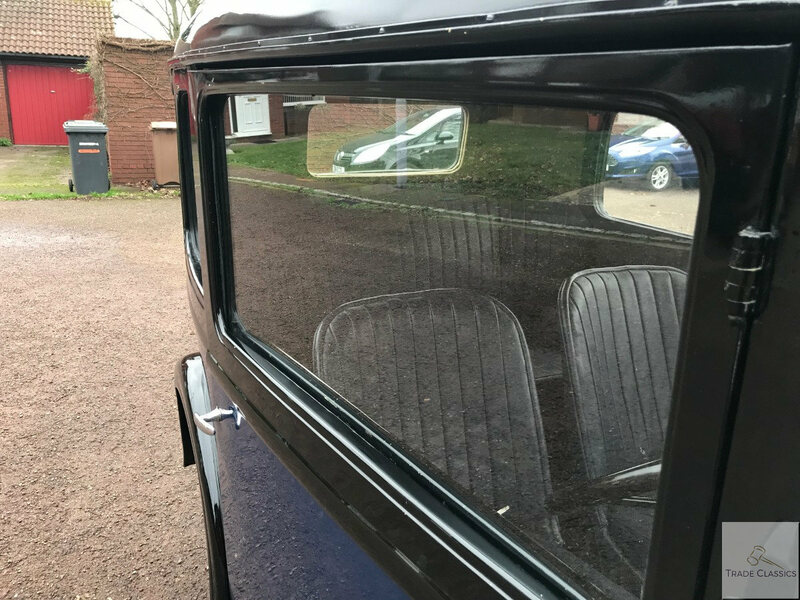 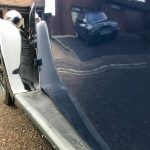 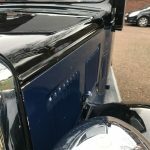 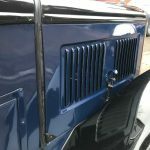 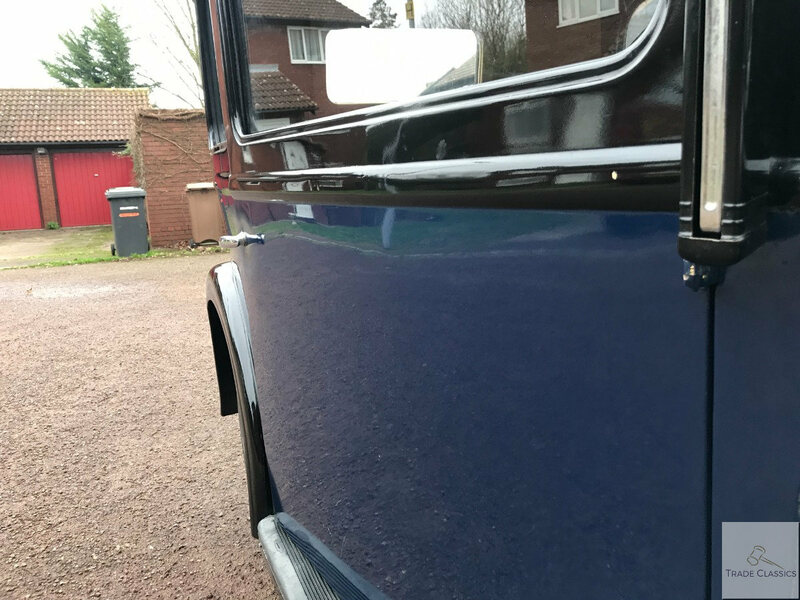 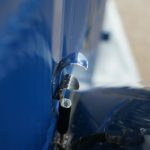 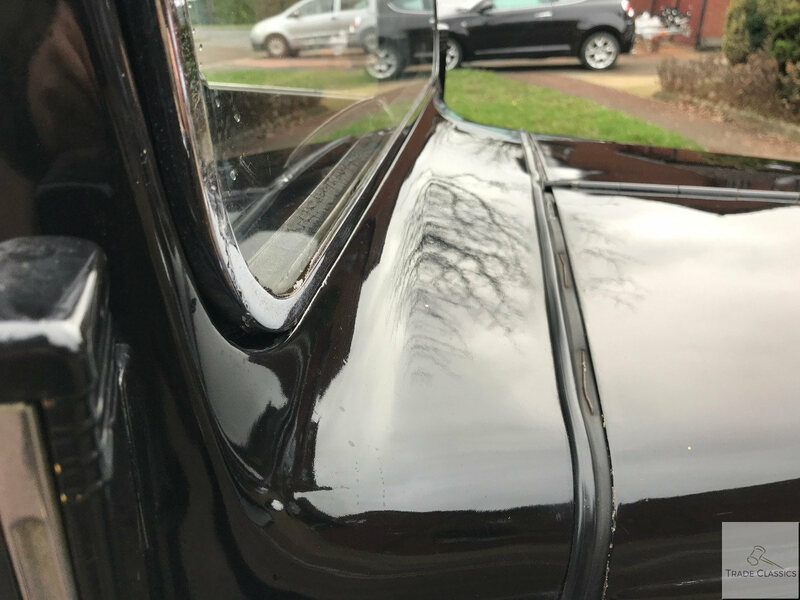 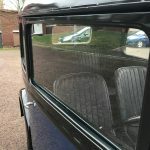 The current finish is good and usable – there are the usual imperfections as can be seen in the video footage, particularly on the leading edges of some of the panels where they have been caught and nicked over the years. 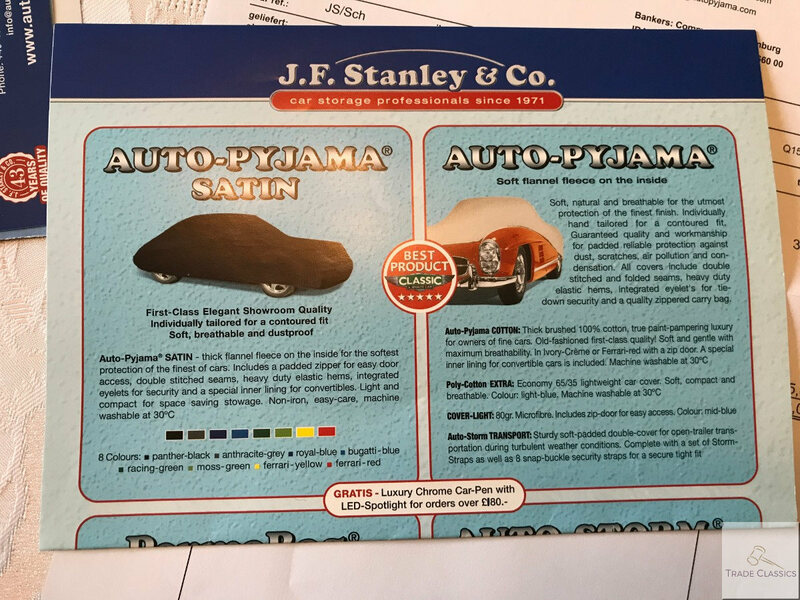 Both are in good condition as can be seen in the media pack. 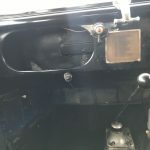 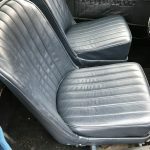 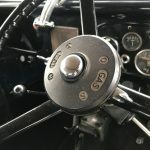 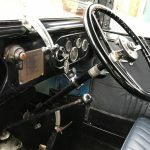 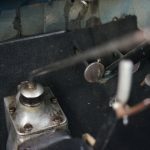 The interior is showing correct wear and patina in line with the car’s age. 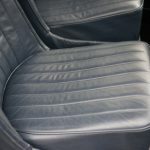 It’s in a lovely usable condition allowing the next custodian room to complete a satisfying improvement job. 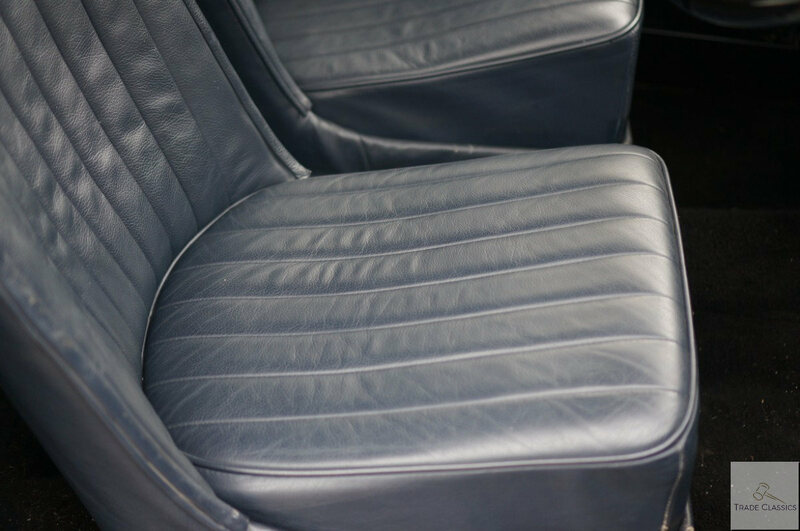 Dark blue seats with black carpets. 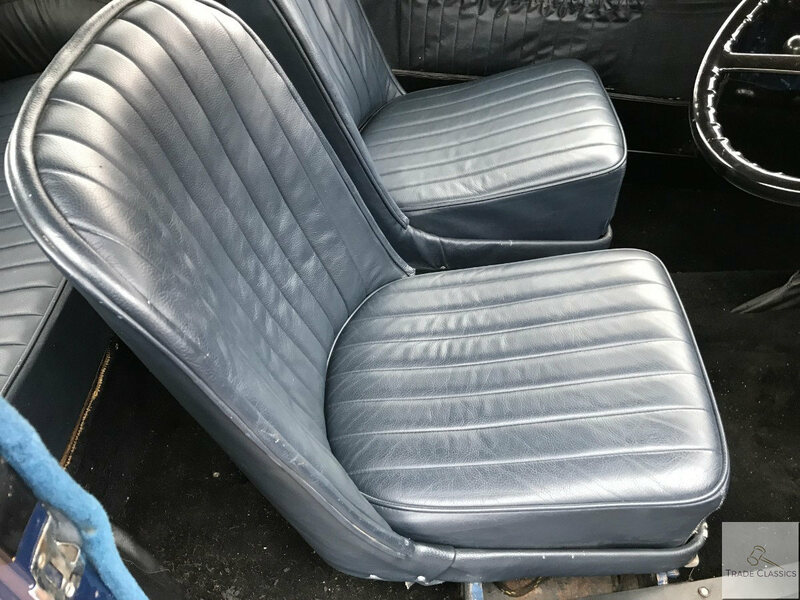 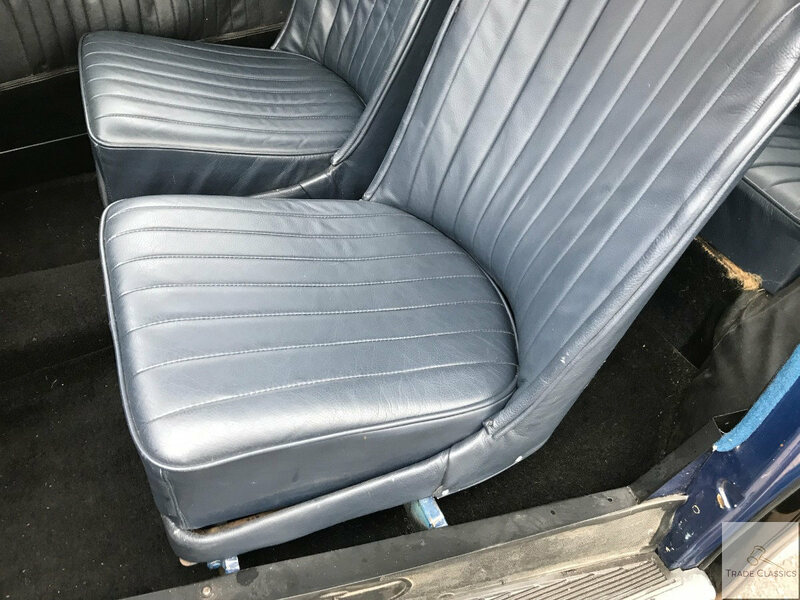 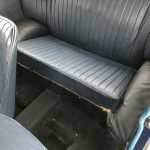 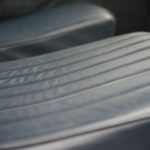 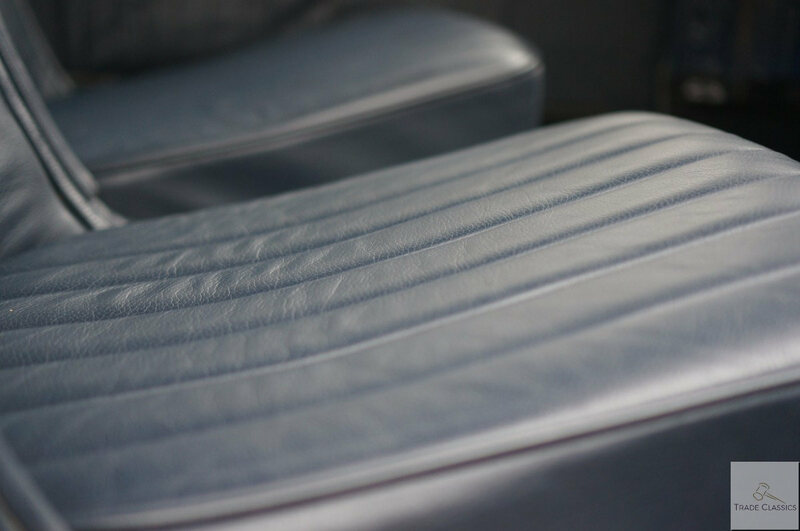 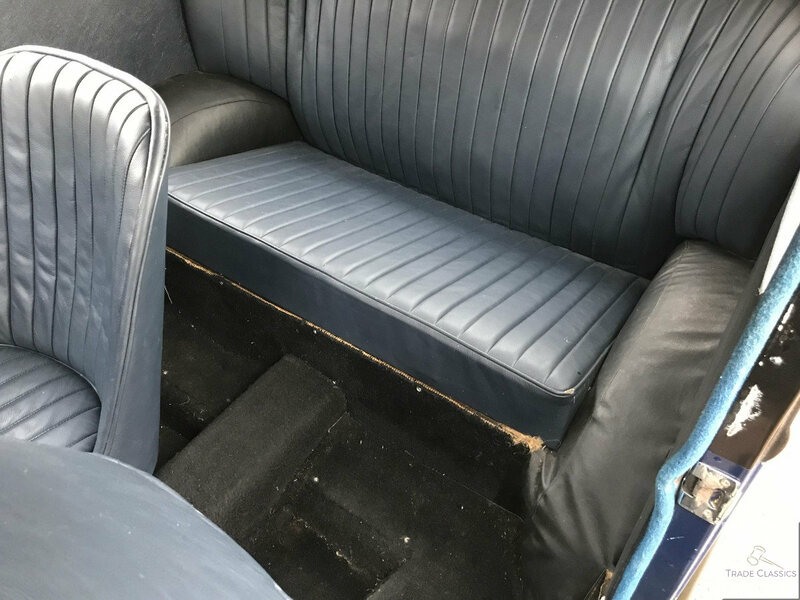 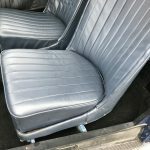 The seats across the car are in very good condition with no rips or wear showing. 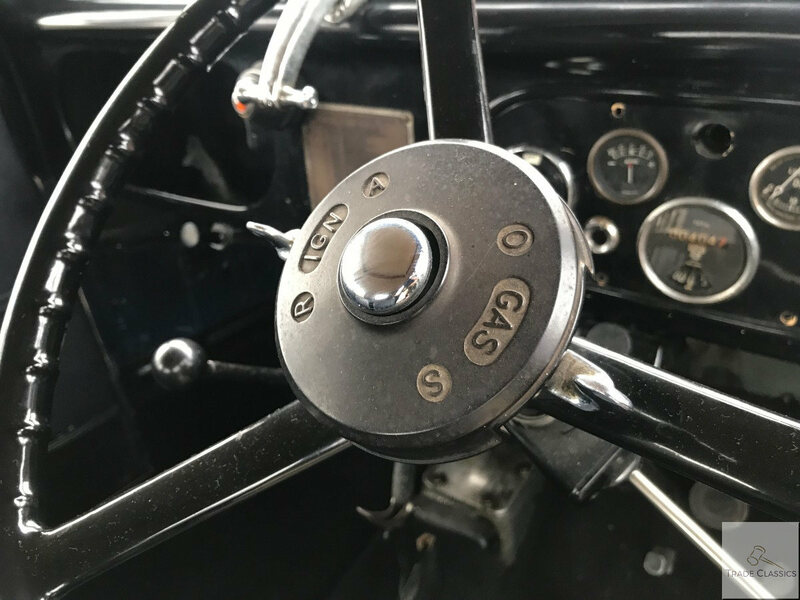 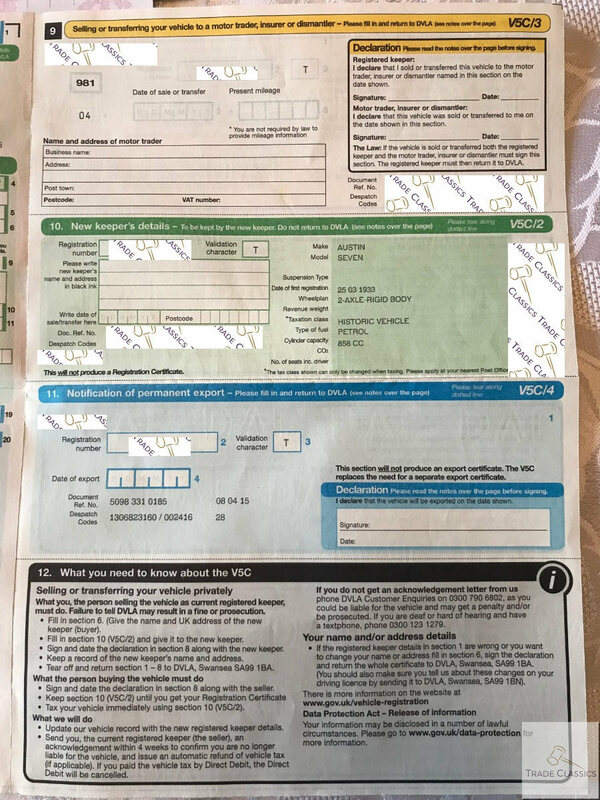 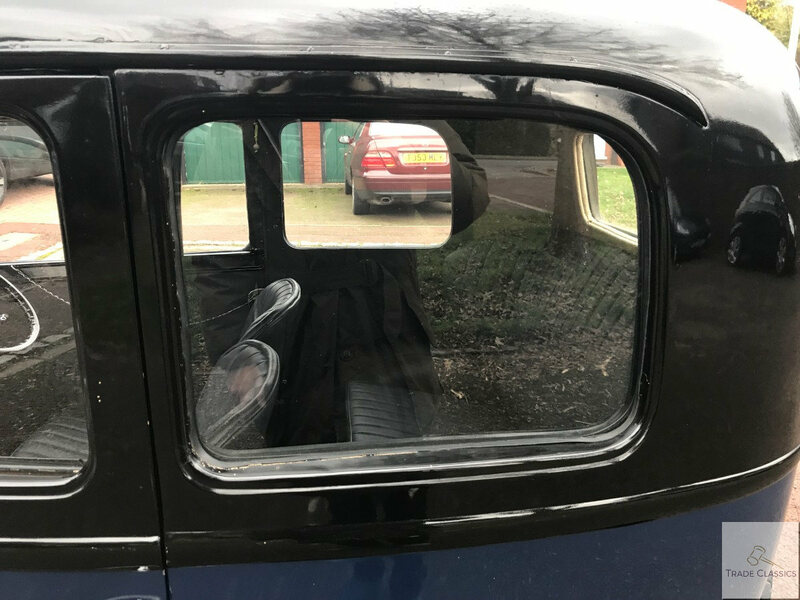 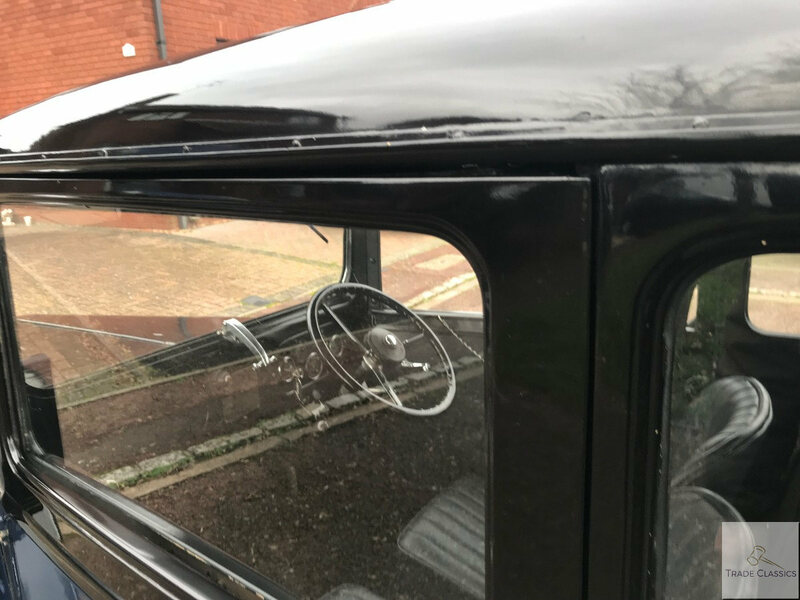 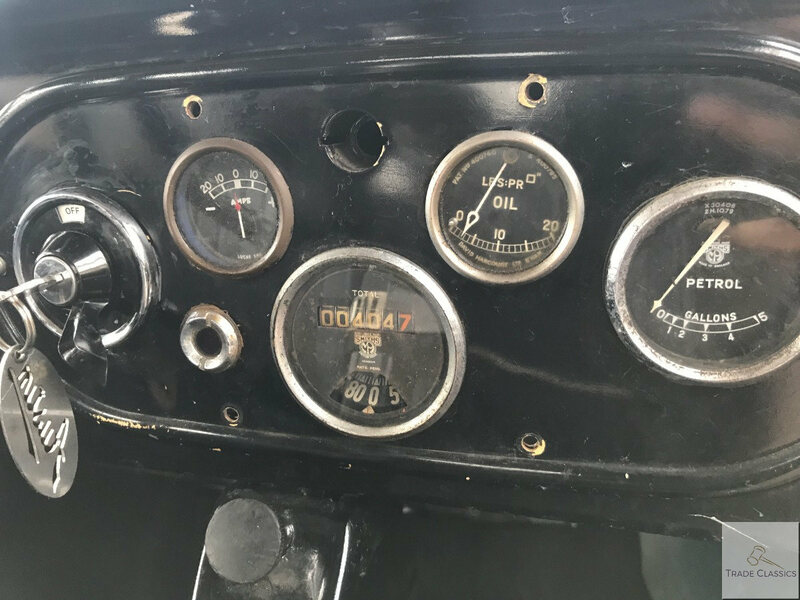 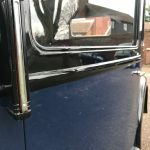 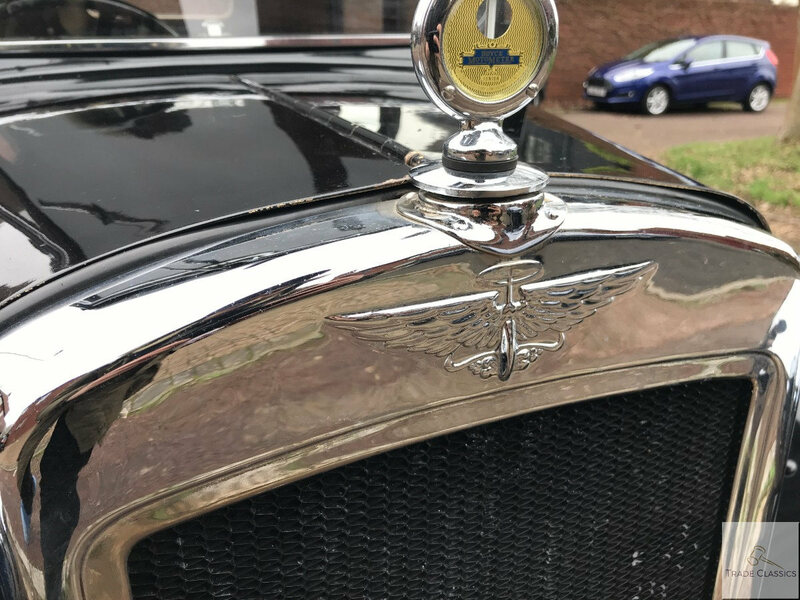 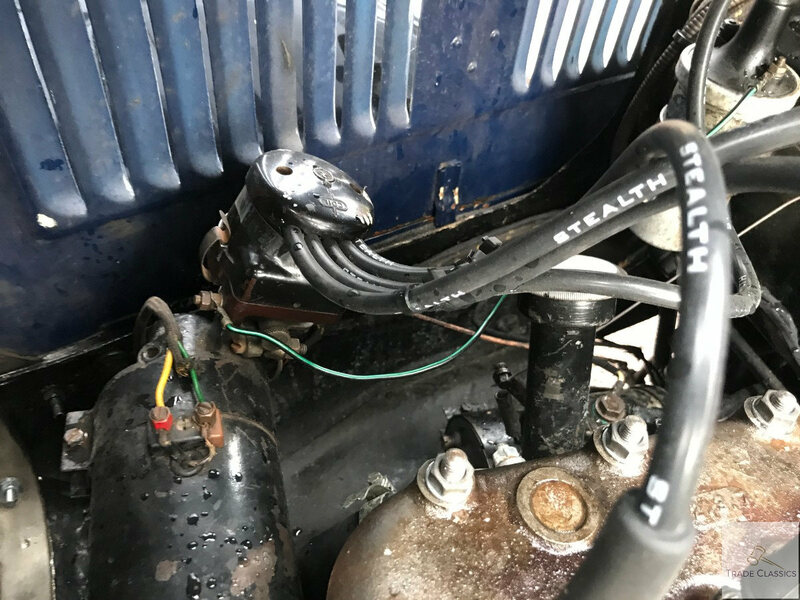 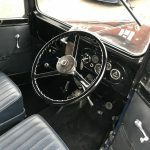 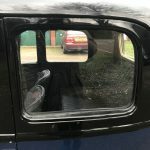 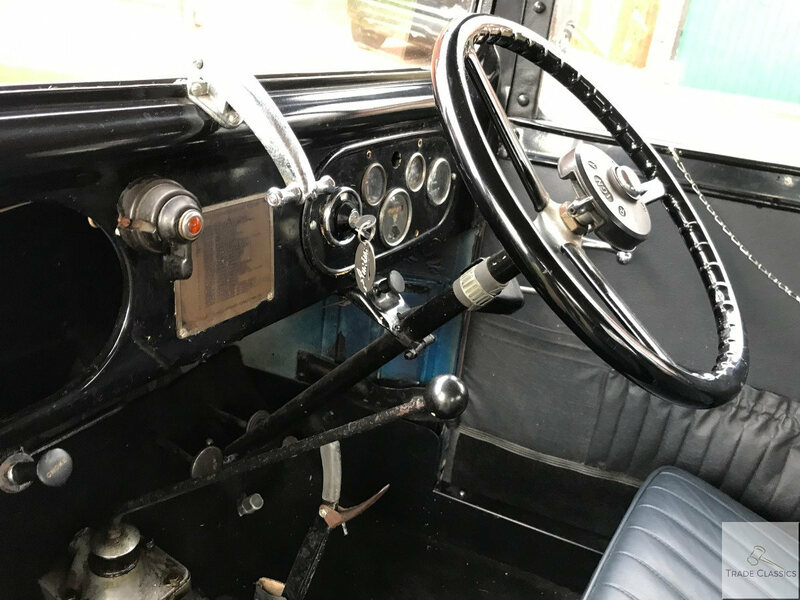 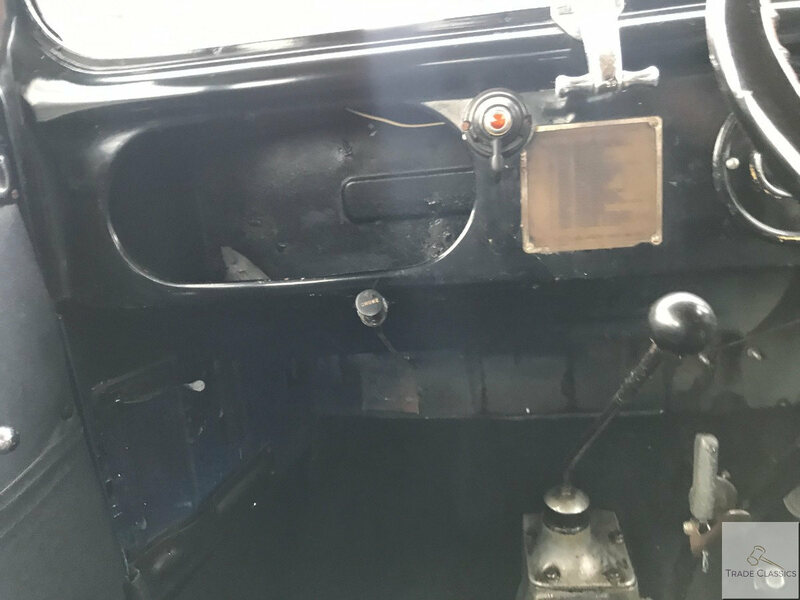 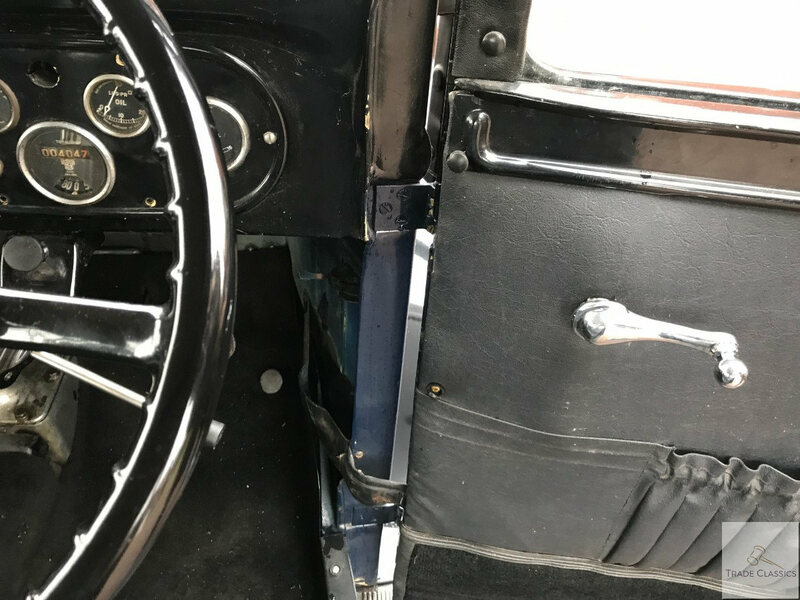 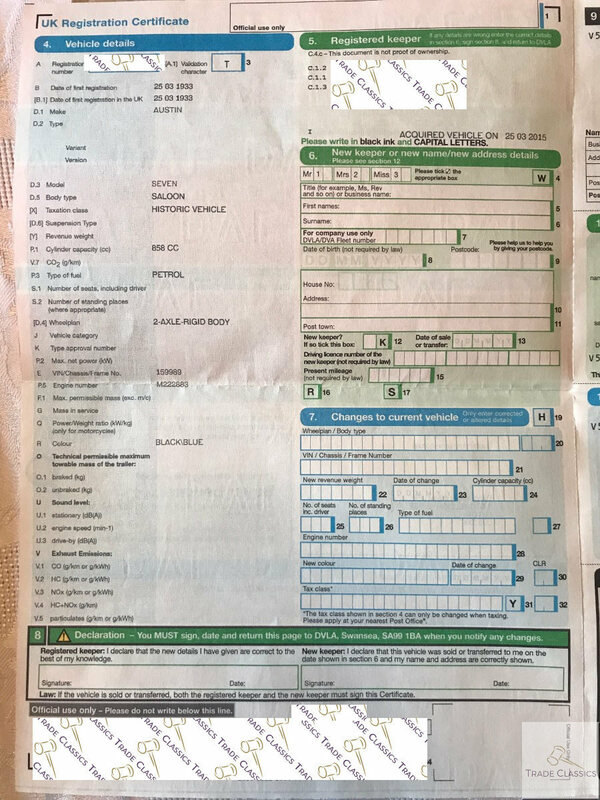 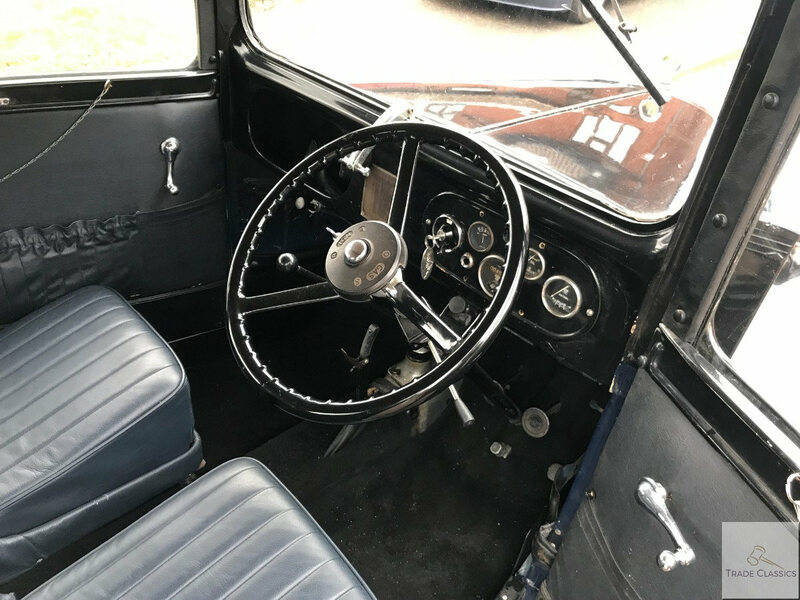 In correct condition for the age of the vehicle – no issues noticed, although we think the speedometer might be reading a bit too high as it certainly didn’t feel like we hit the 30 MPH that was showing when we went on a test drive. 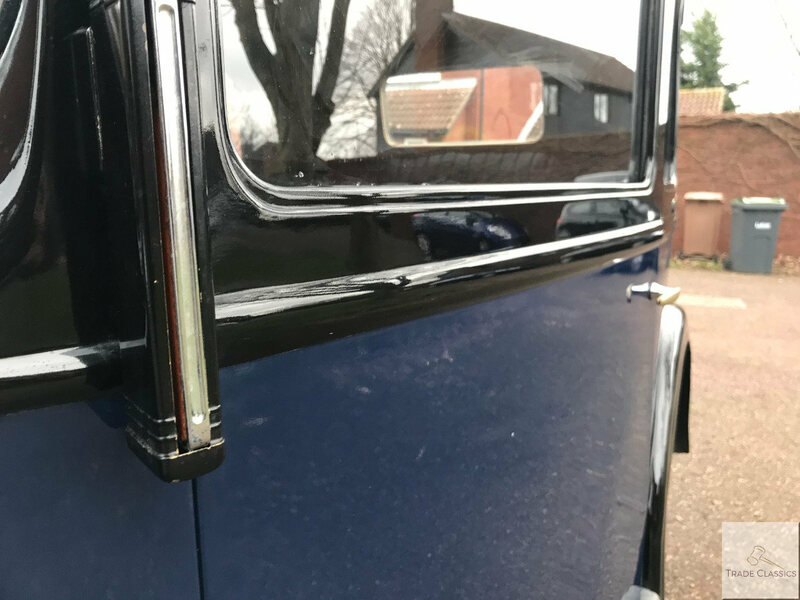 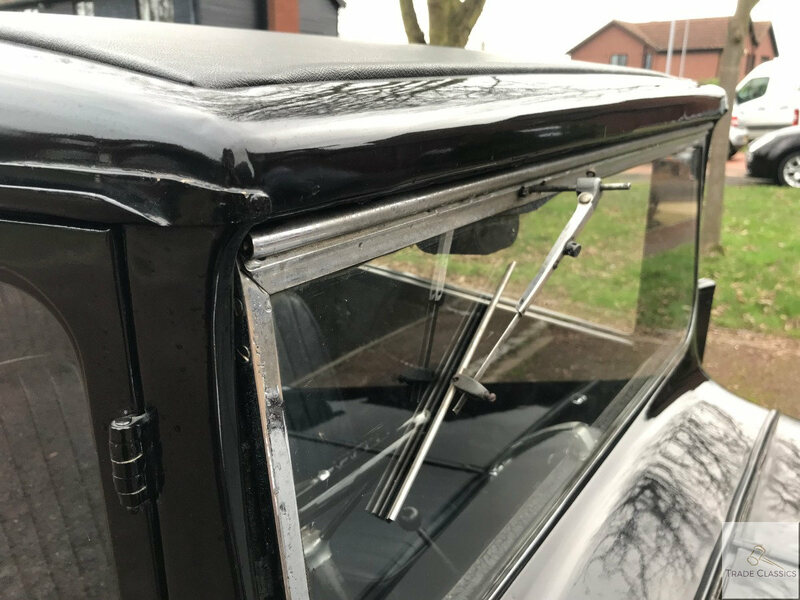 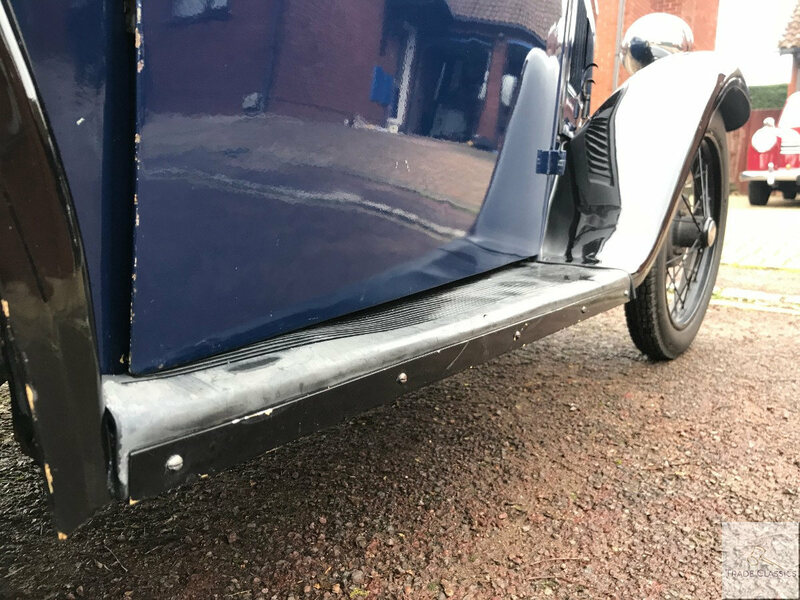 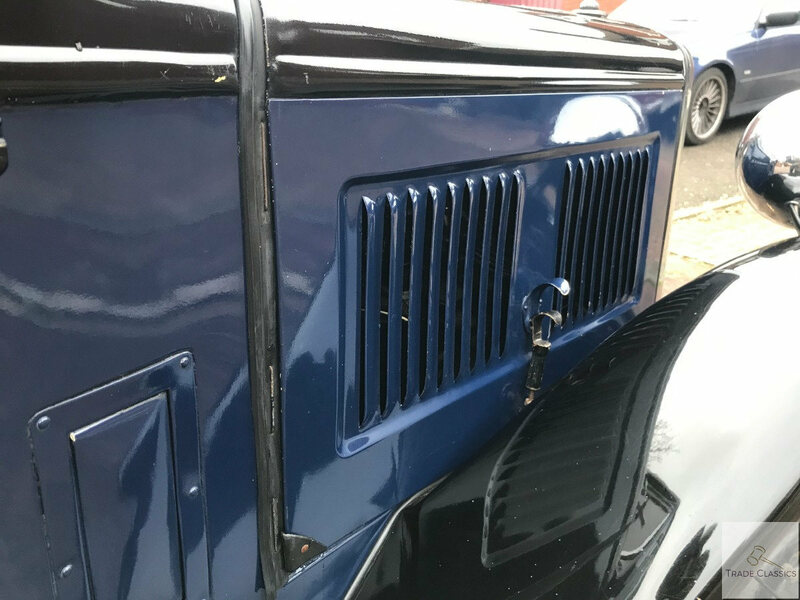 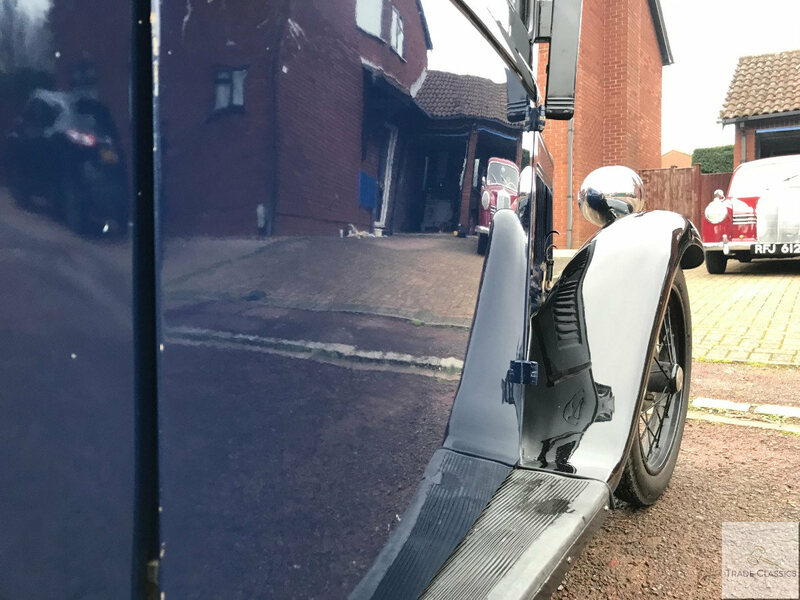 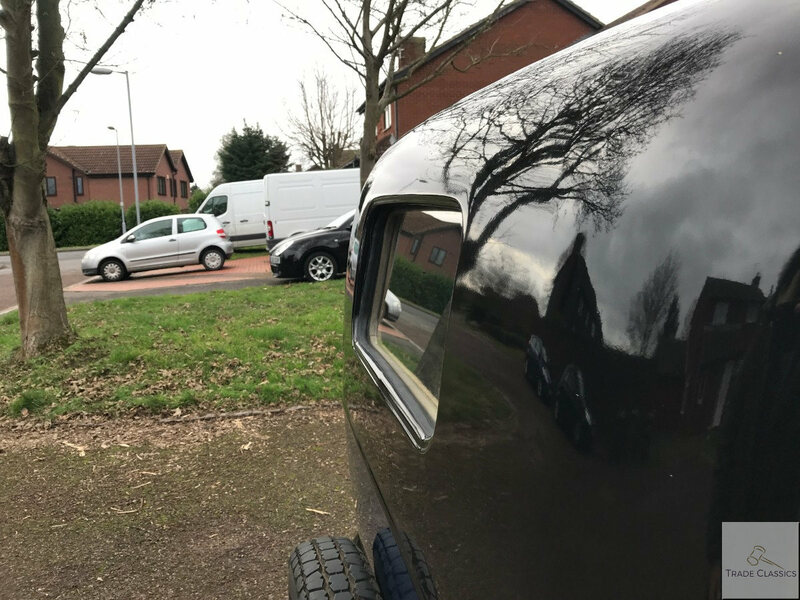 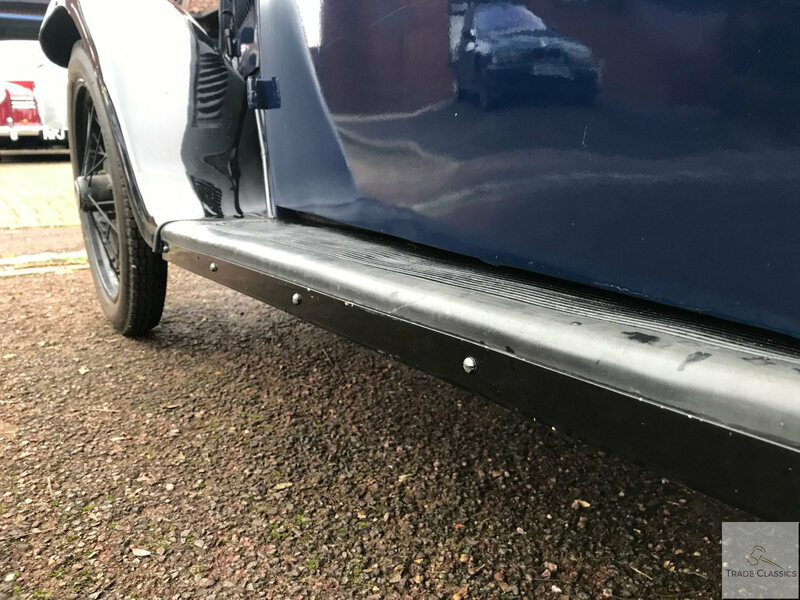 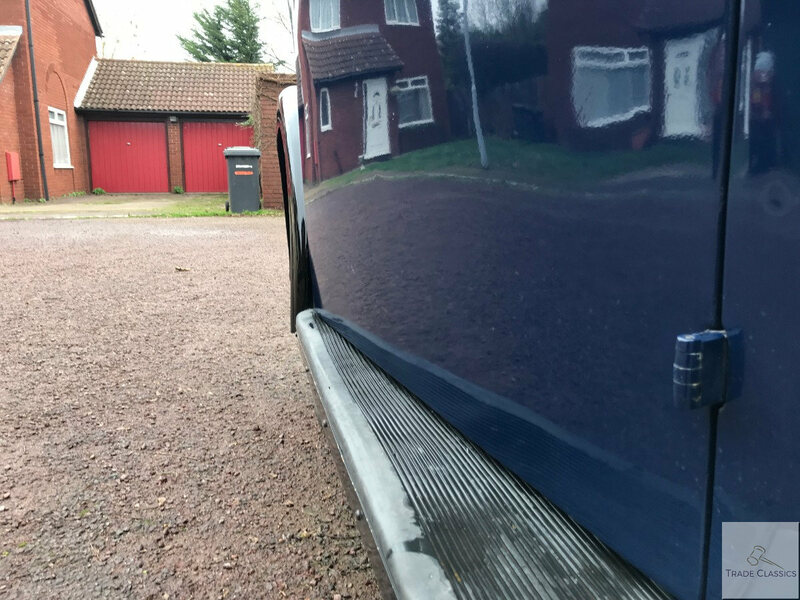 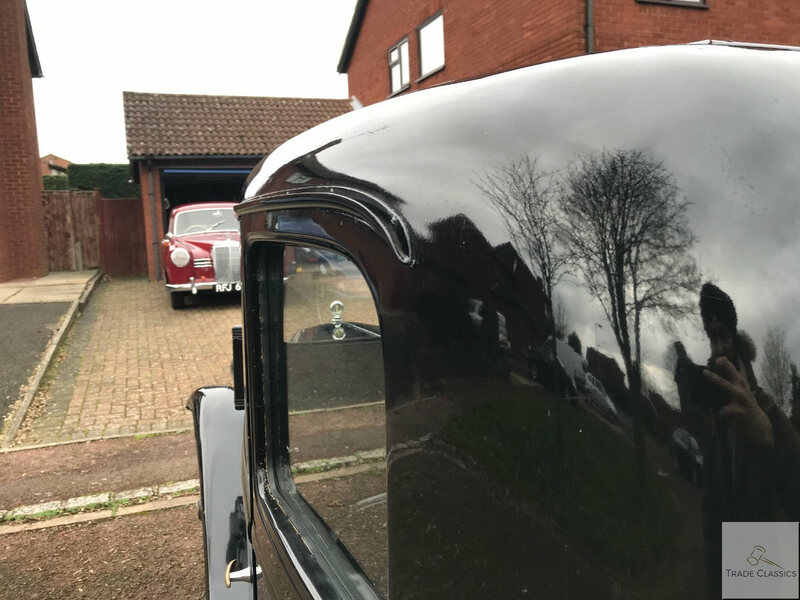 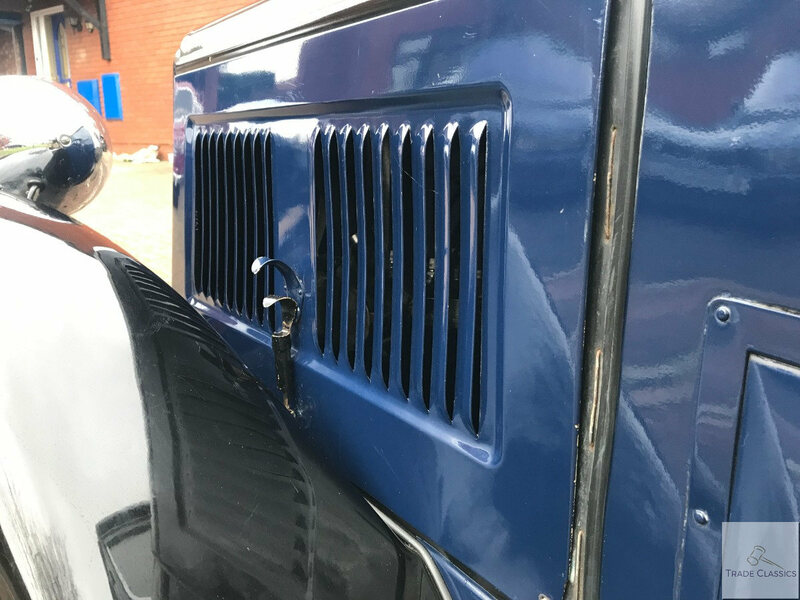 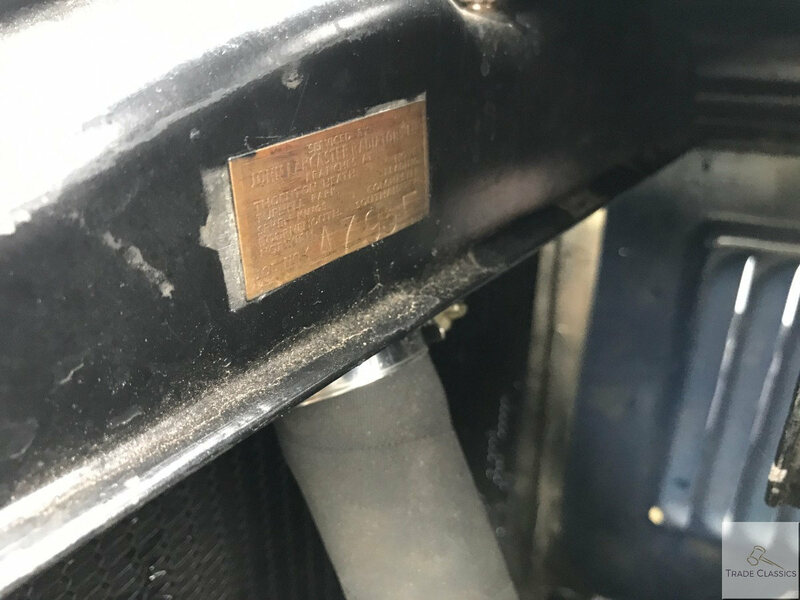 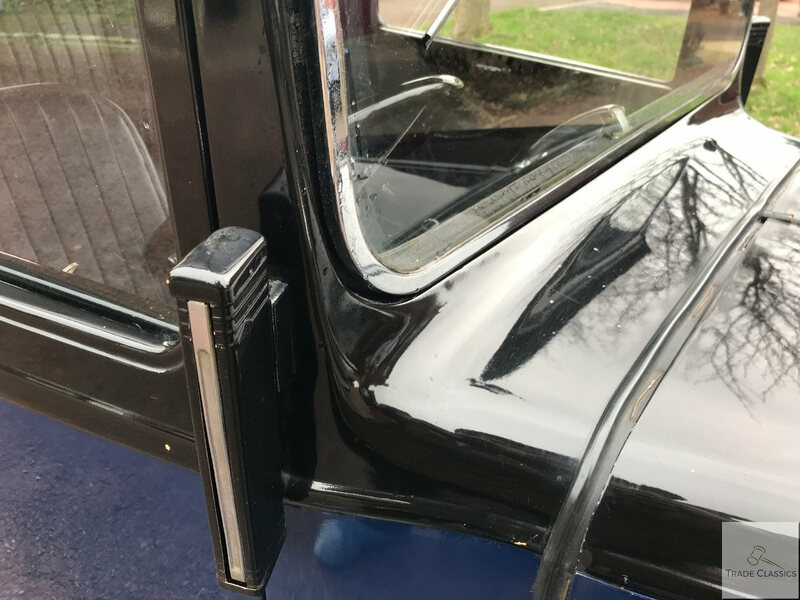 Again in correct condition for the age of the vehicle – no issues noticed. 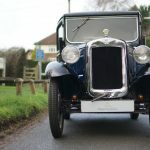 We went on our usual drive in the car to see how it handled as a passenger on the road. 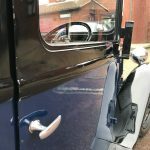 Please take a look at the video to see the car handle with four of us on the road! 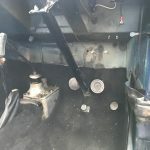 The car started from cold and there was no smoke to be seen. 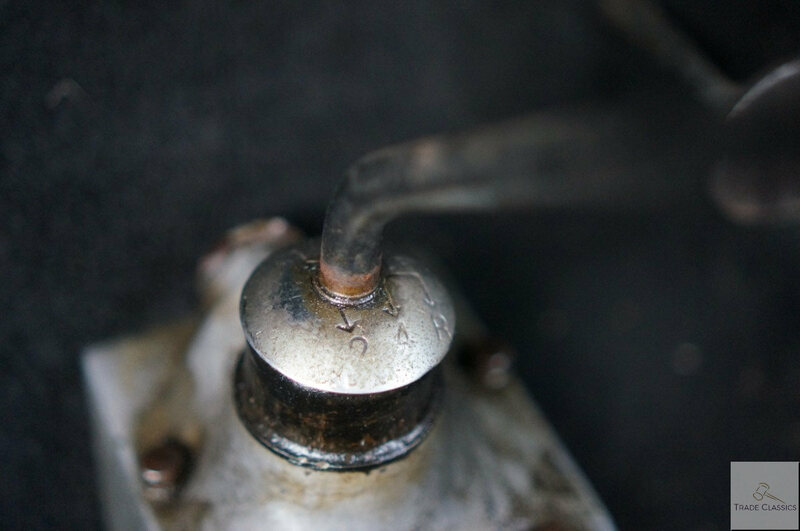 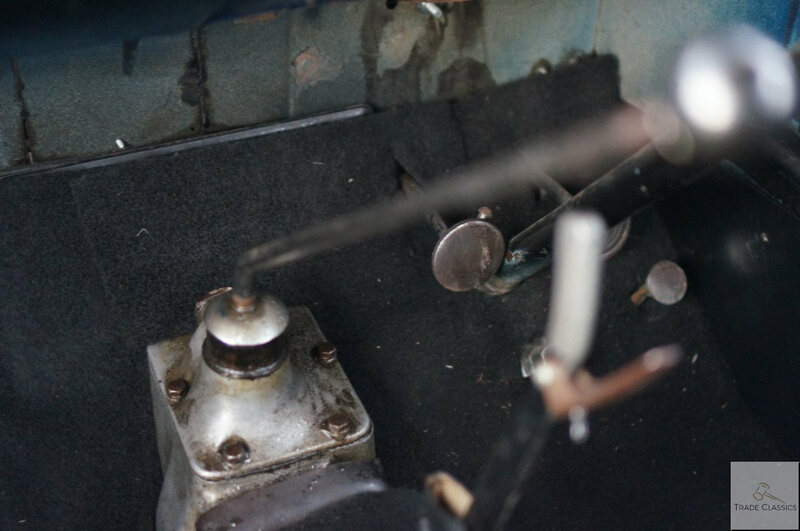 It did take a second turn of the key with a bit more throttle to help the car settle down and idle correctly. 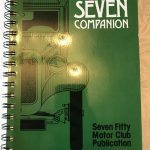 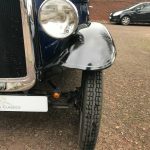 The car handled very well on the road, it was a more comfortable ride than I was anticipating and easily handled the four of us on a short run. 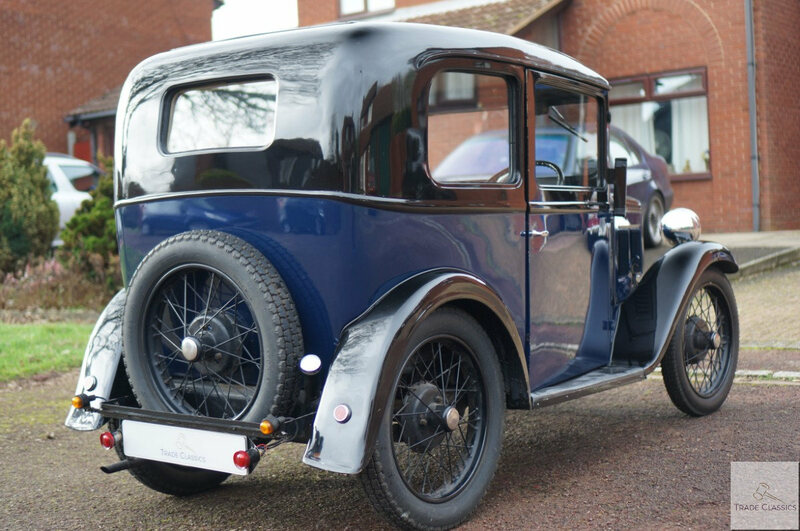 As expected, it’s a noisy vintage car but gave a good smooth ride as a passenger. 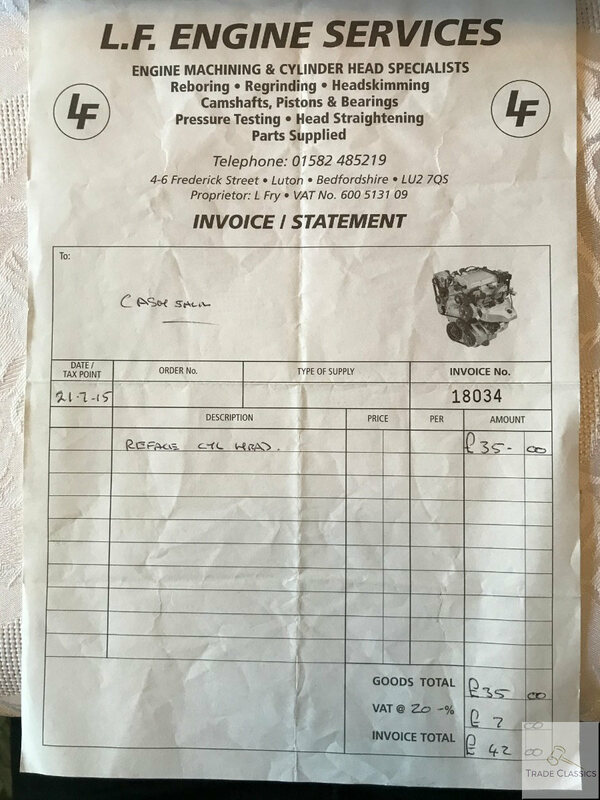 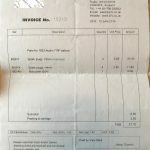 The car performed without fault on our short trip. 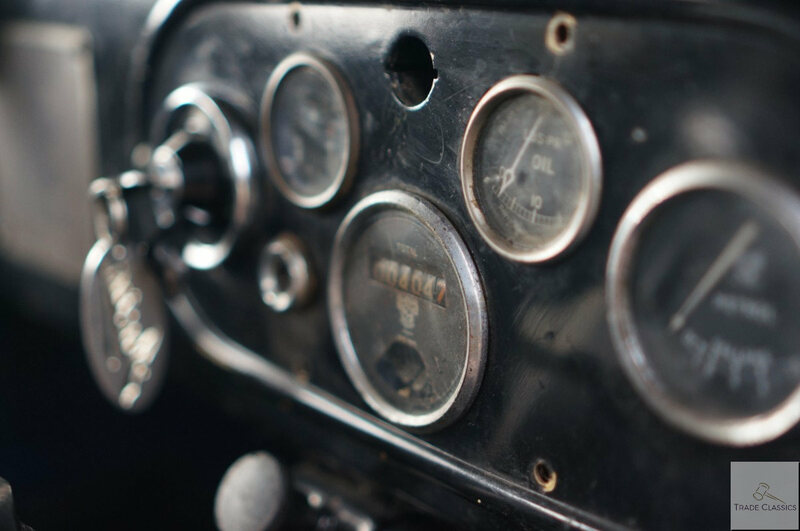 Going through the gears, and the engine pushing all 4 of us along. 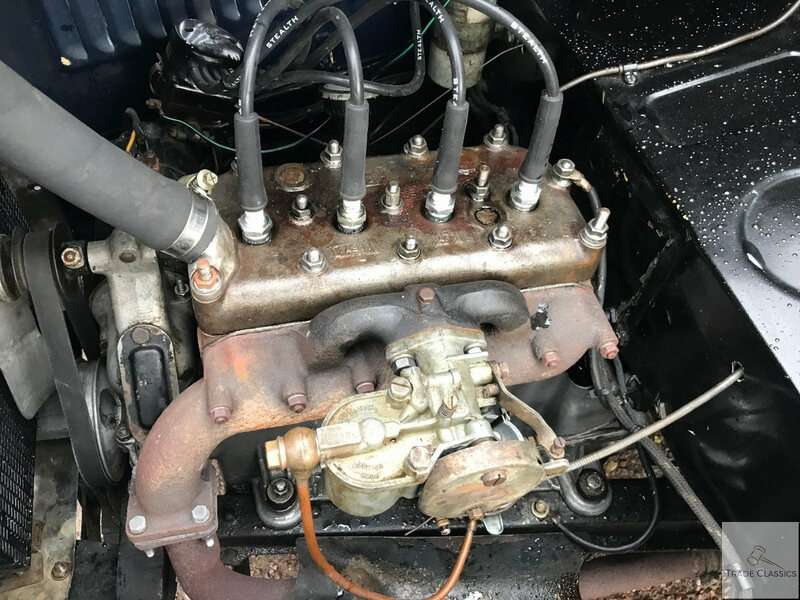 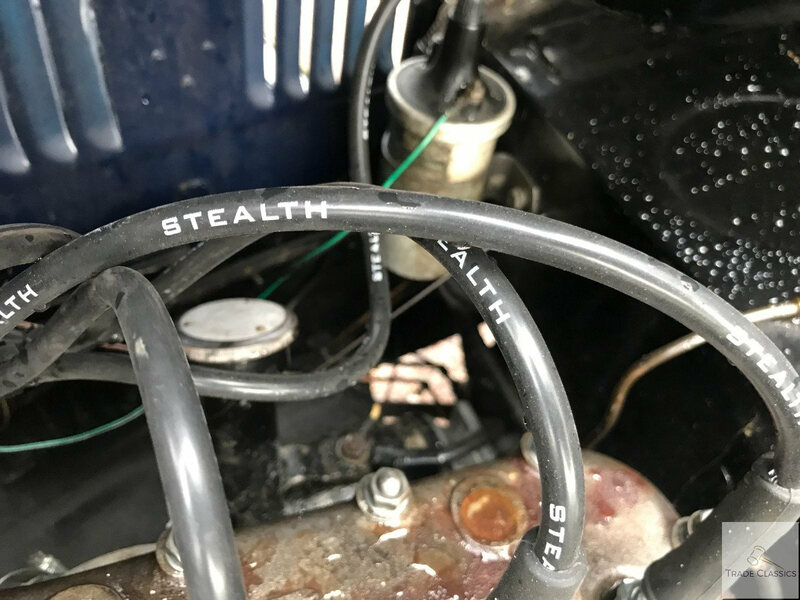 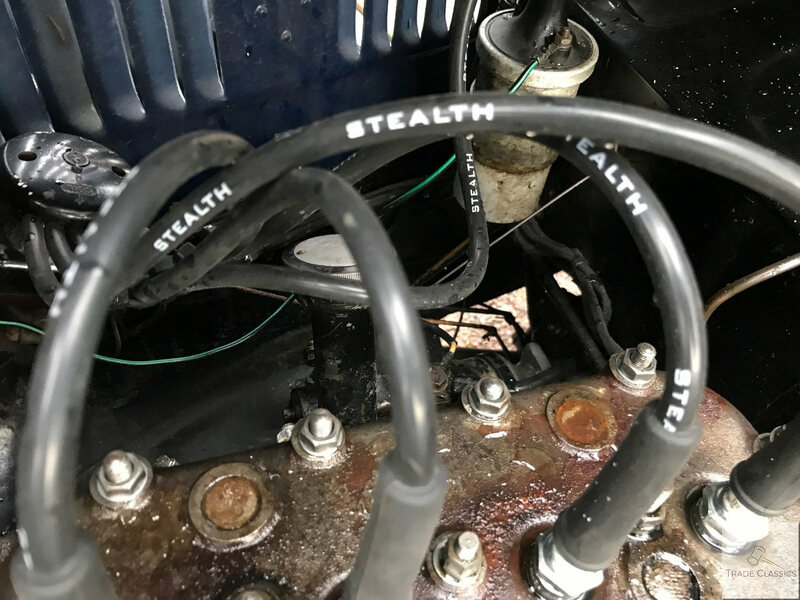 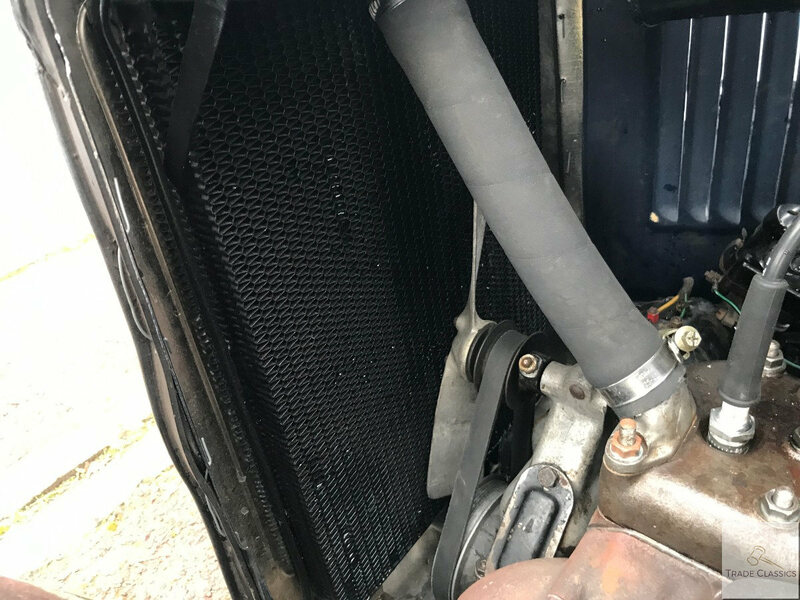 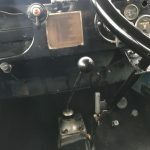 Of course there is no synchromesh, so it’s up to the skill of the driver to double clutch, match the engine speed and then engage the correct gears – Neil may need a little more practice as can be seen in the video 🙂 The car idled both cold and hot with no issues during the run. 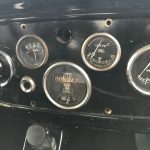 Neil and Louise inform us that everything on the car is working as it should, and you can see from the videos that all gauges on the dash are working fine. 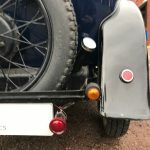 Modern electric indicators have been fitted to the car, the old semaphore signals are still present but not currently operational. 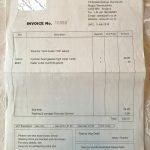 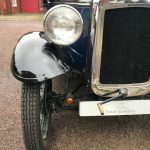 As you have read, Neil and Louise are selling the car due to David’s health issues – he will be very sad to see it go but knows it now needs to move on to its next custodian. 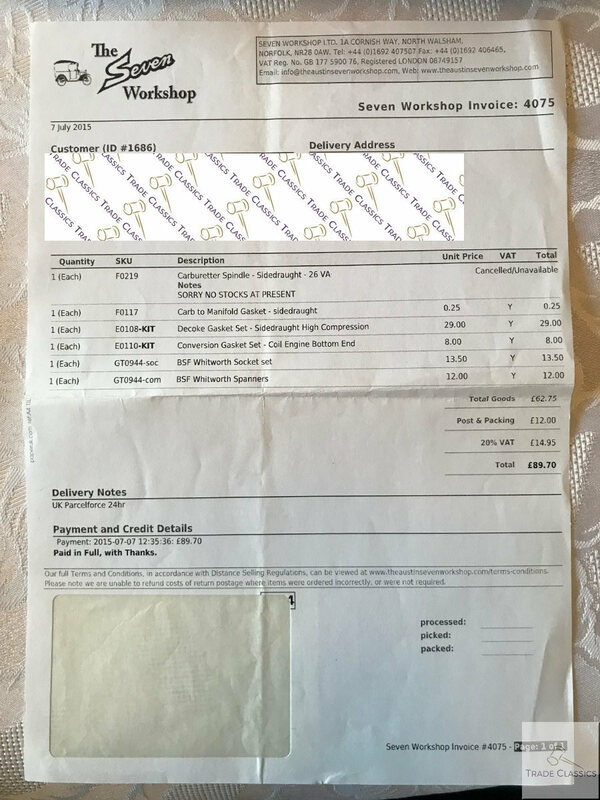 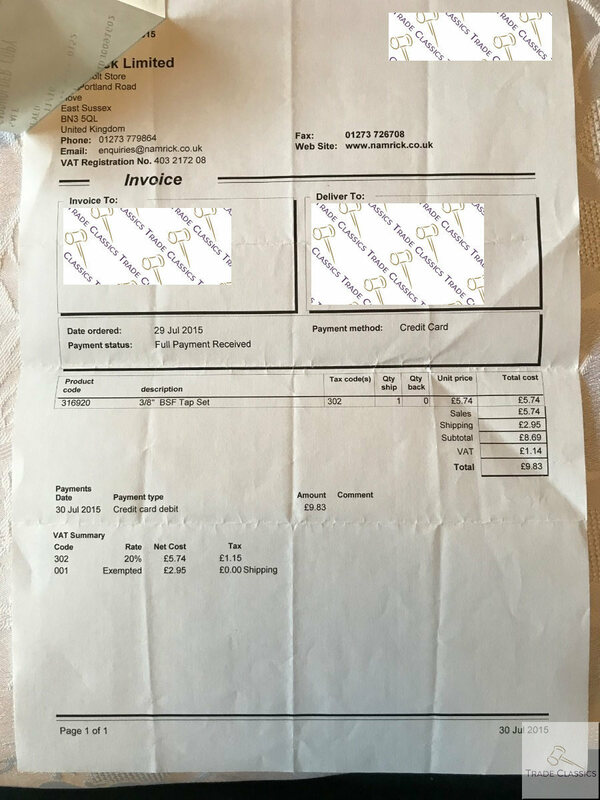 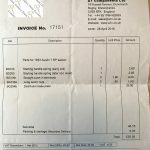 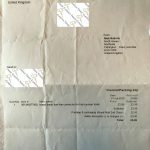 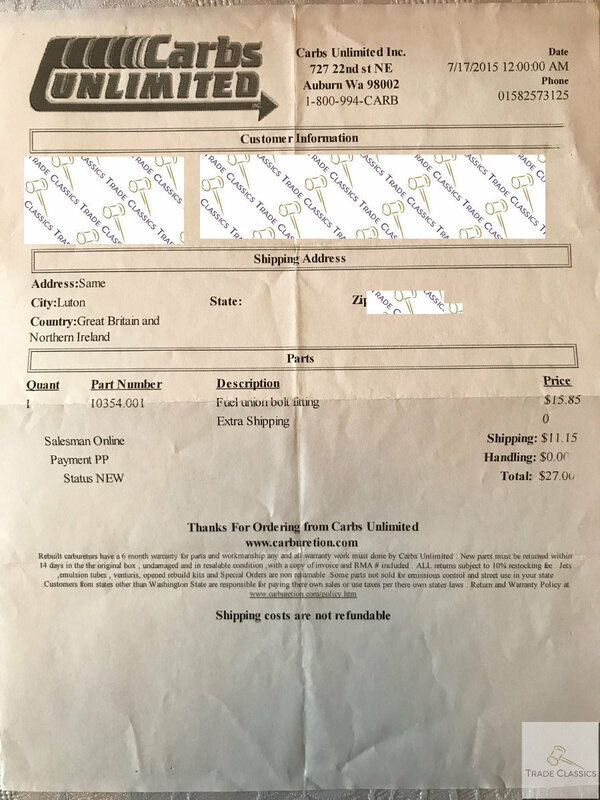 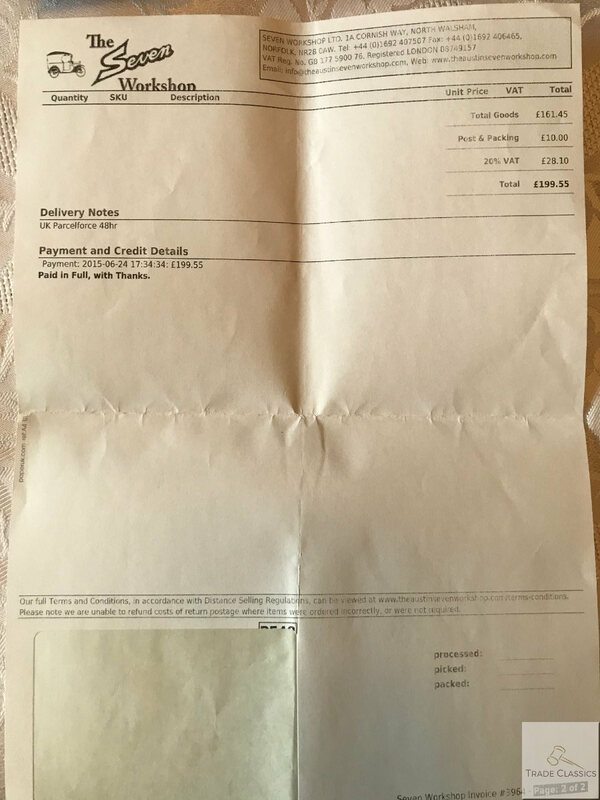 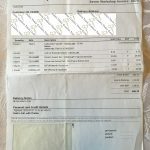 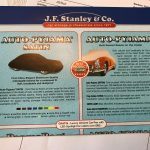 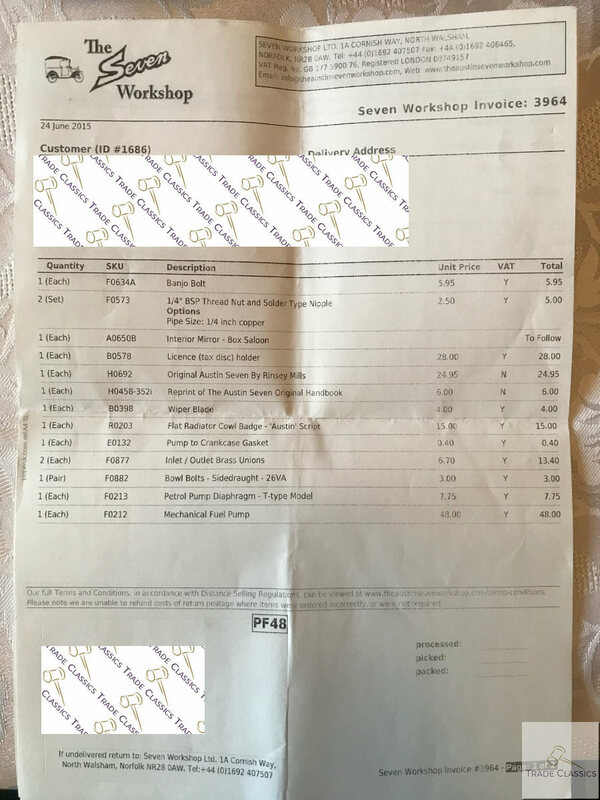 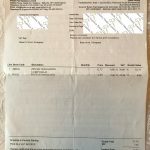 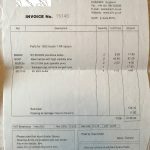 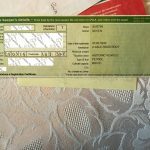 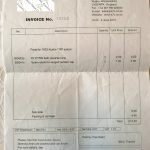 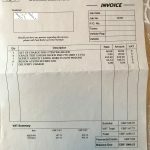 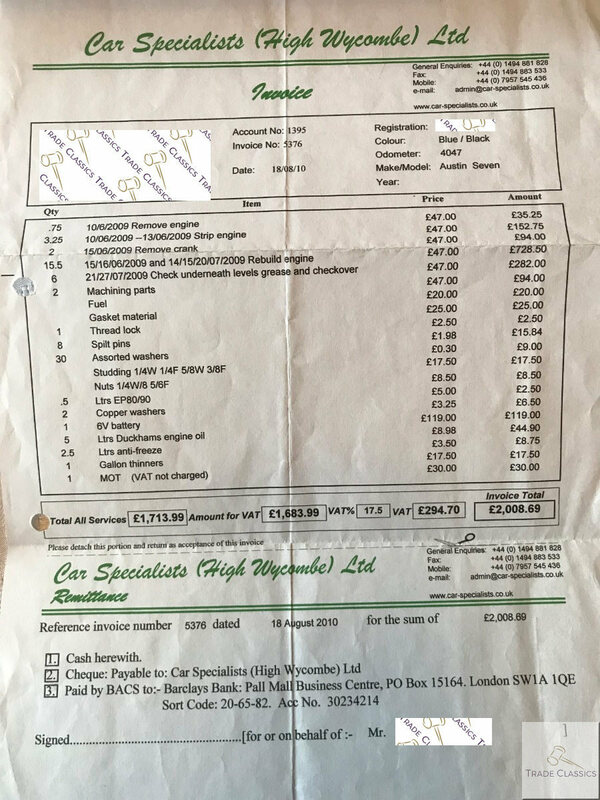 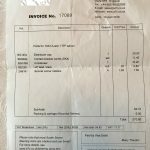 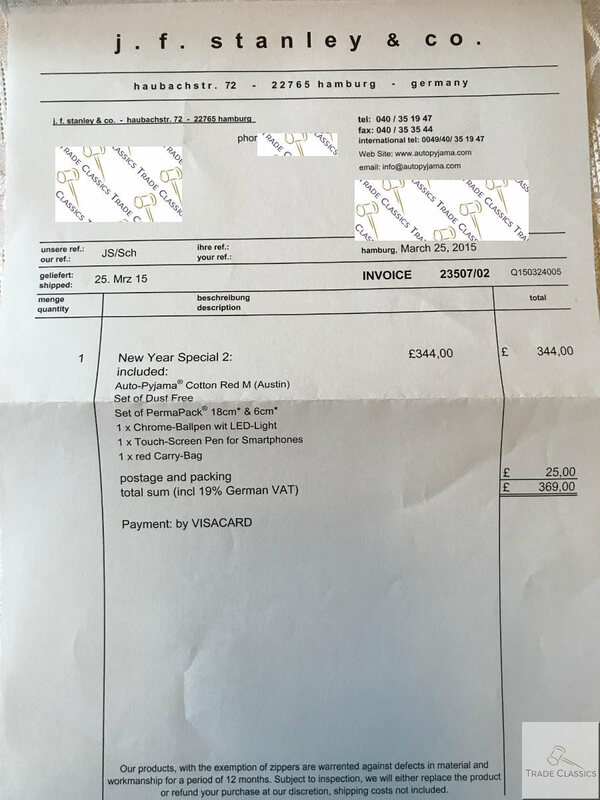 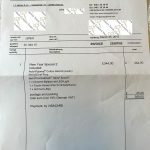 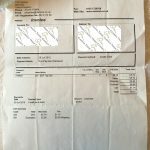 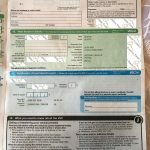 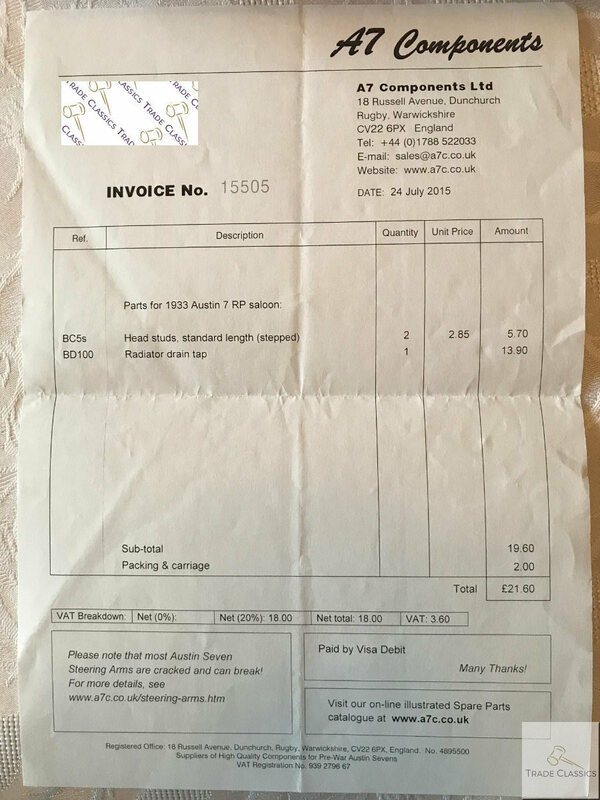 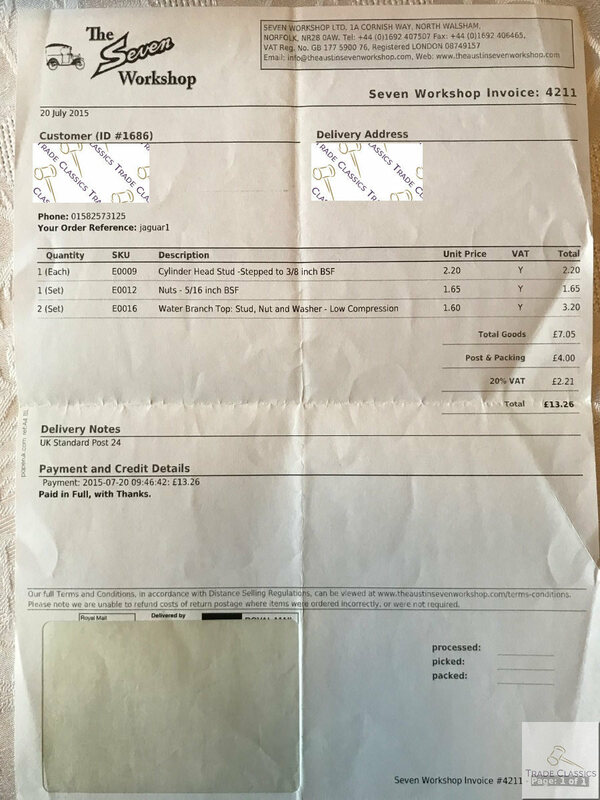 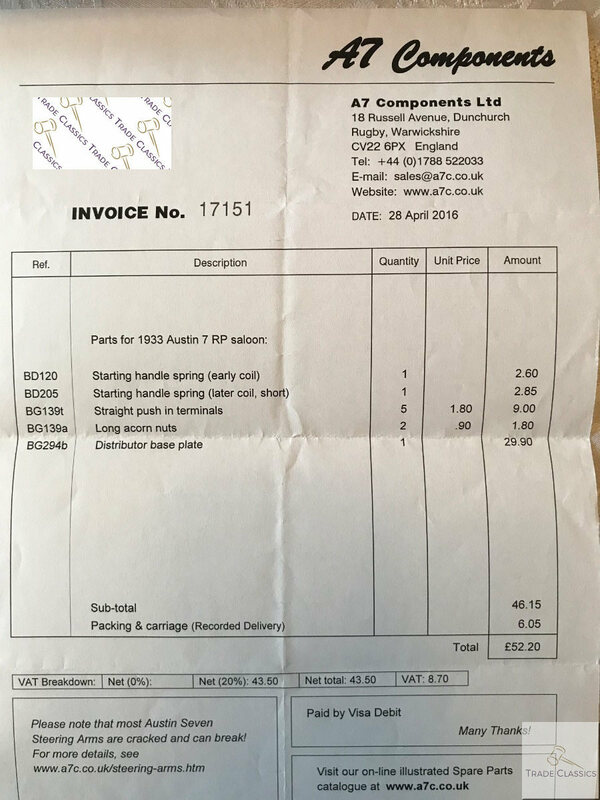 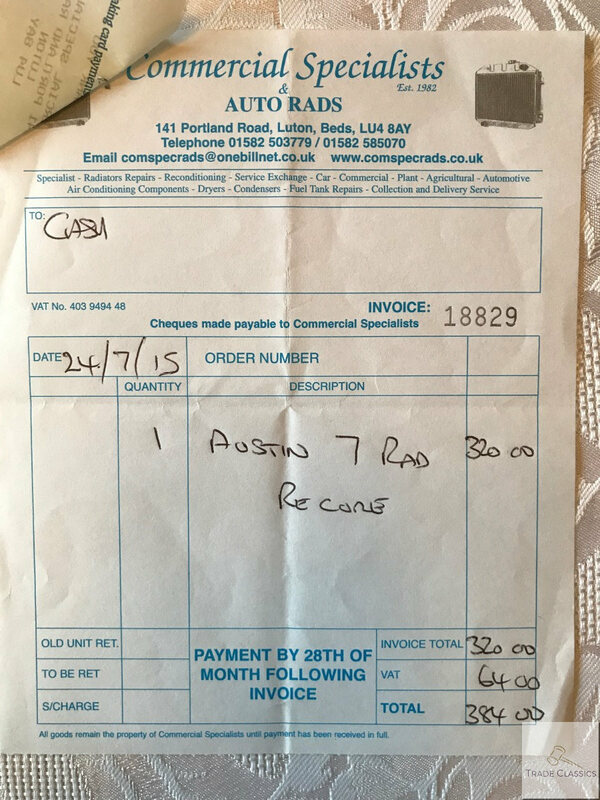 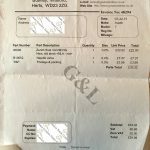 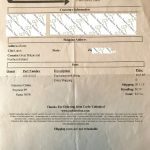 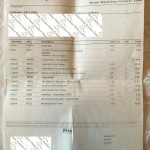 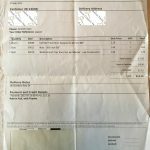 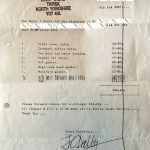 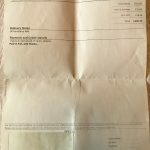 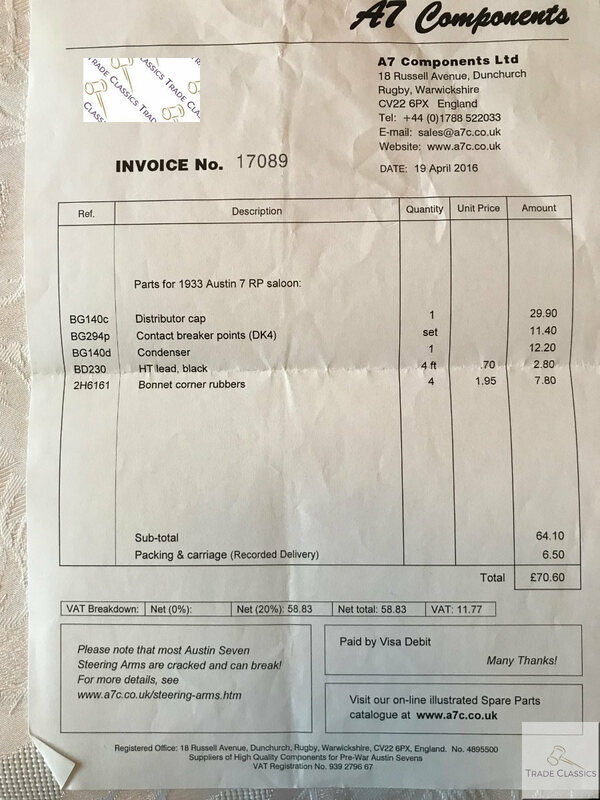 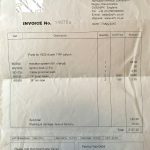 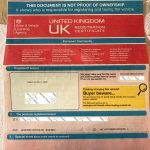 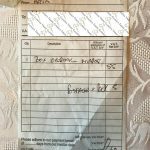 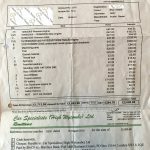 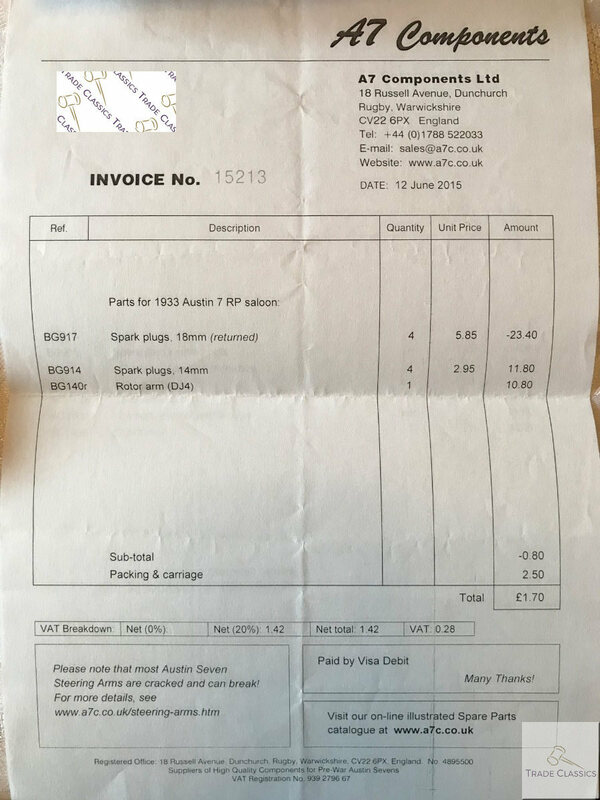 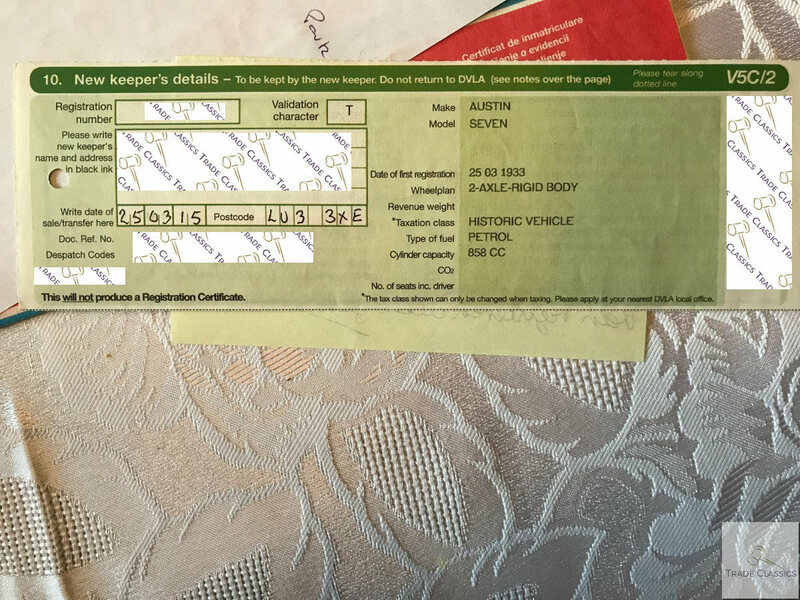 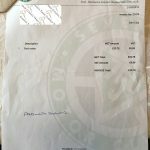 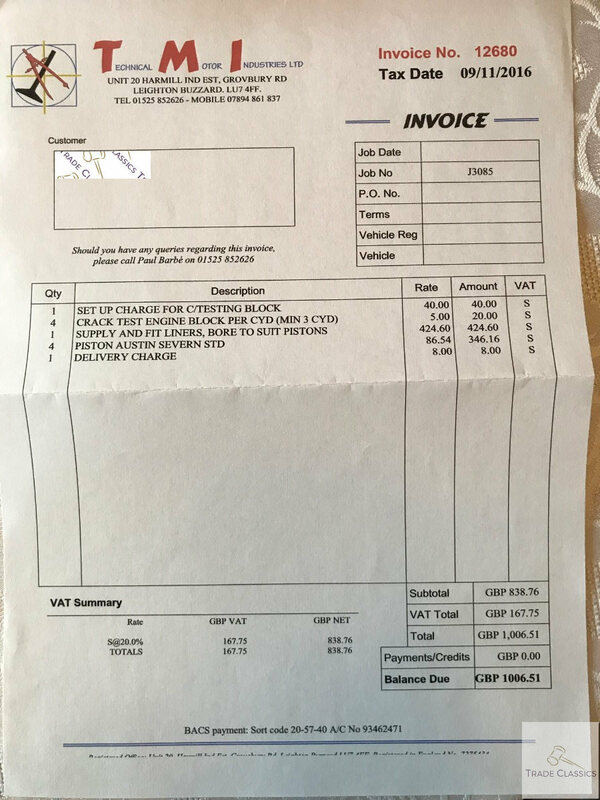 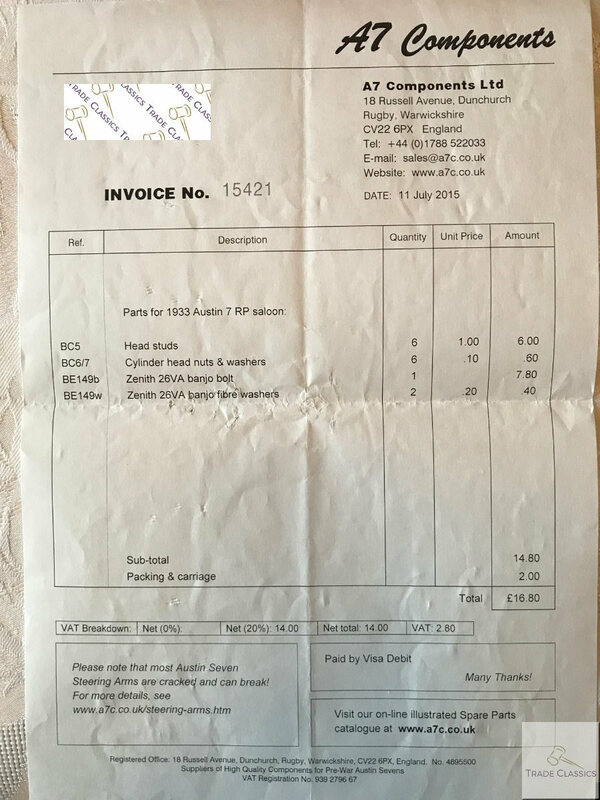 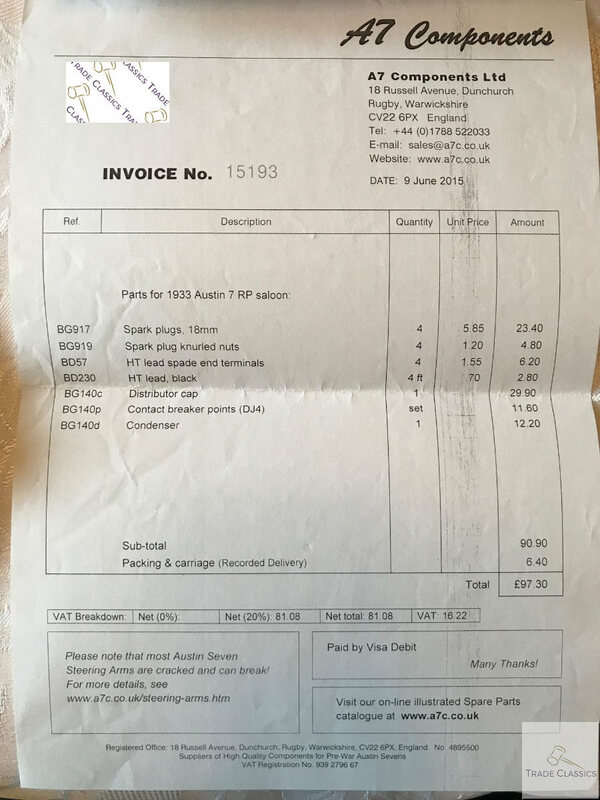 Please see the images to review all the invoices and paperwork with the car. 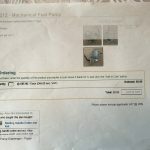 The car is showing just over 404 miles. 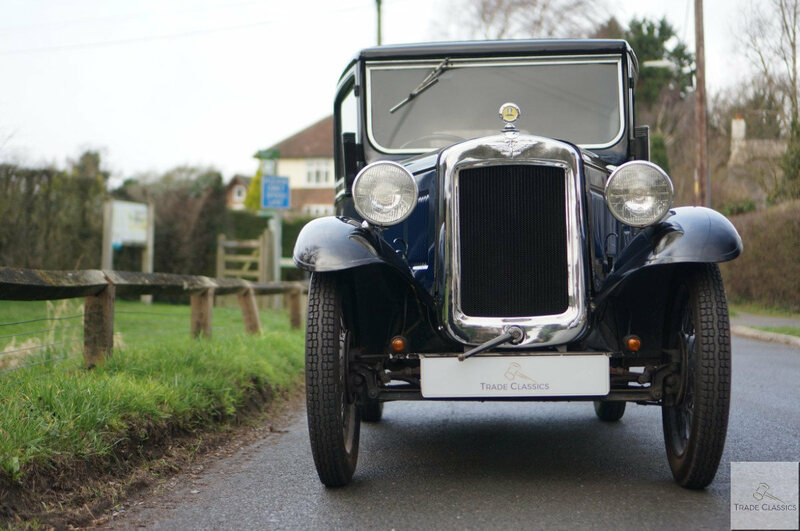 This is the oldest car I’ve consigned to date and I thoroughly enjoyed the visit and getting to know the little classic with it’s family (David, Neil and Louise). 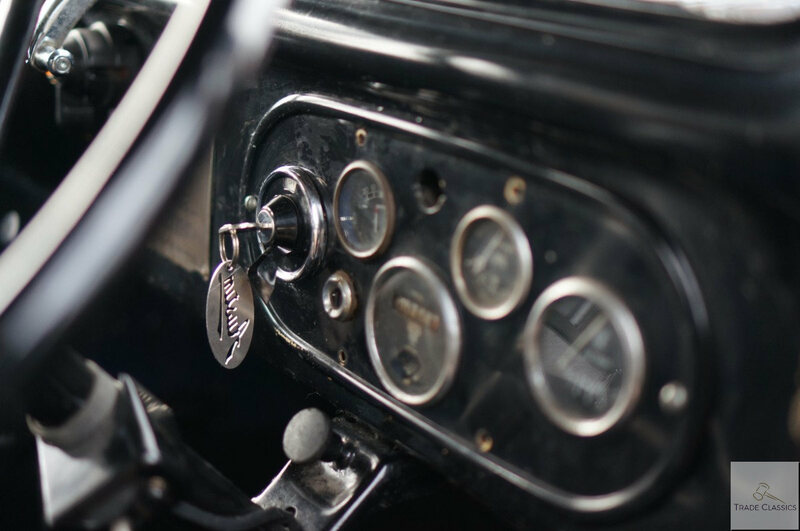 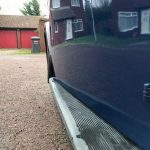 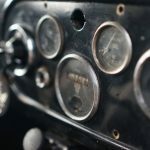 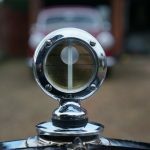 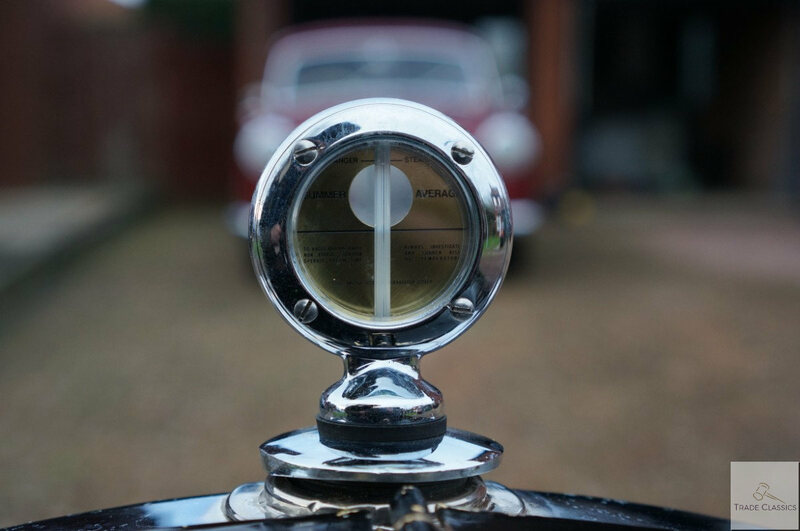 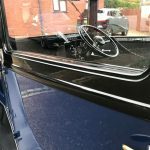 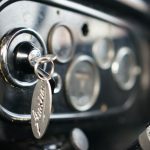 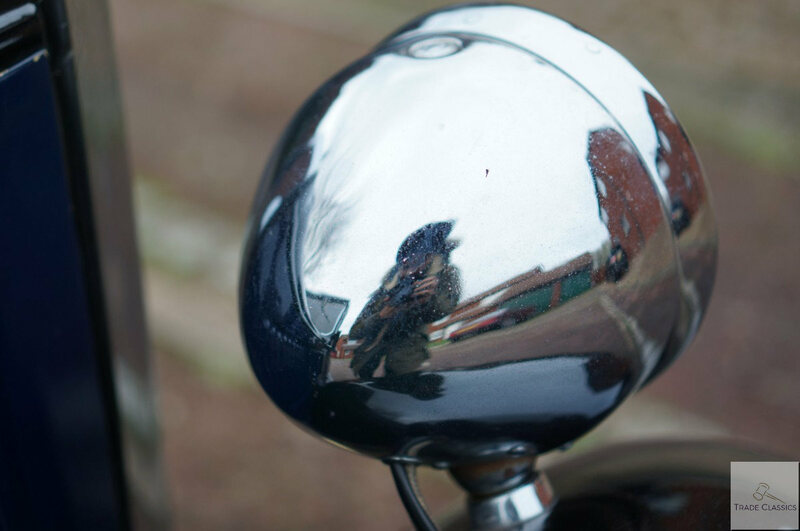 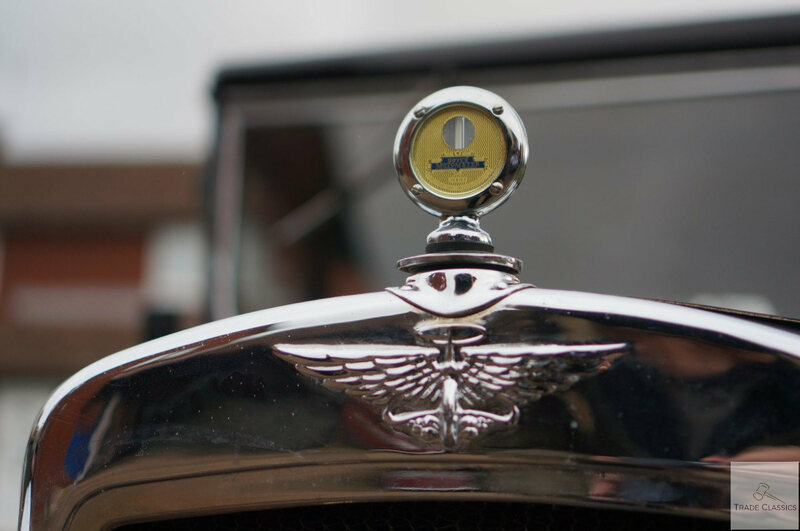 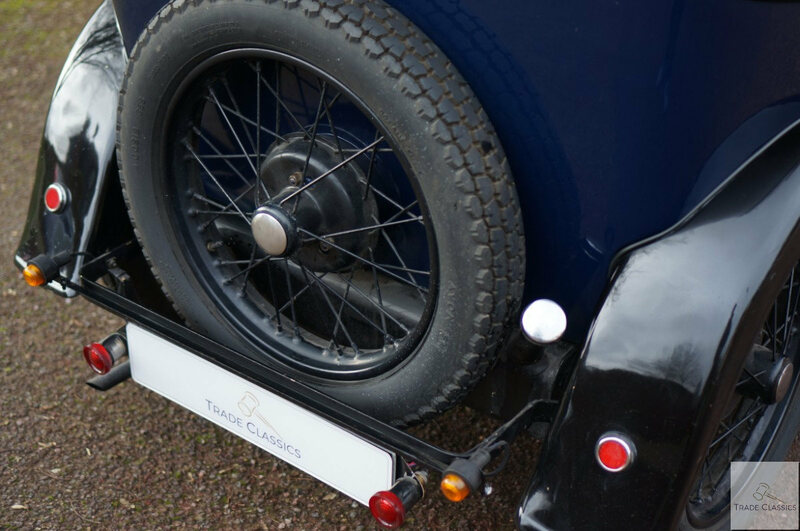 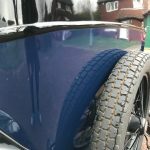 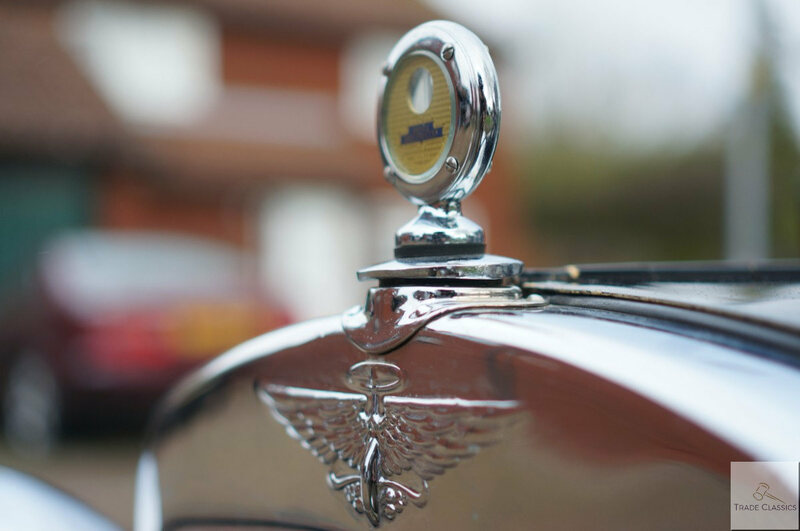 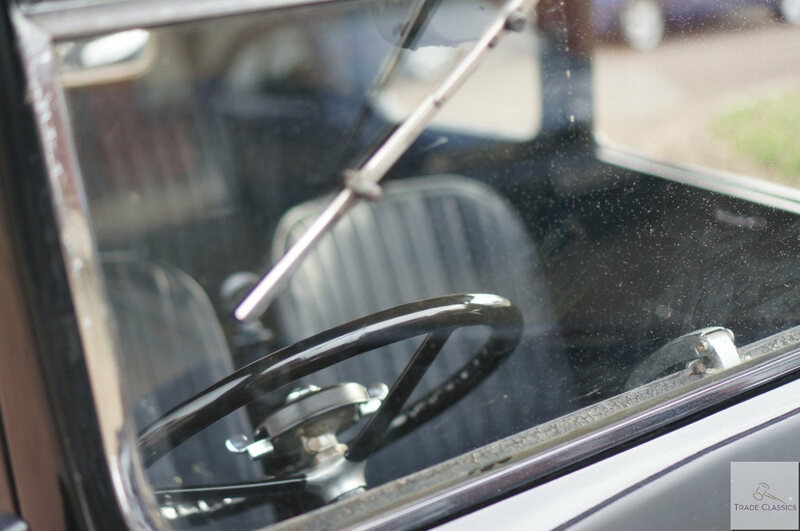 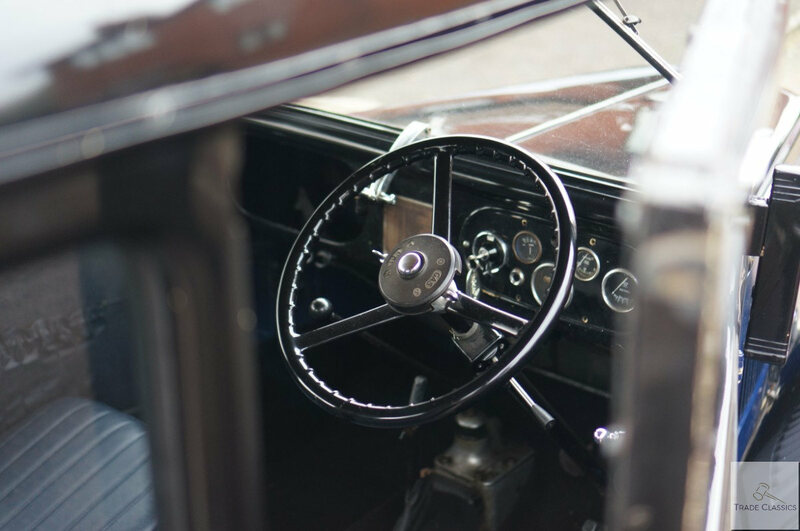 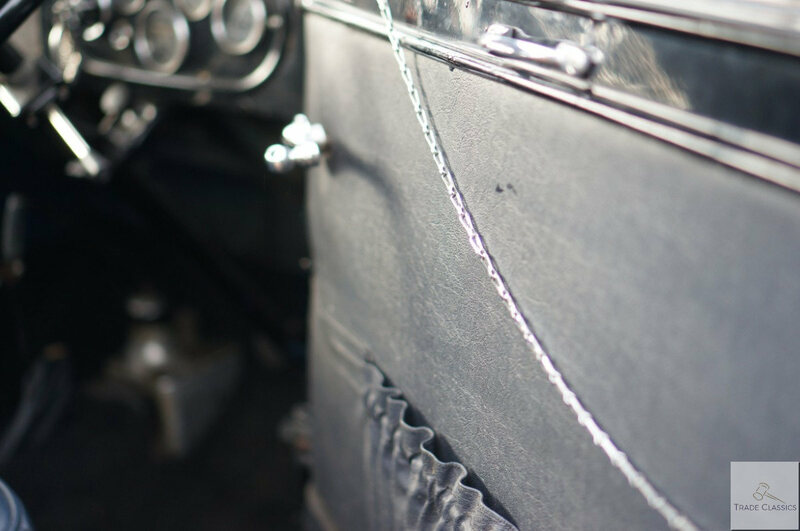 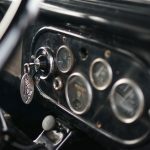 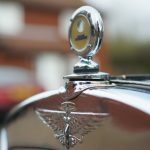 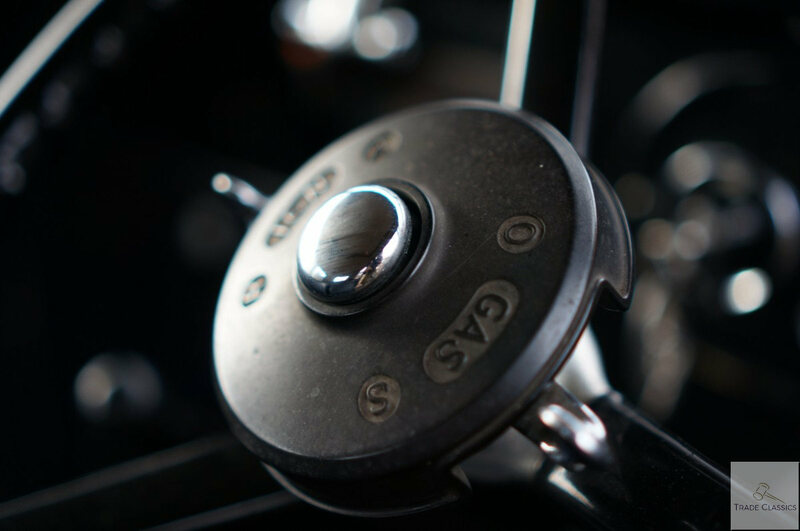 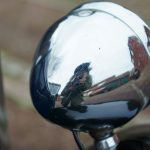 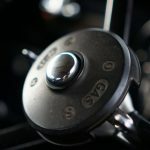 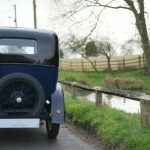 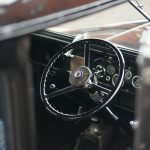 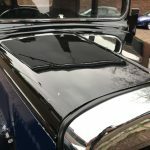 It’s clear the car has been loved and enjoyed over the years and isn’t that what classic car ownership is all about. 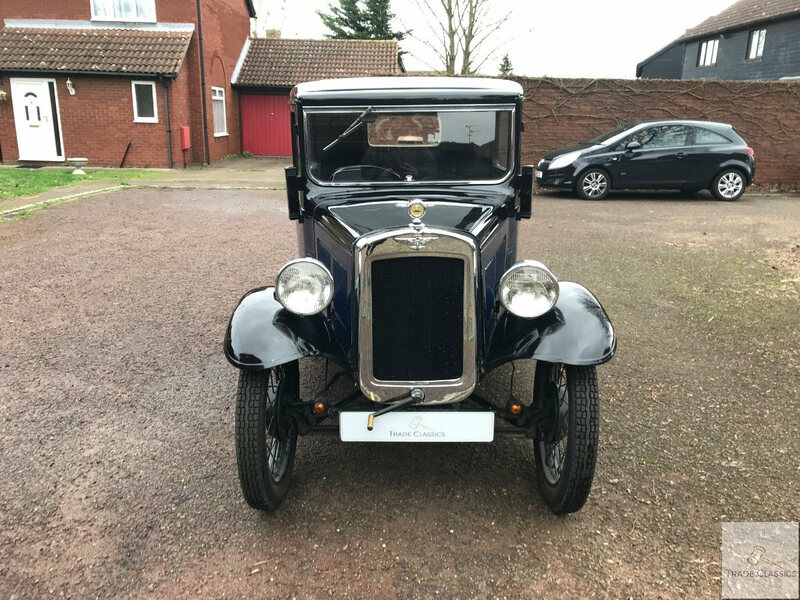 It’s sometimes sad when things move on, but it’s a part of life and this little car now needs to find its next loving owner to maintain her well into her centenary and beyond. 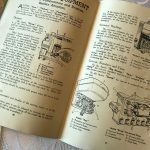 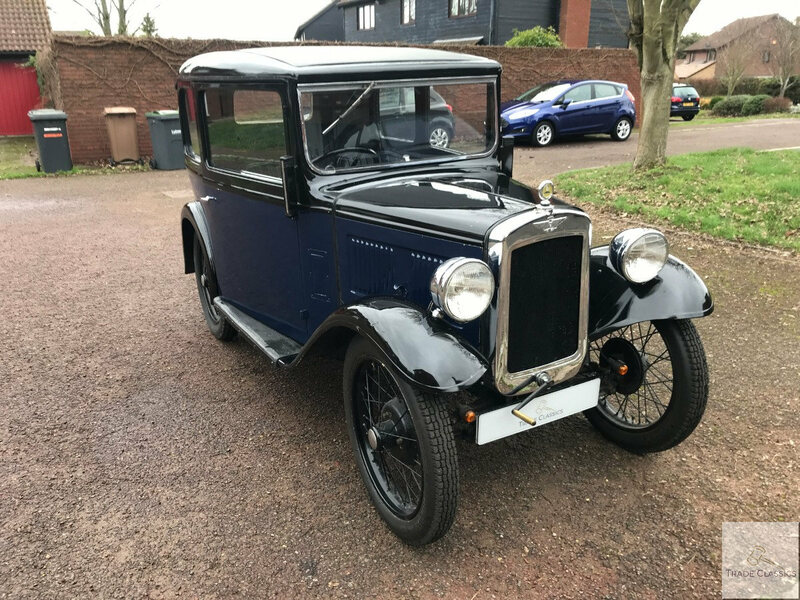 This is a car to buy with your heart and not purely for investment purposes – it’s a car to put in your garage and tinker on during a Sunday afternoon. 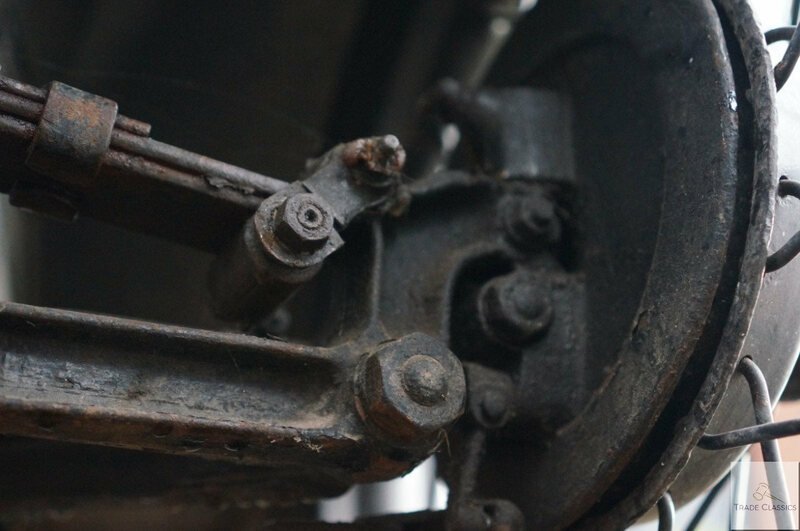 There’s no doubt she’ll frustrate you at times and cause you a few headaches but it will all be worth it. 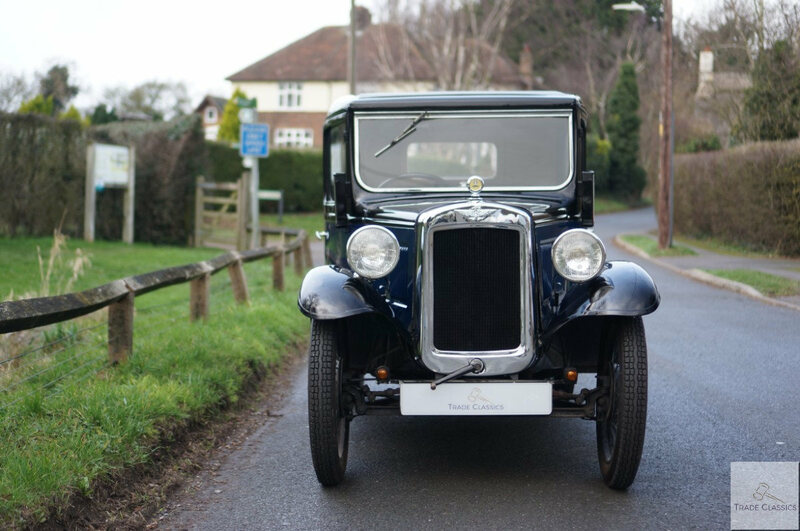 These cars shaped the cars we see on our roads today – who knows, perhaps BMW wouldn’t be around today if it wasn’t for this little car. 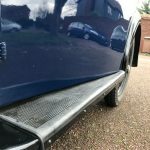 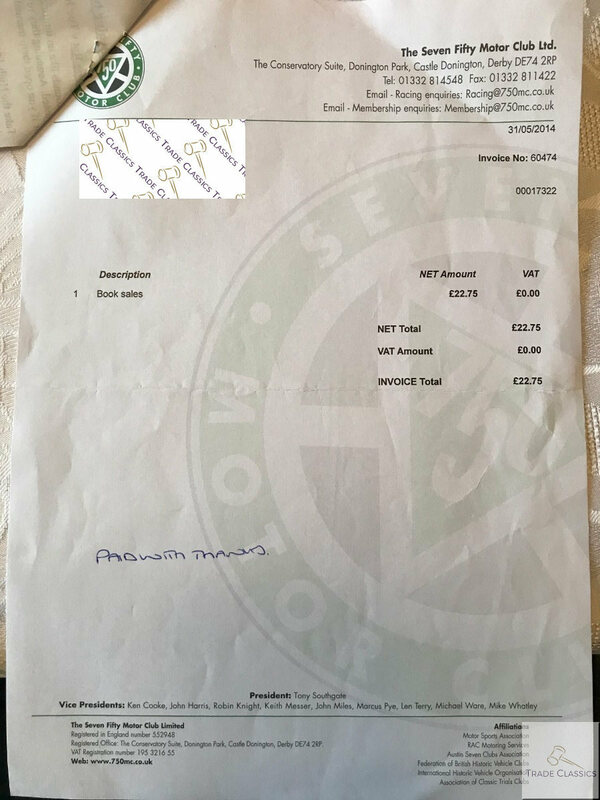 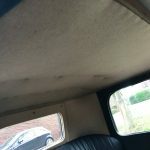 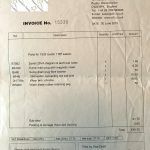 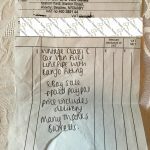 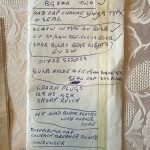 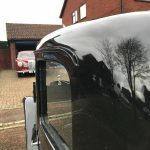 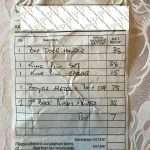 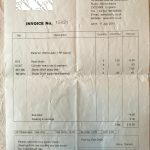 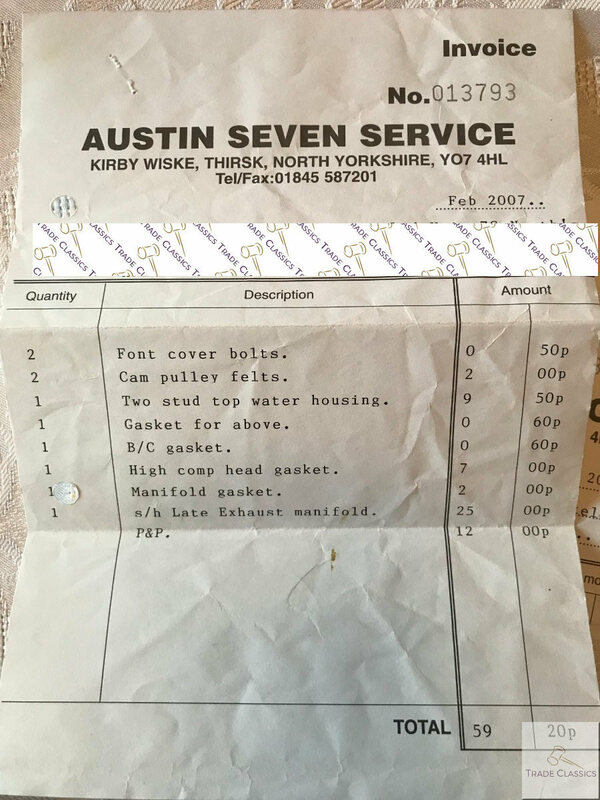 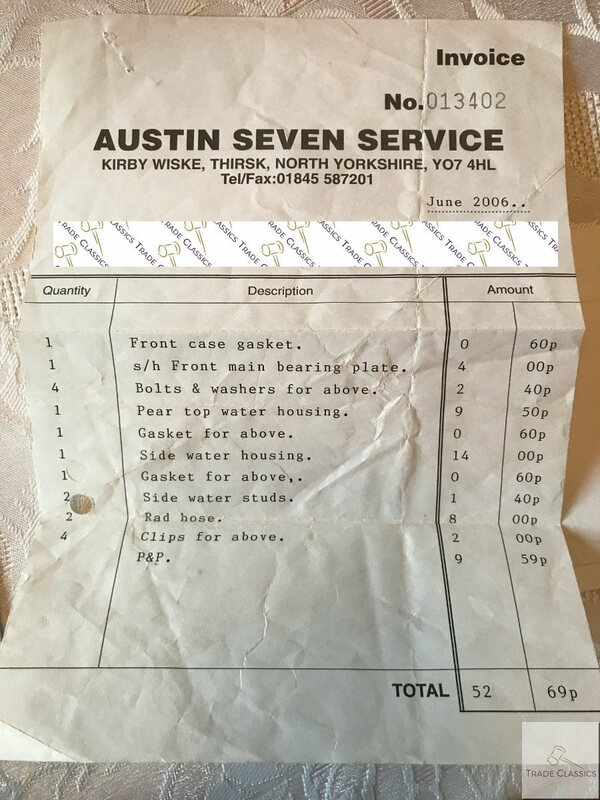 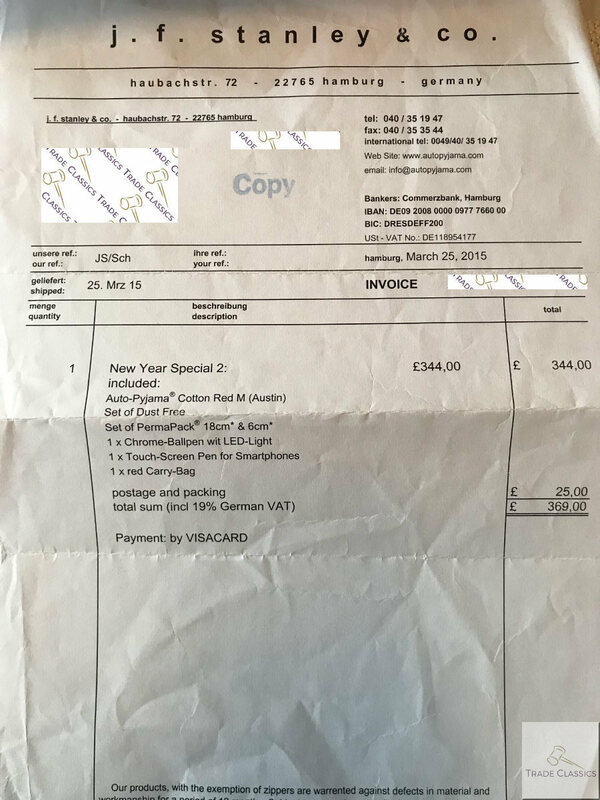 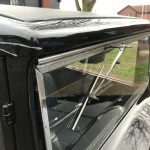 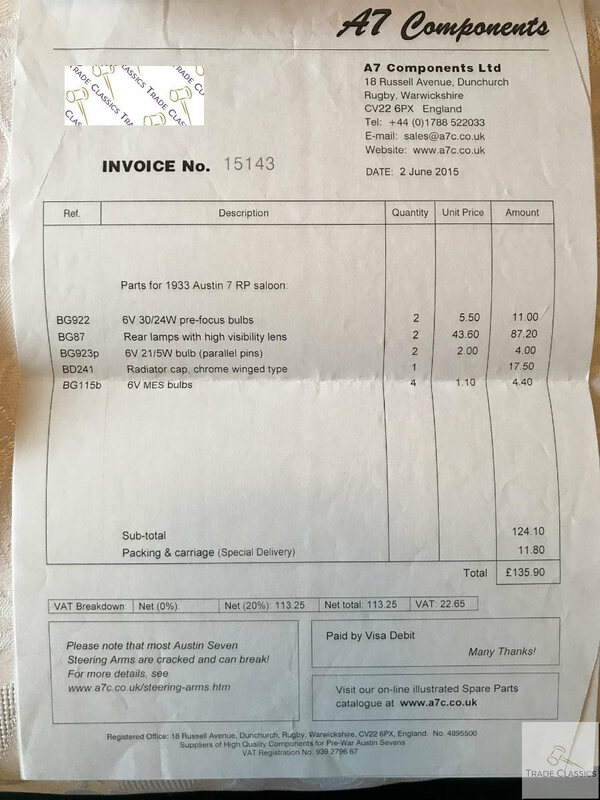 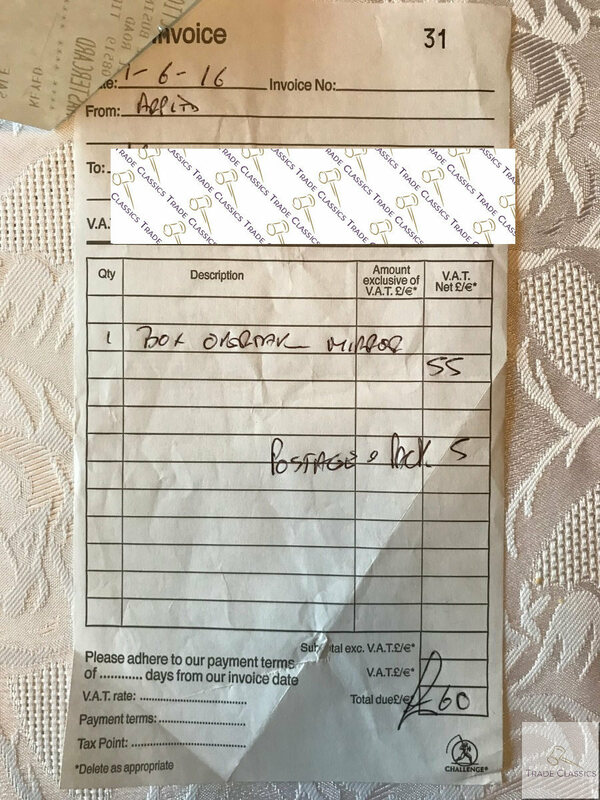 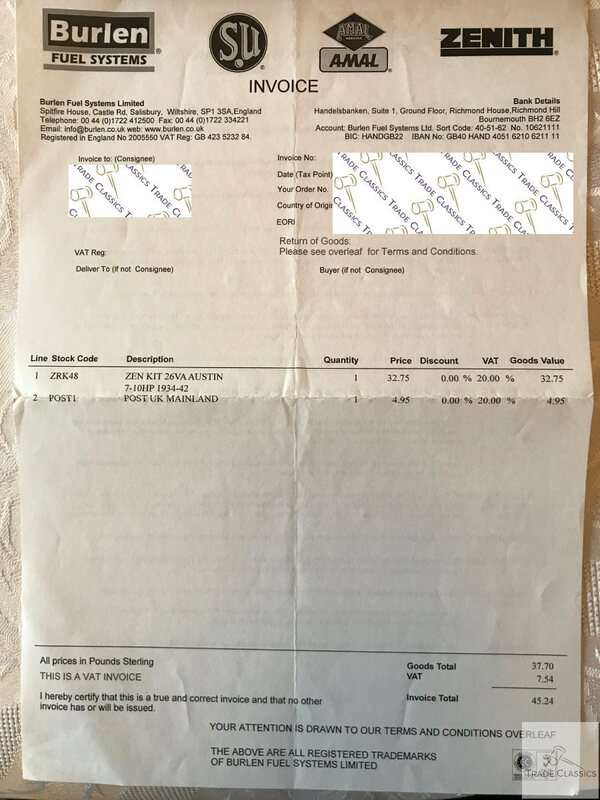 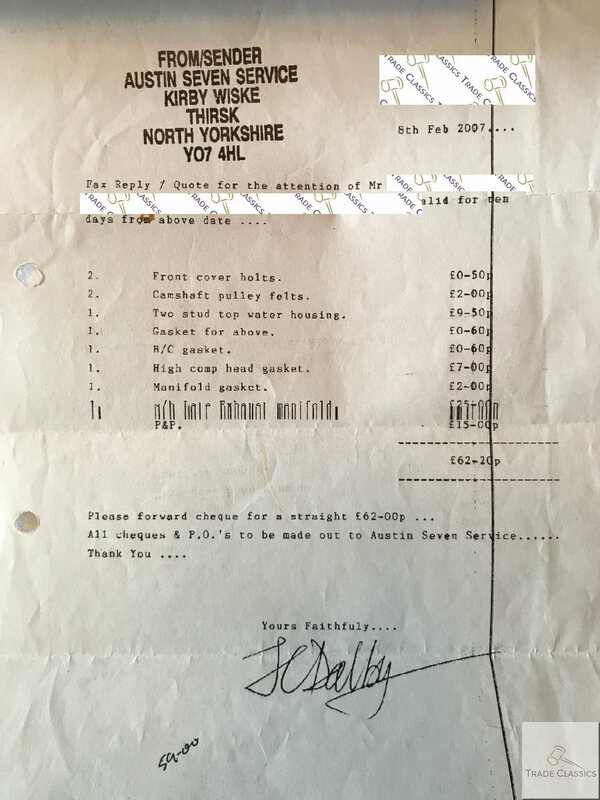 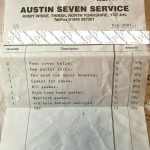 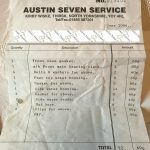 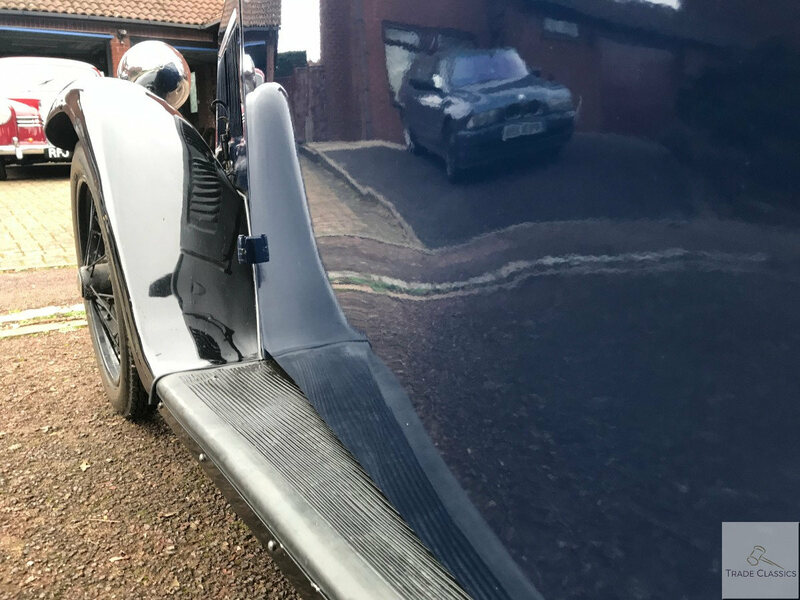 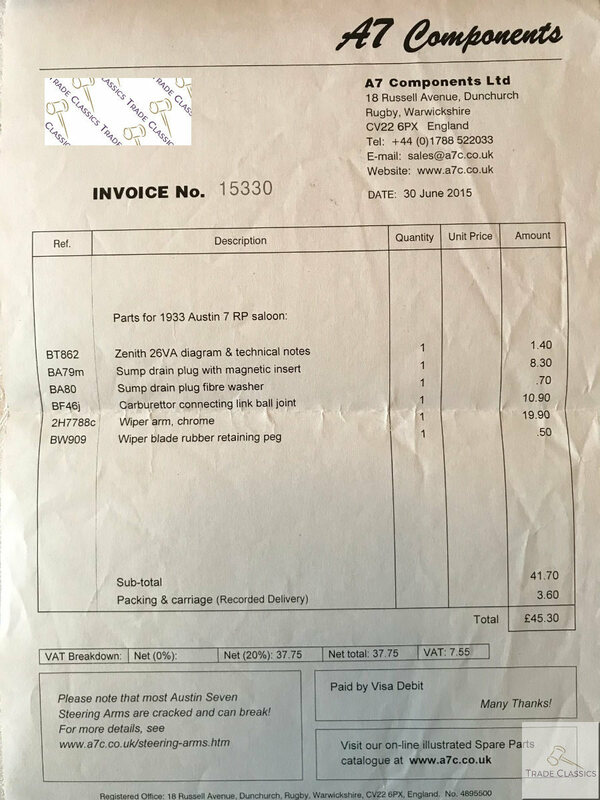 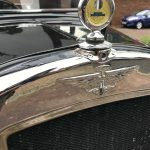 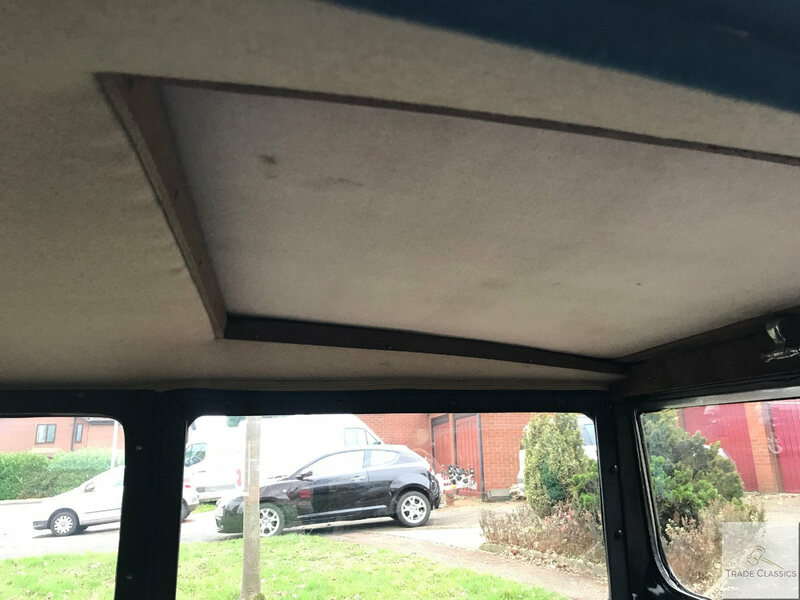 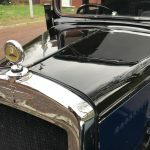 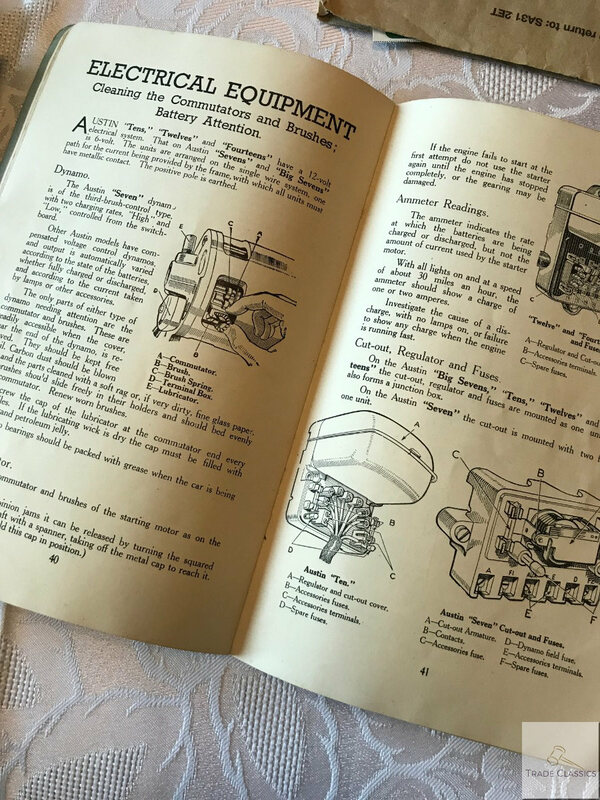 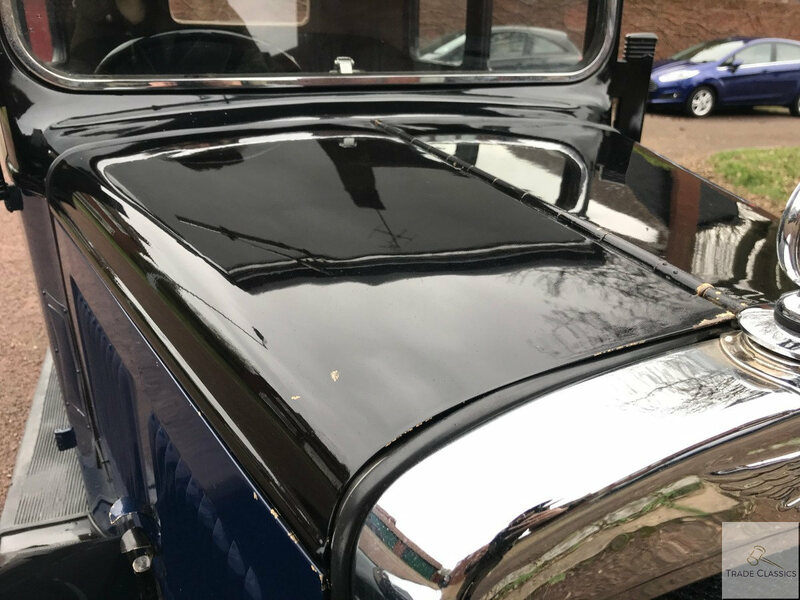 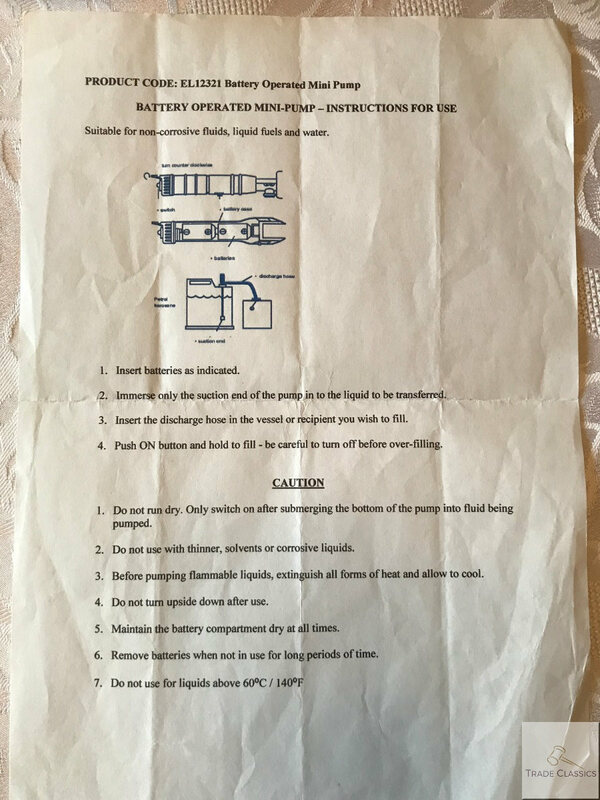 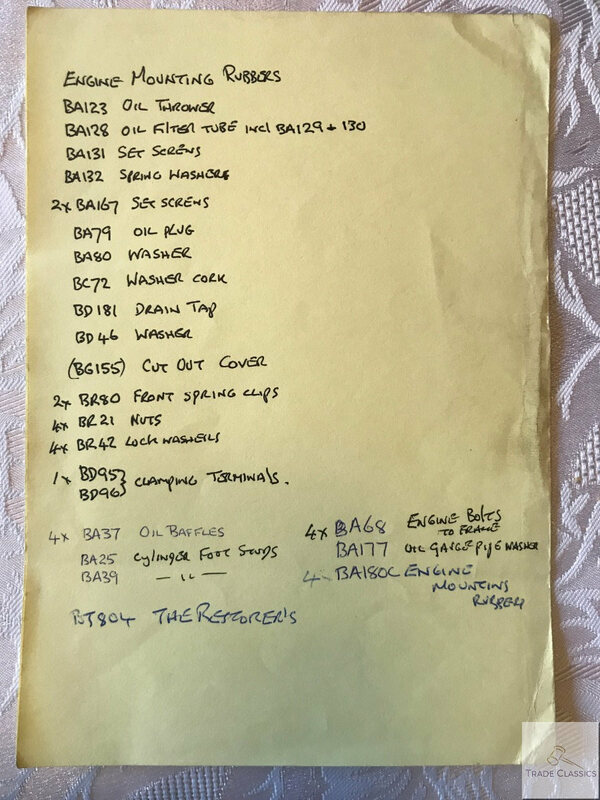 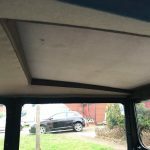 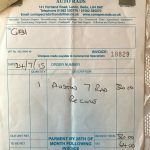 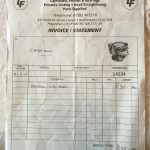 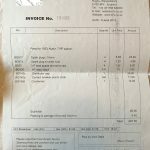 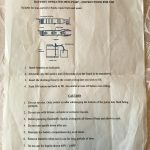 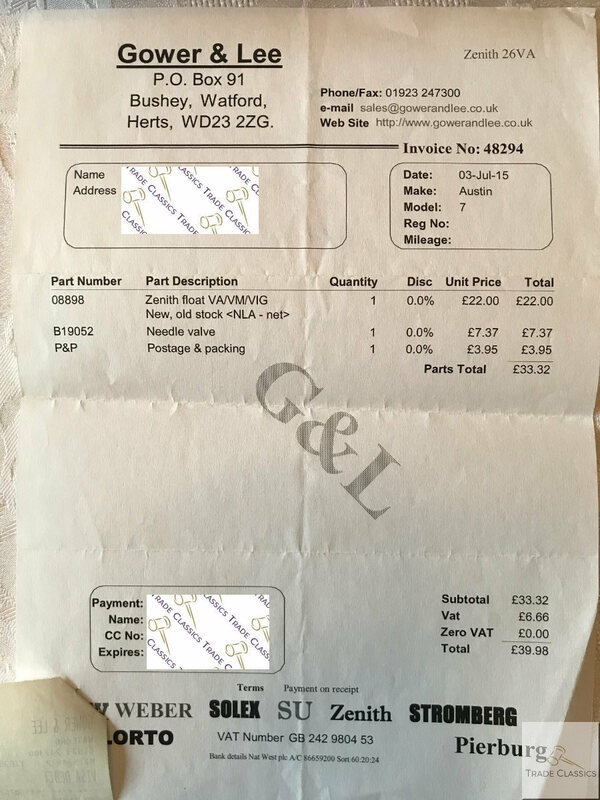 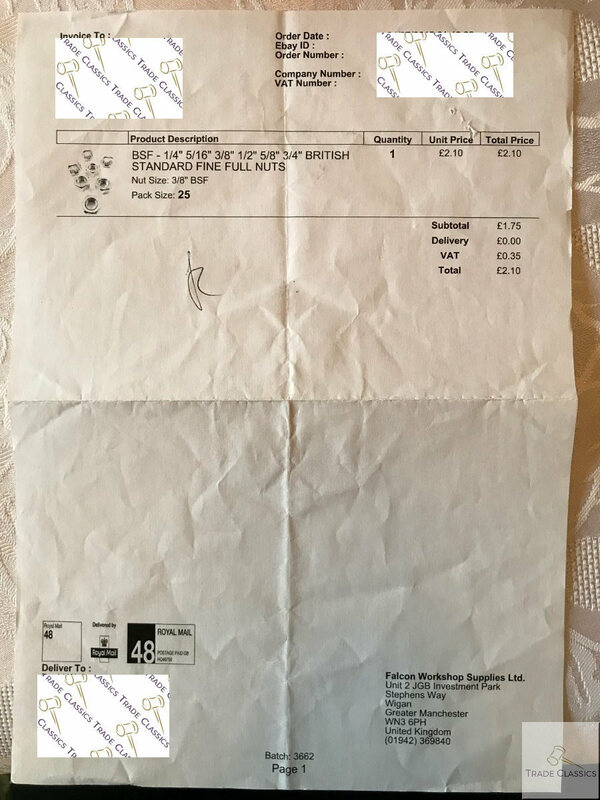 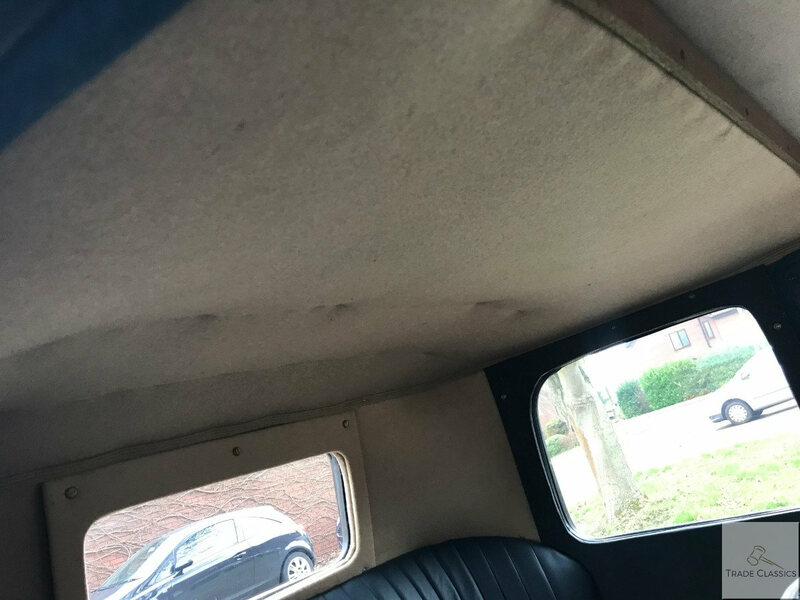 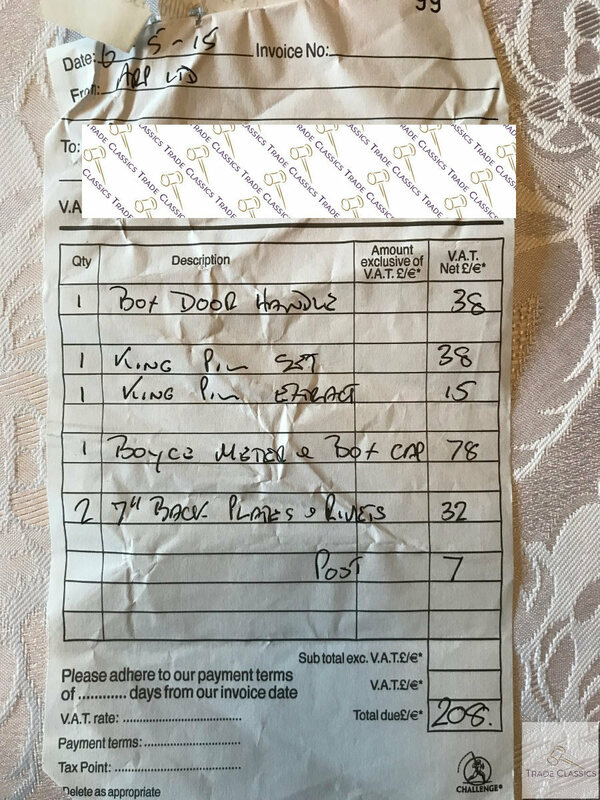 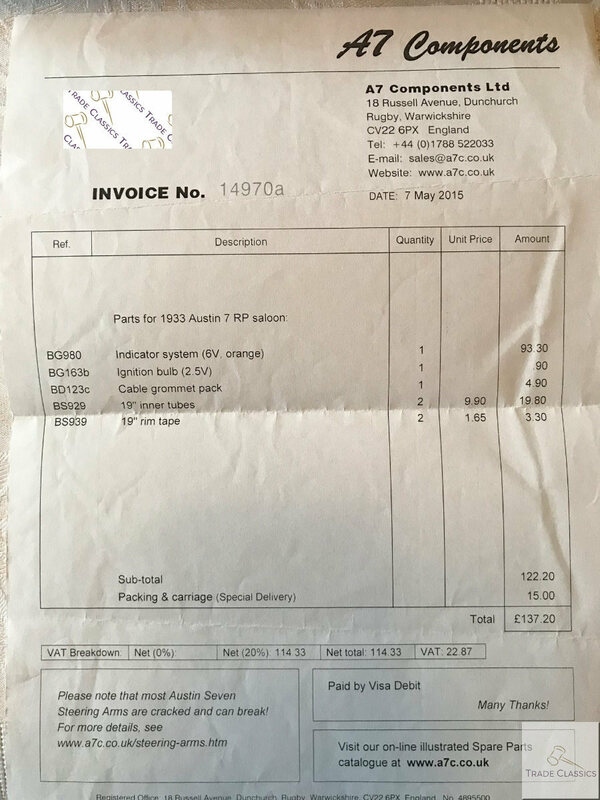 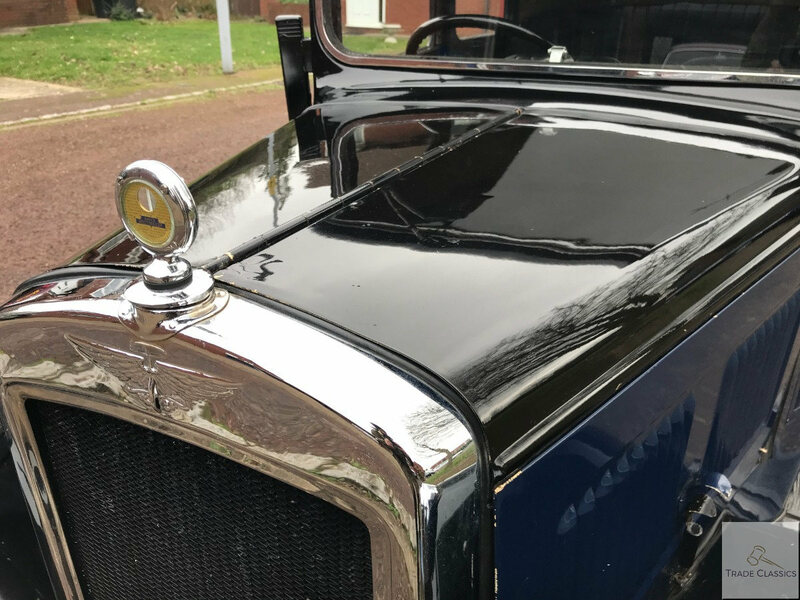 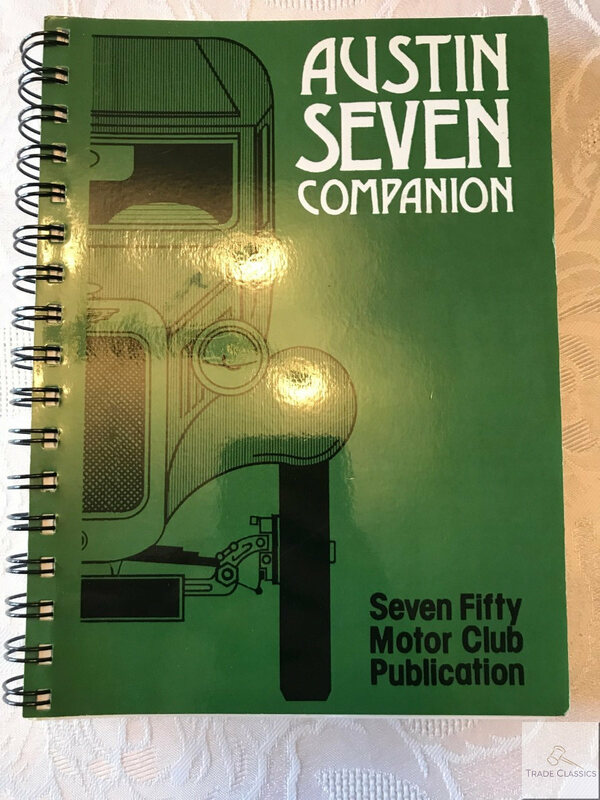 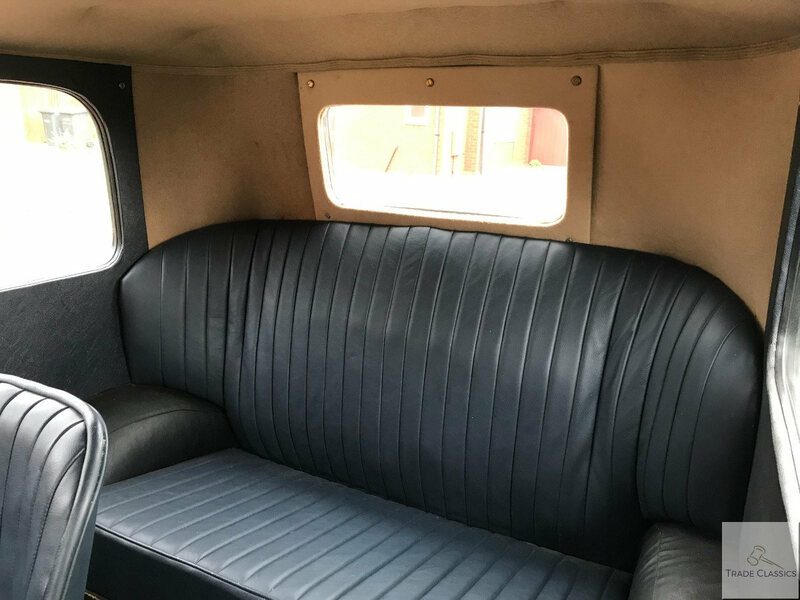 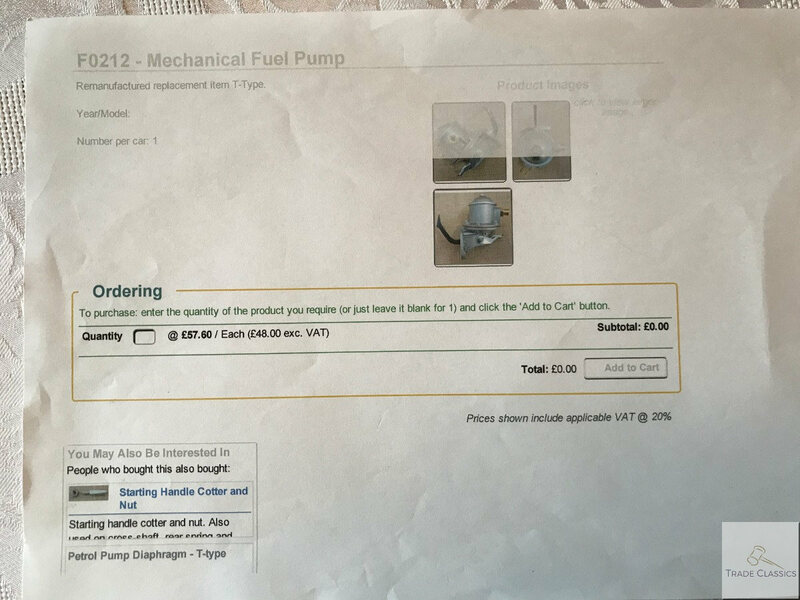 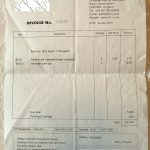 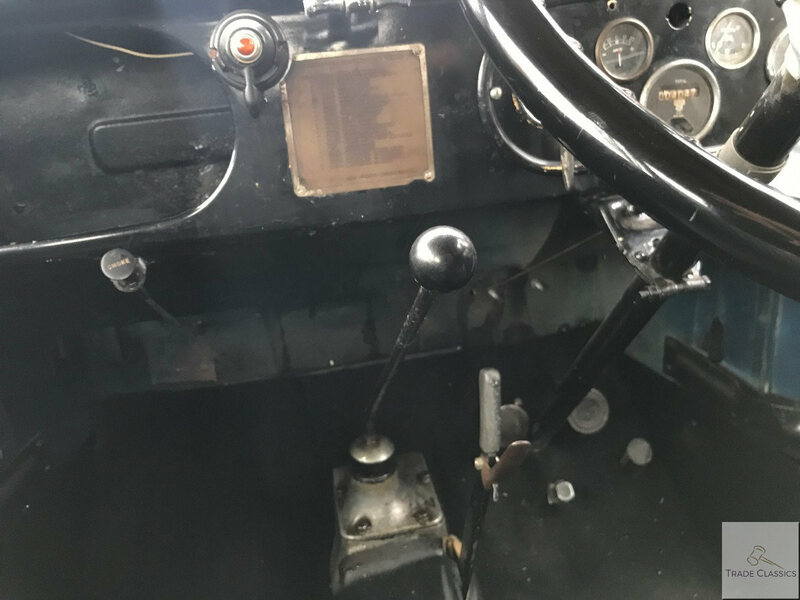 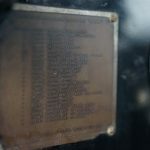 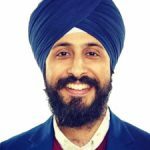 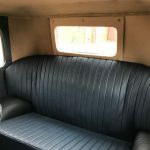 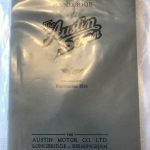 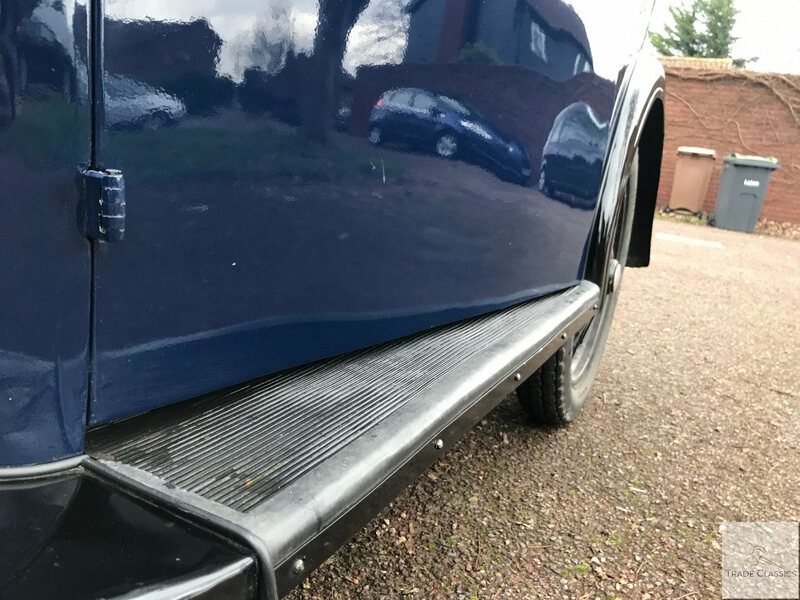 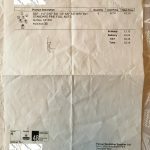 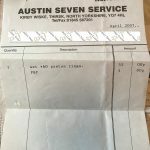 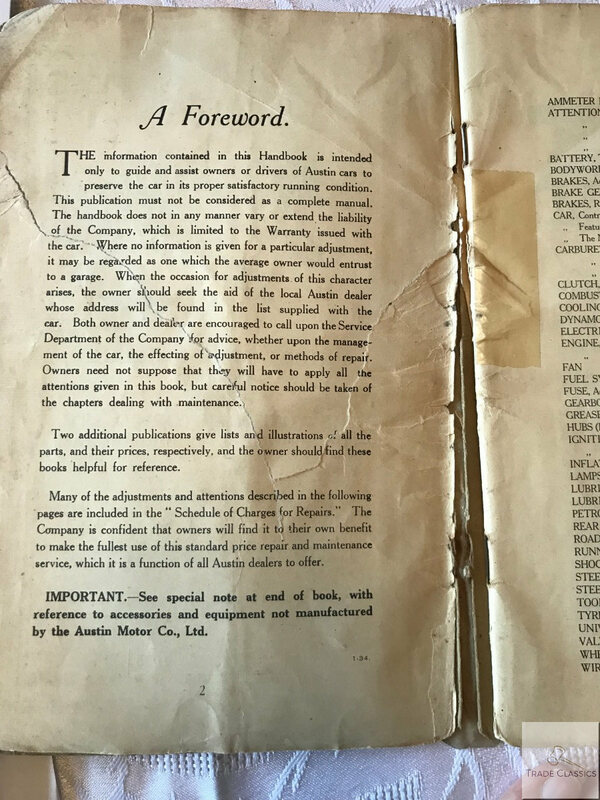 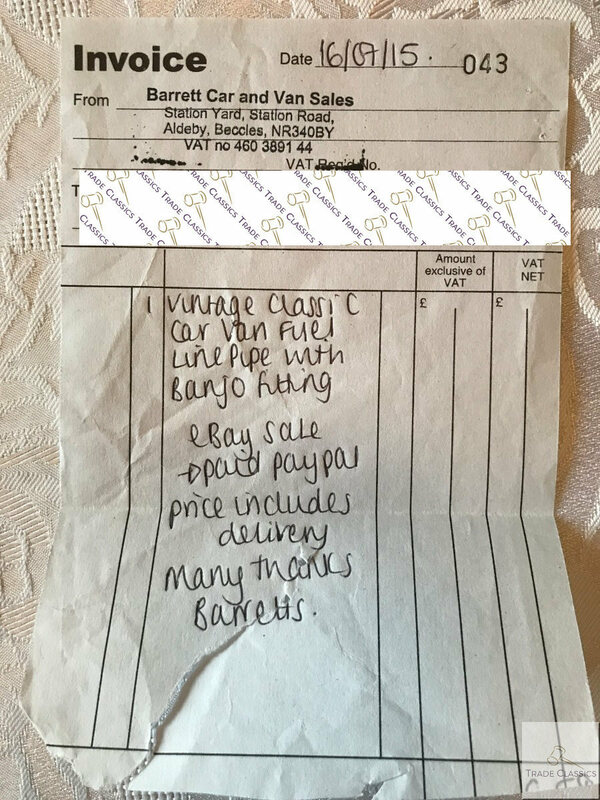 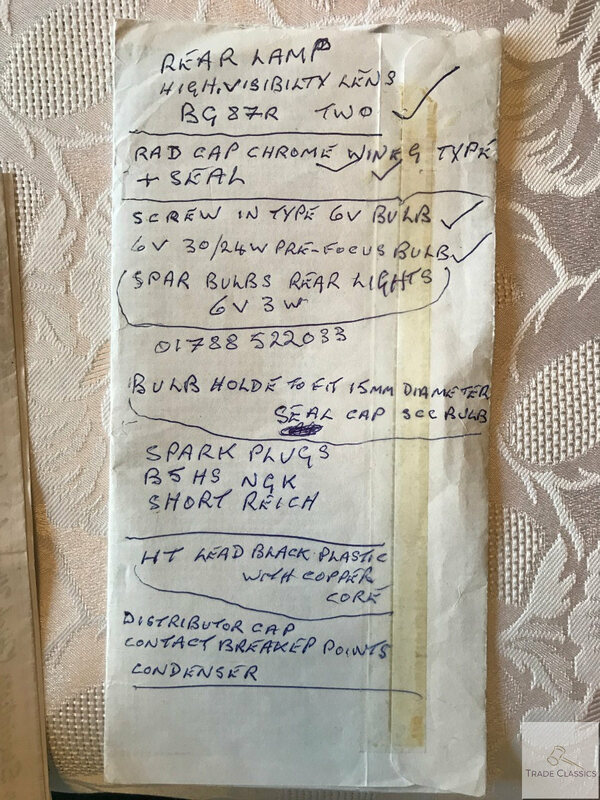 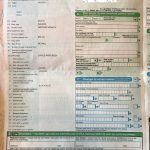 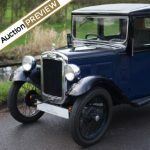 This auction listing was written by Kulraj Singh Salh from information gained from David, Neil and Louise the owners, and having visited and photographed the vehicle. 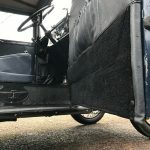 If you have any specific questions about the vehicle then please use the comments section below. 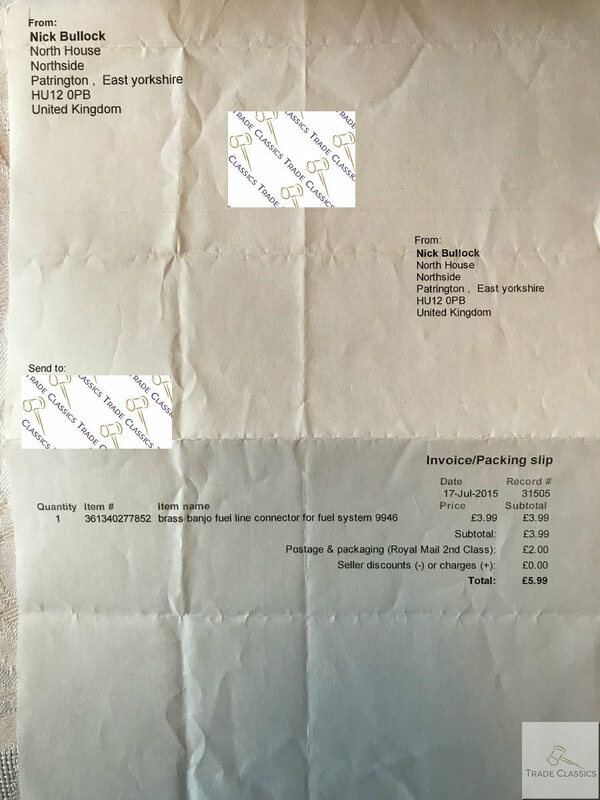 Neil will receive a notification and will reply as soon as he can. 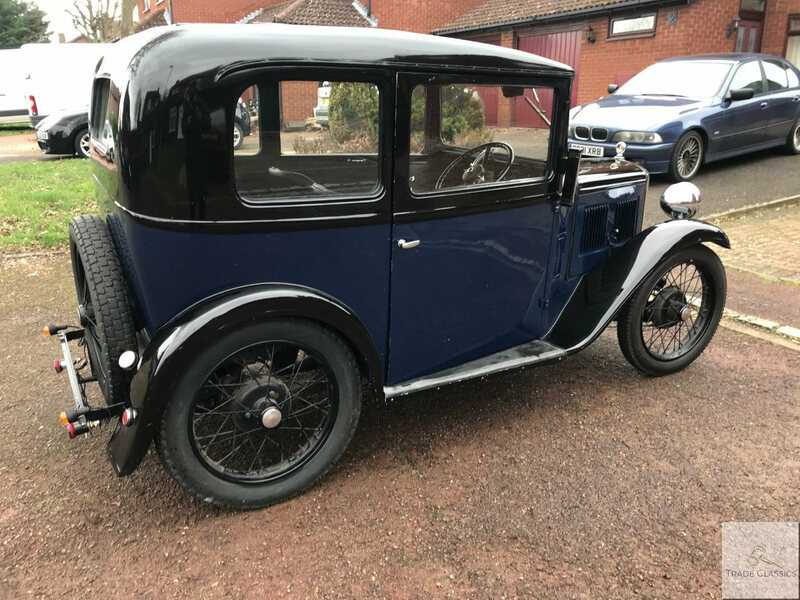 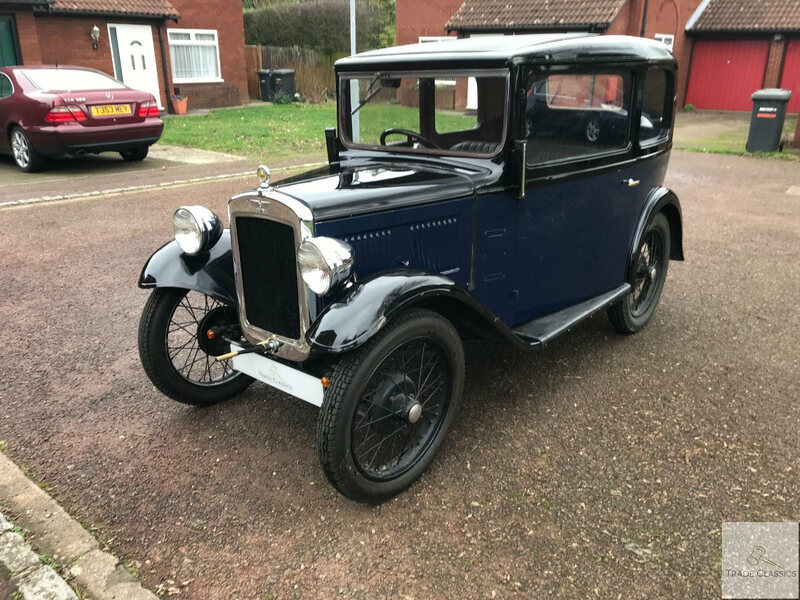 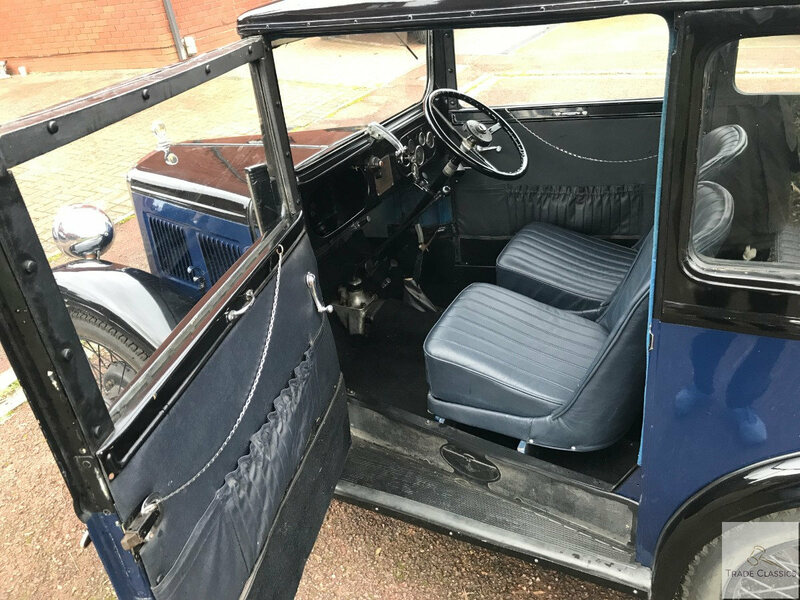 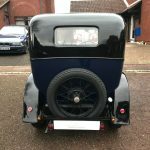 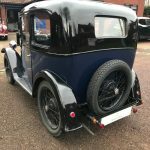 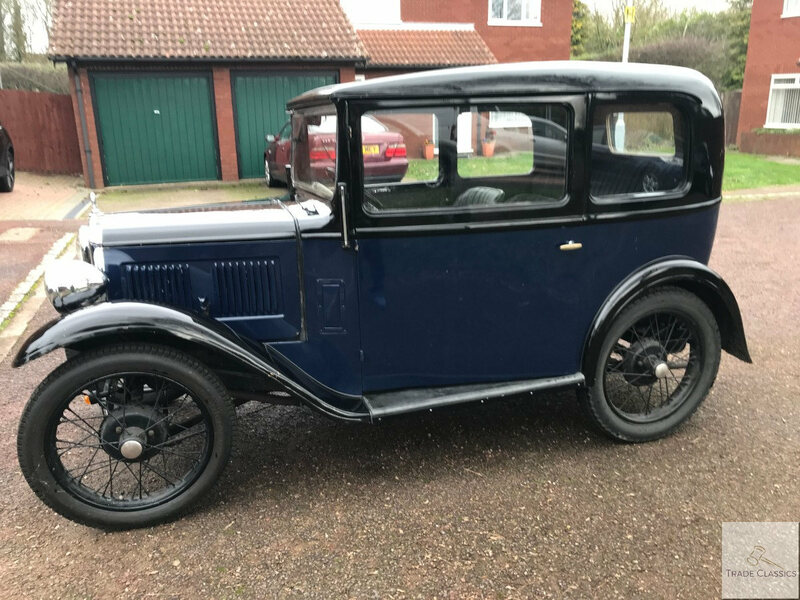 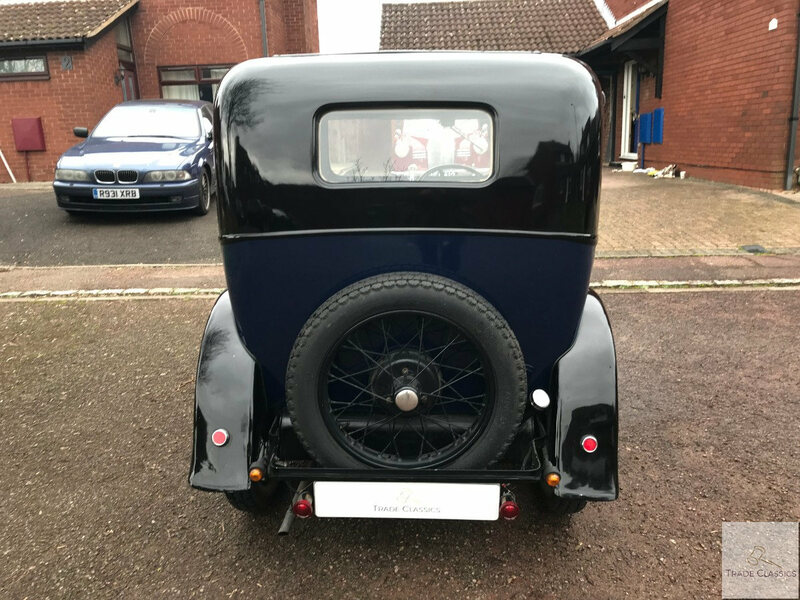 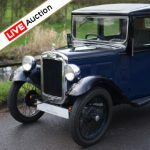 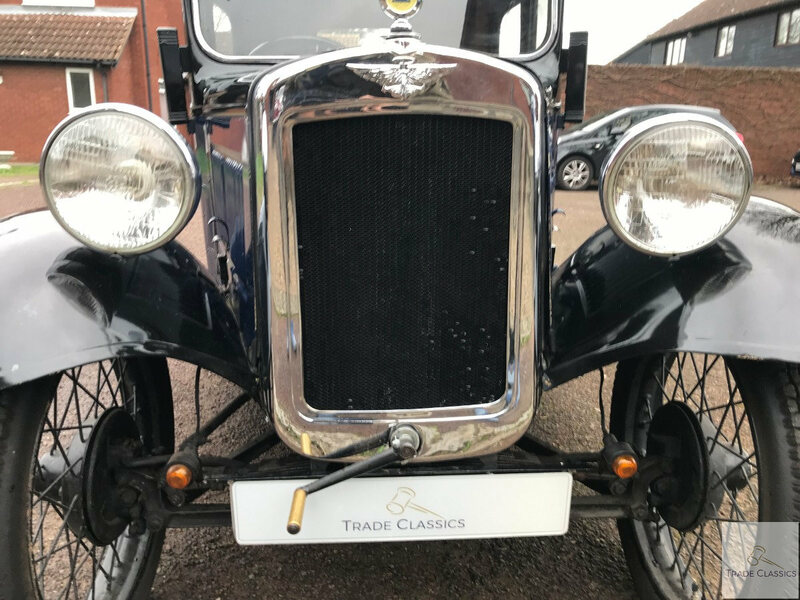 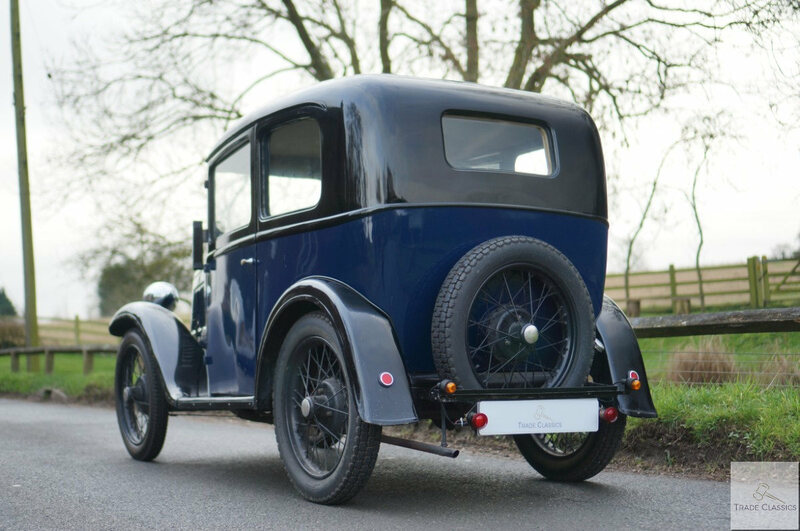 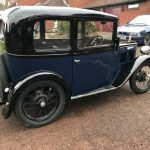 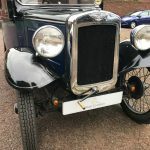 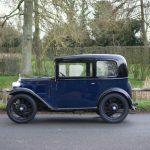 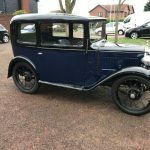 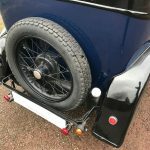 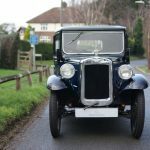 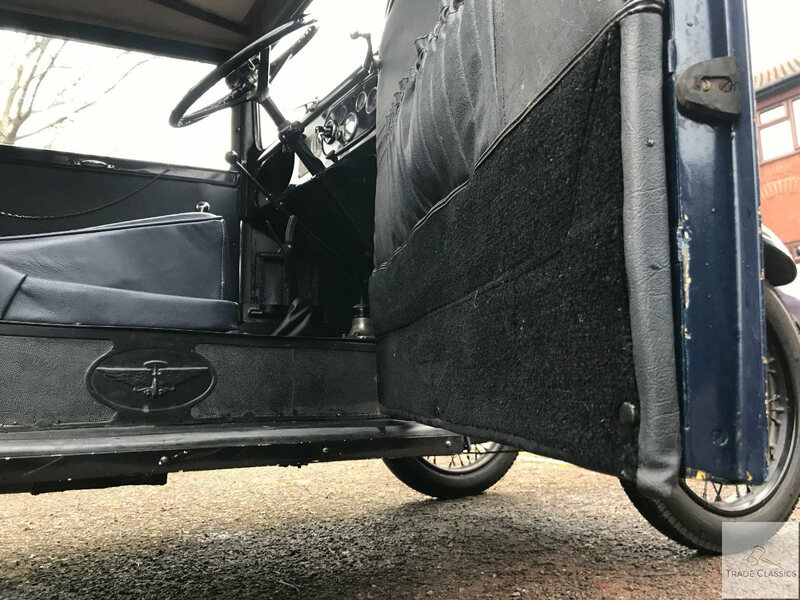 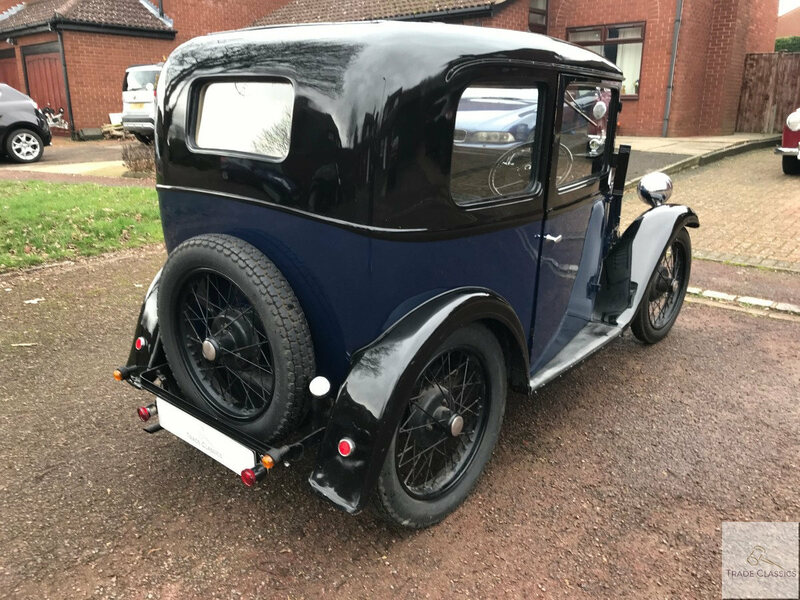 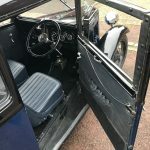 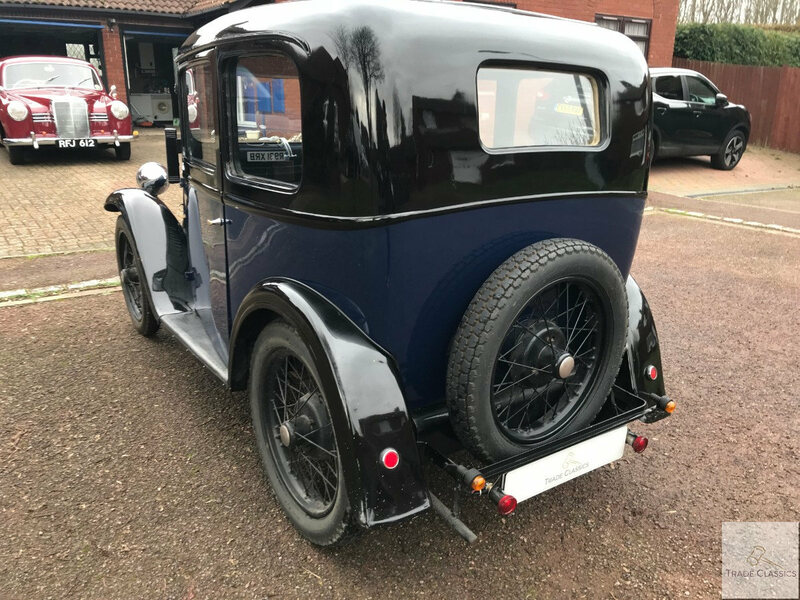 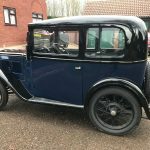 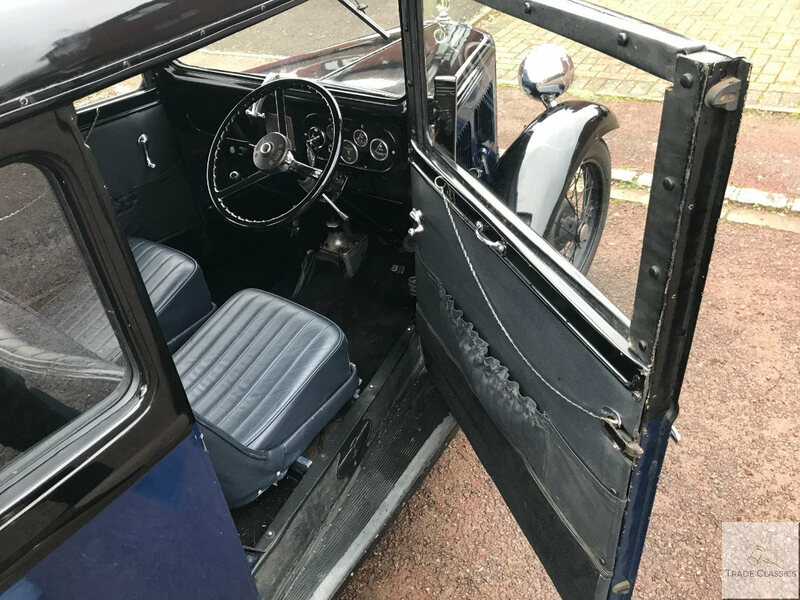 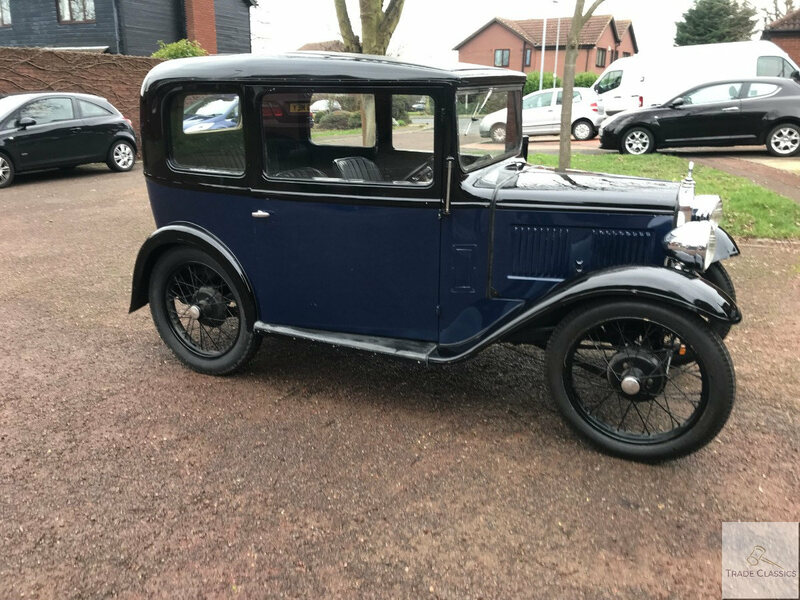 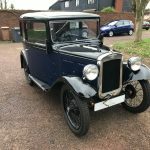 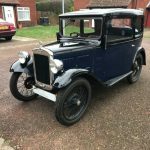 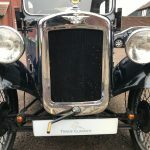 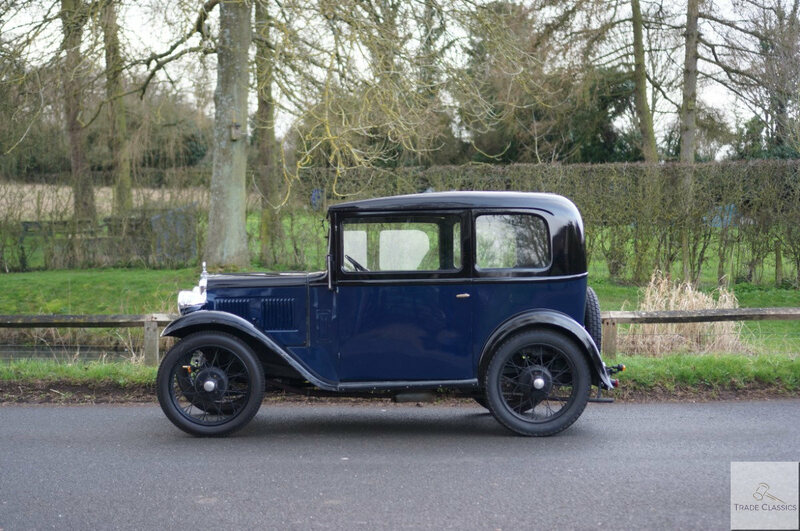 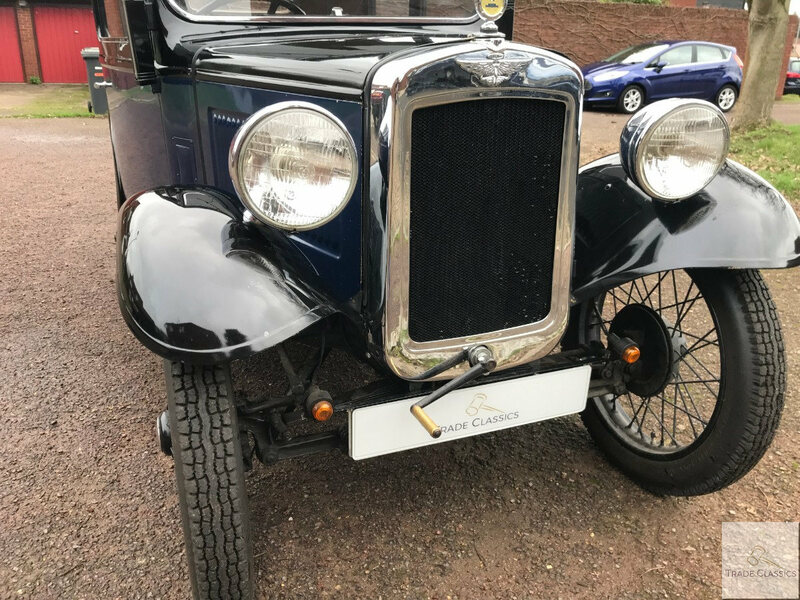 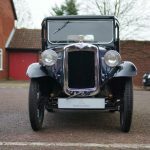 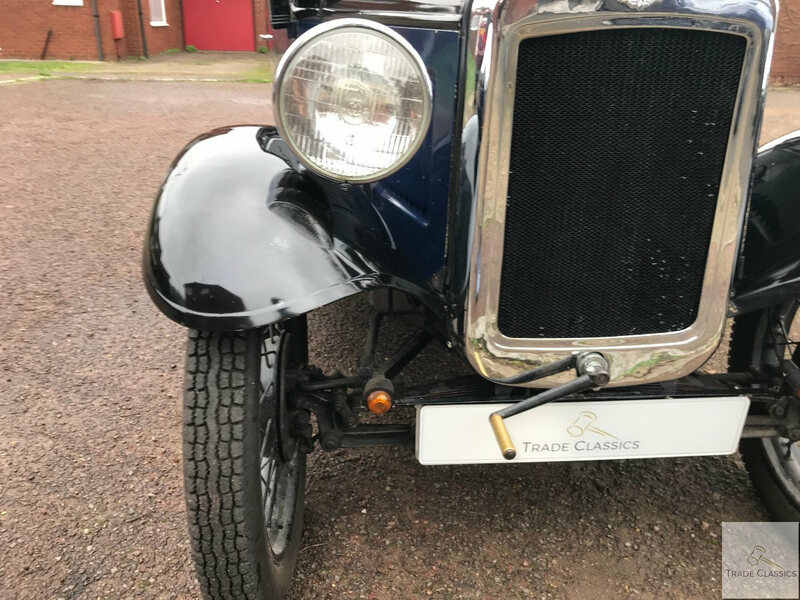 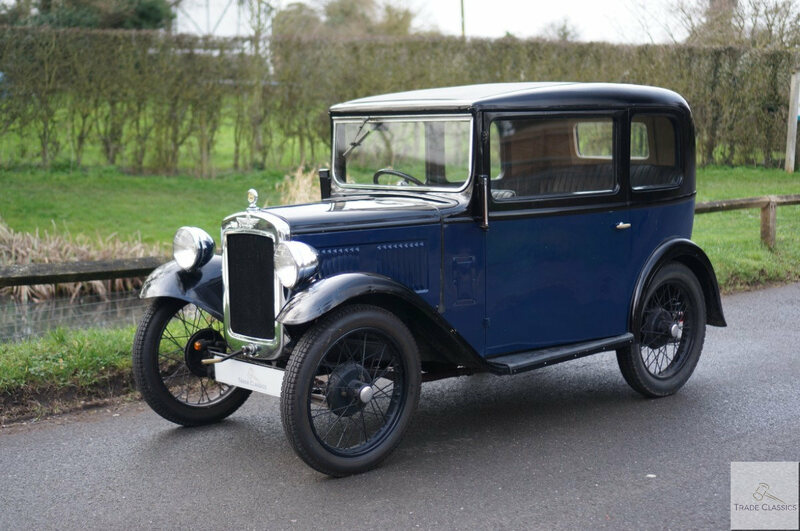 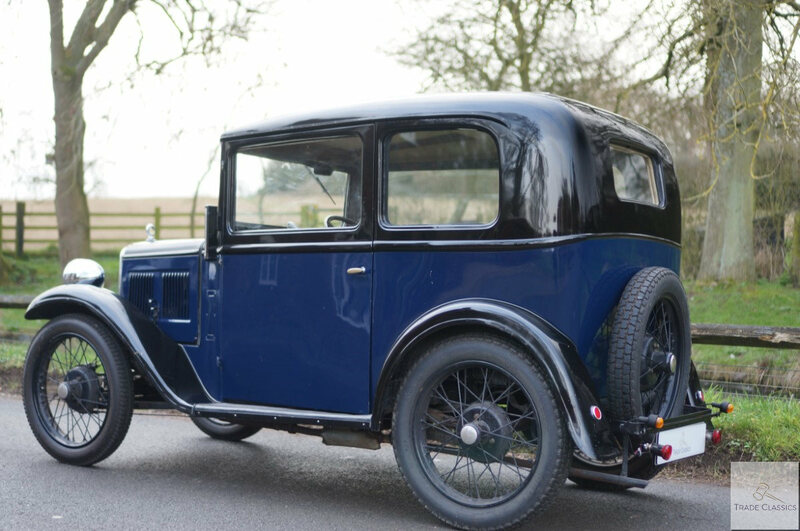 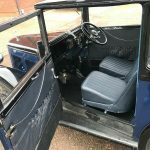 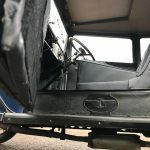 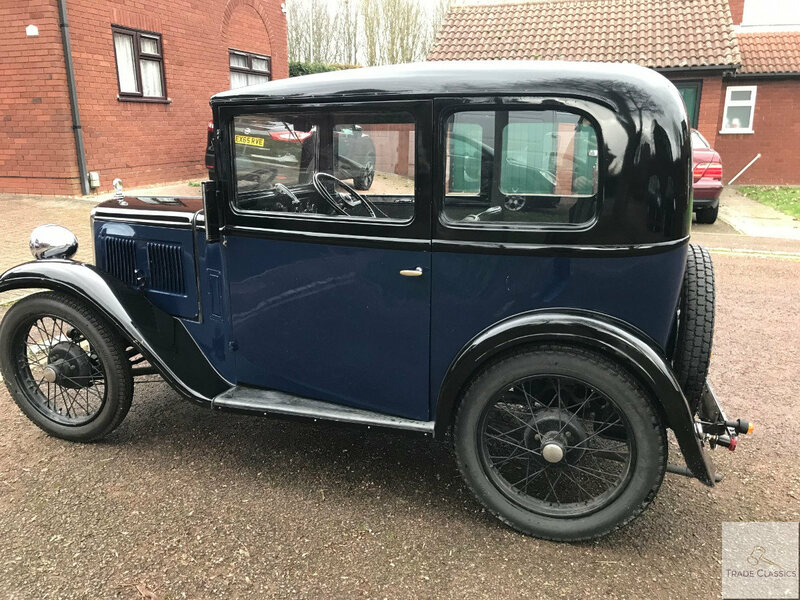 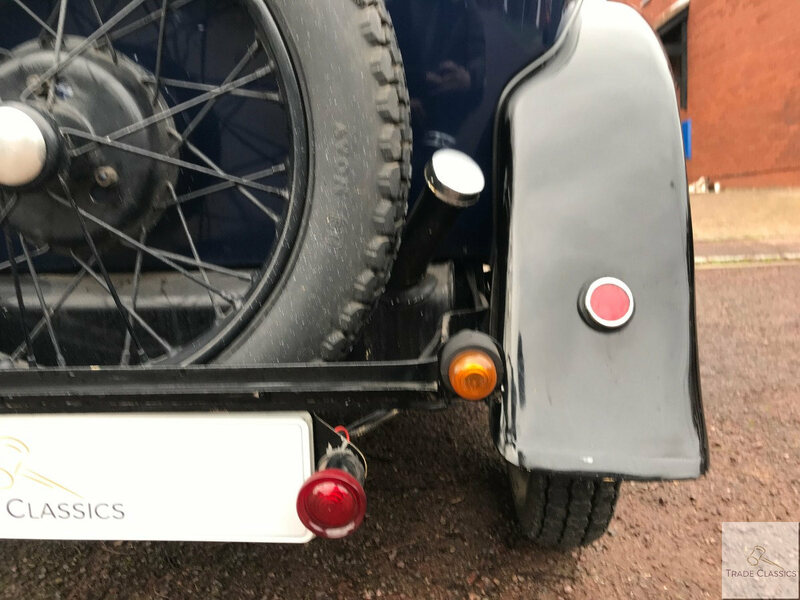 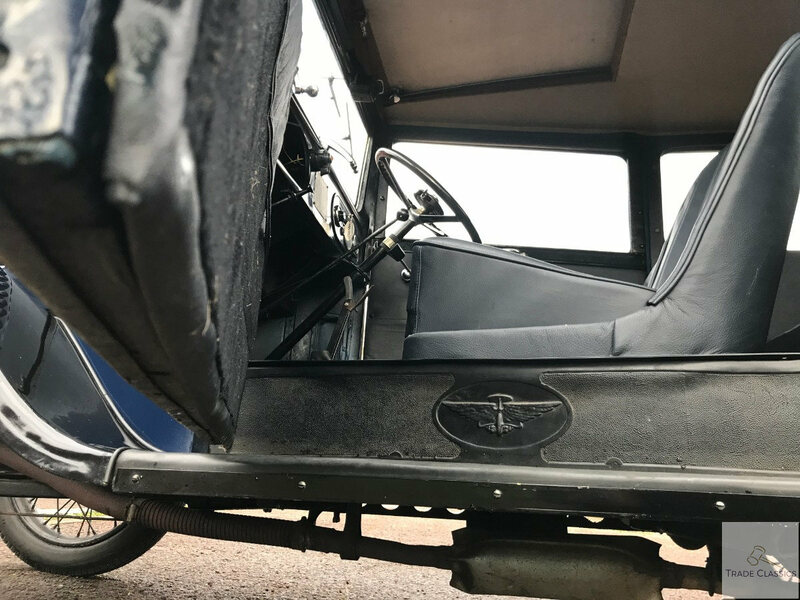 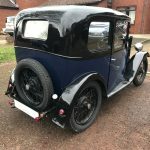 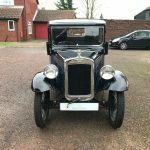 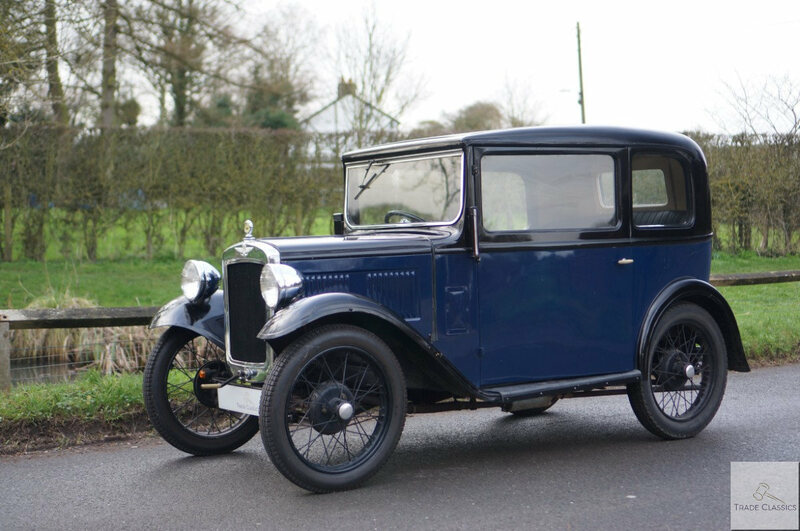 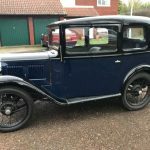 Auction now live on this lovely little Austin 7 that’s looking for a new home. 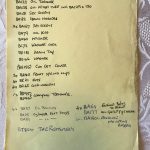 If you have any questions feel free to post them here, and along with Davids family, we are on hand to answer them.